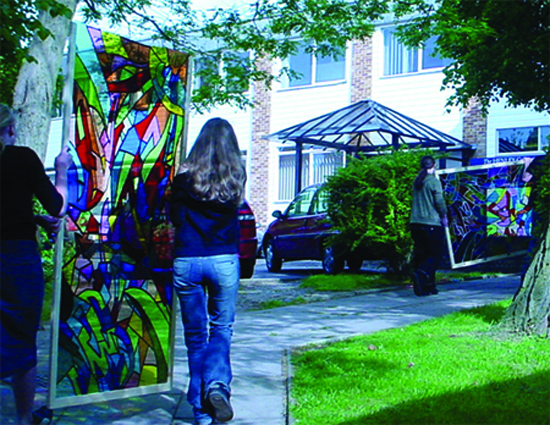 Sculpture commission – The Open Learning Centre, Bracknell, Berkshire The Centre commissioned Thinklockhart to produce an outdoor sculpture for their new building. 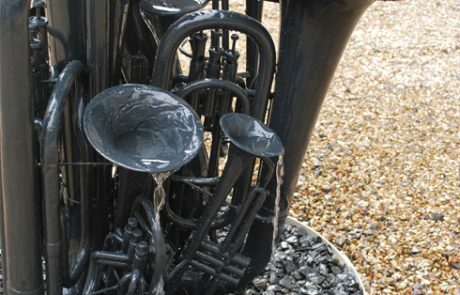 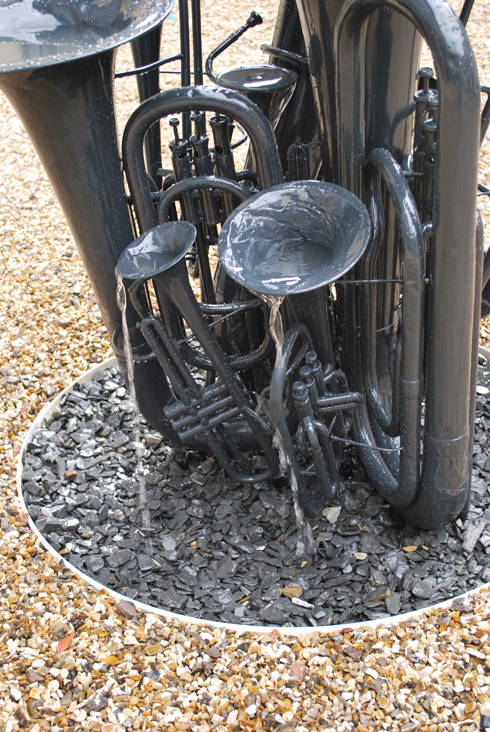 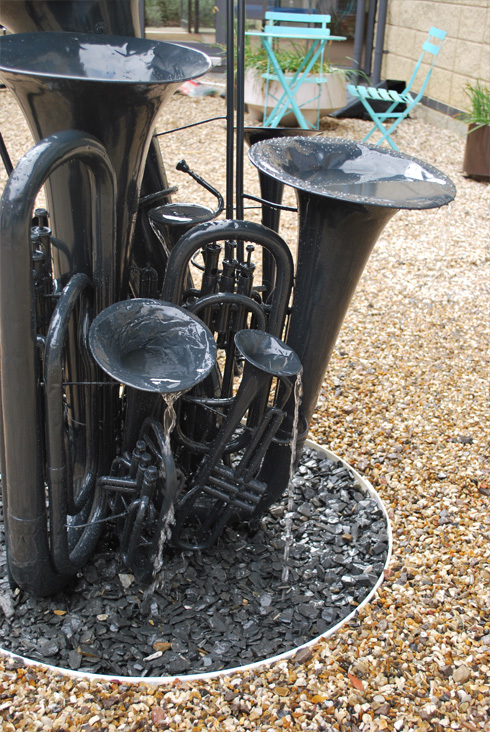 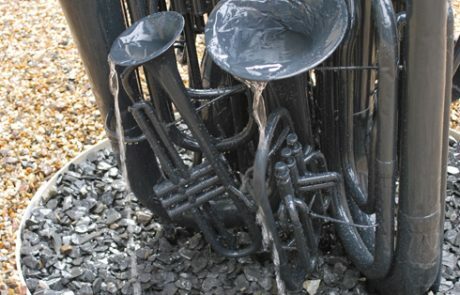 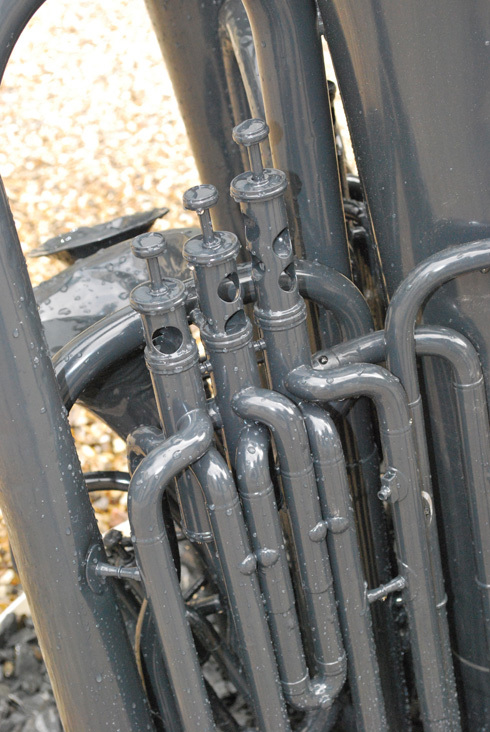 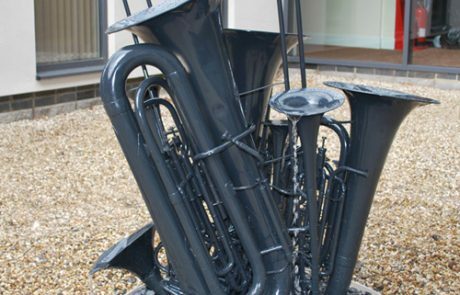 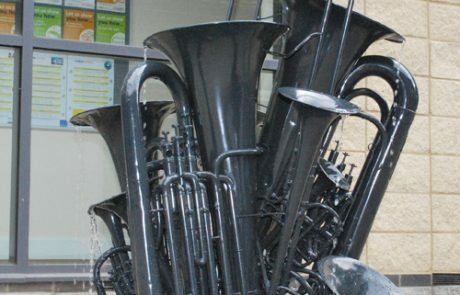 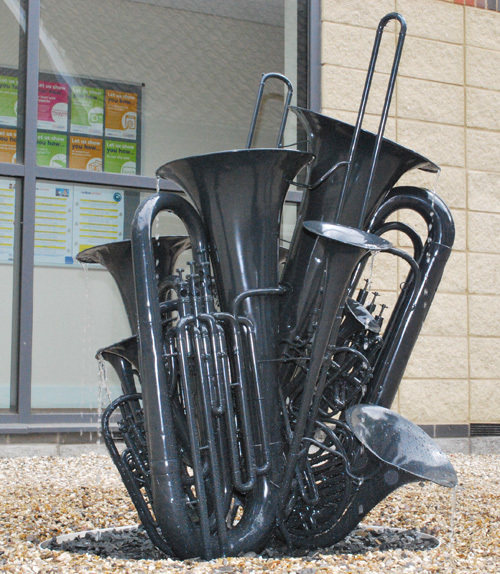 The Learning Centre is home to musicians from Berkshire Young Maestros and the sculpture was created using old brass instruments. 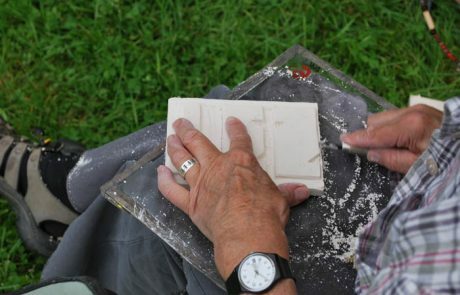 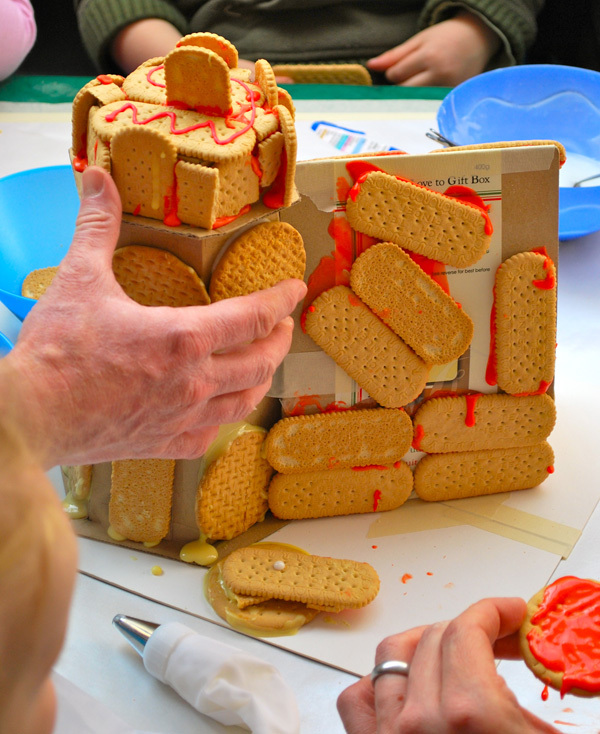 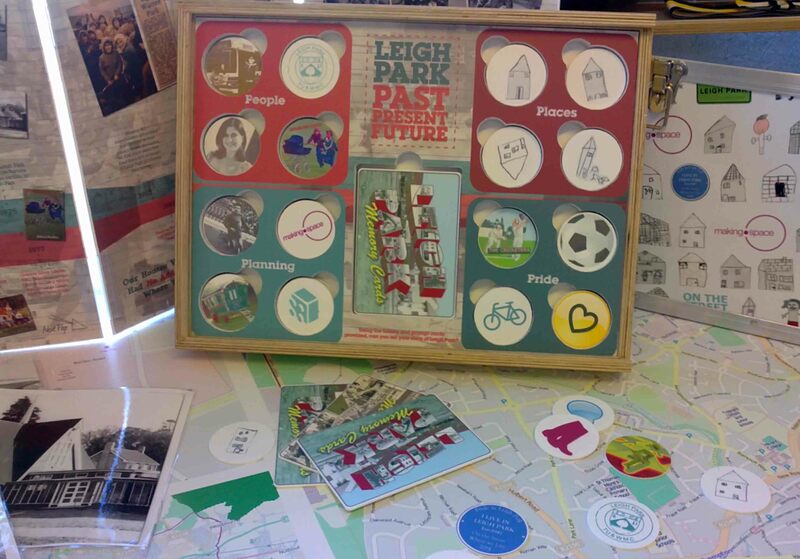 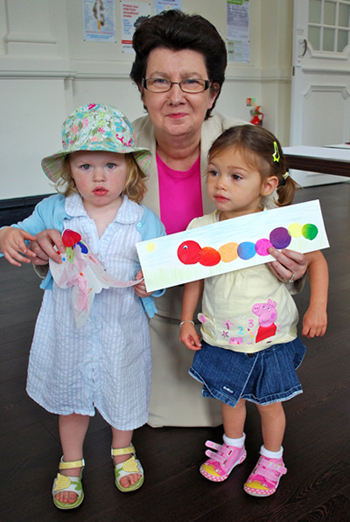 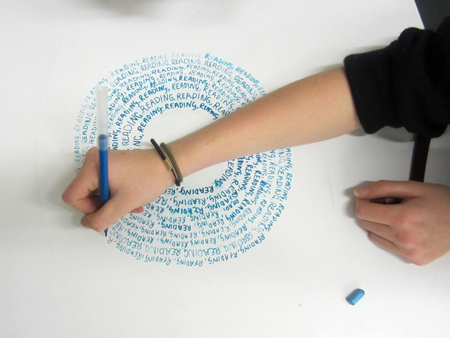 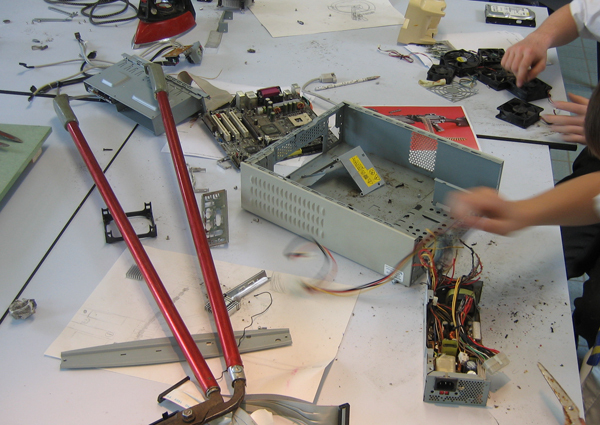 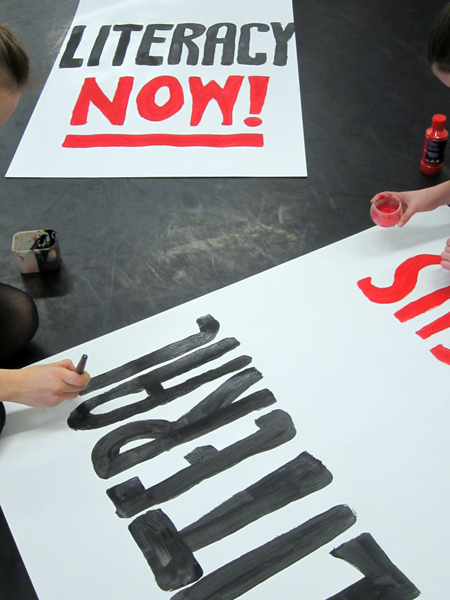 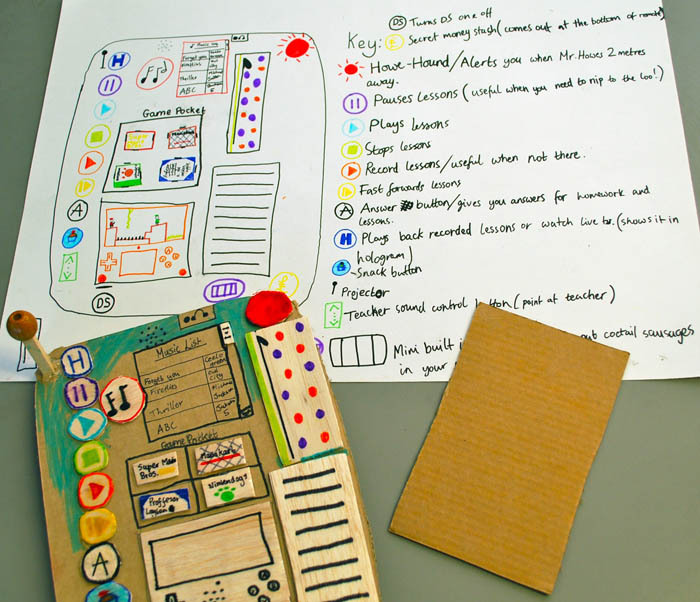 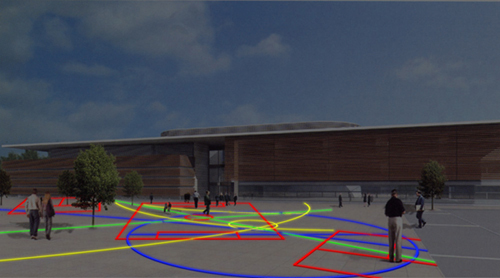 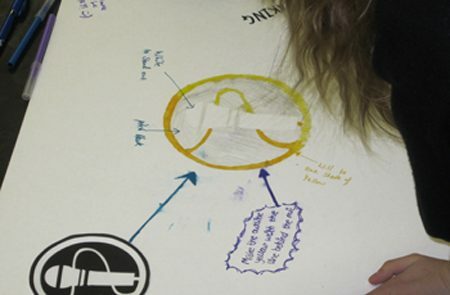 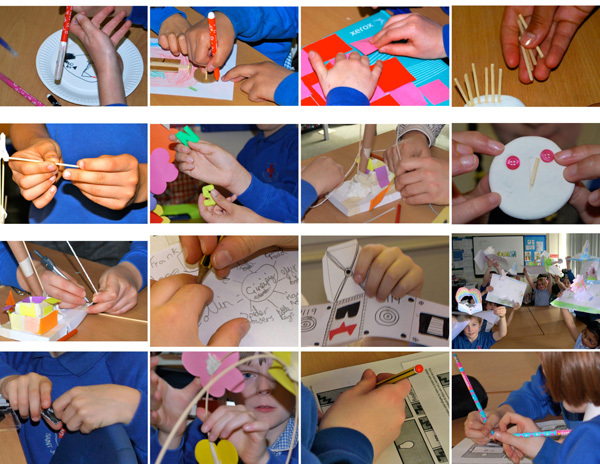 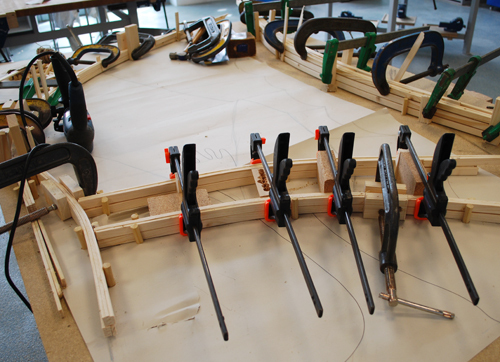 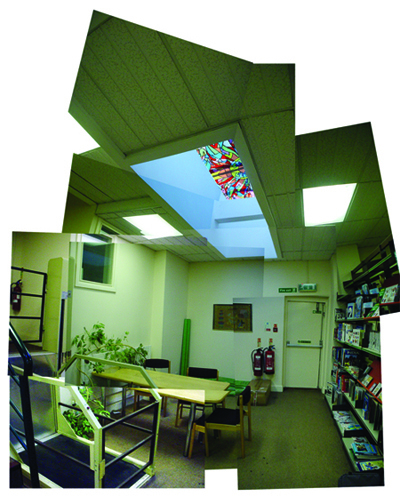 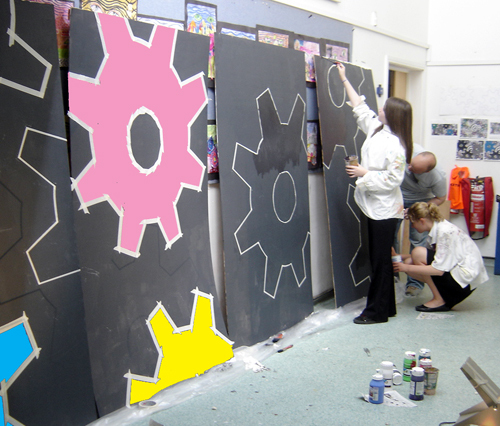 We led workshops with users of the centre, including their ideas into the finished piece. 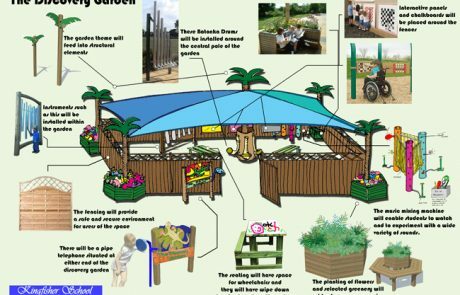 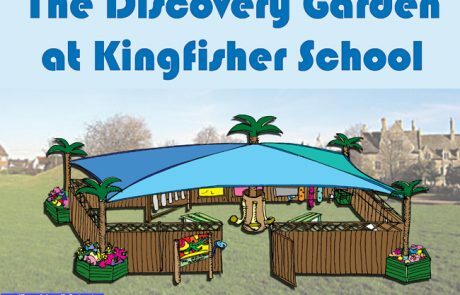 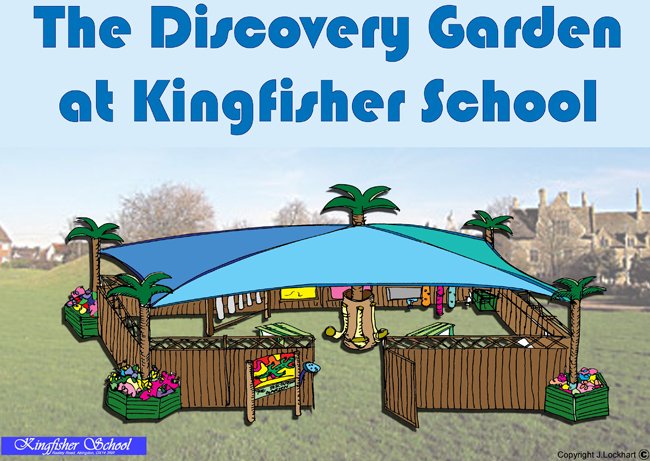 The Discovery Garden – Kingfisher Special School, Abingdon, Oxon ThinkLockhart worked alongside students from the school to develop ideas for an outside play area. 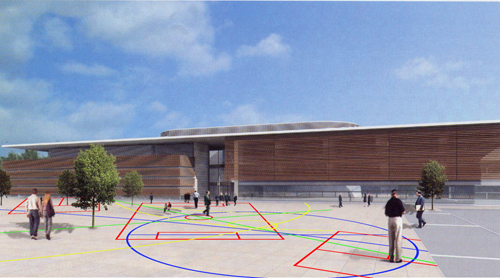 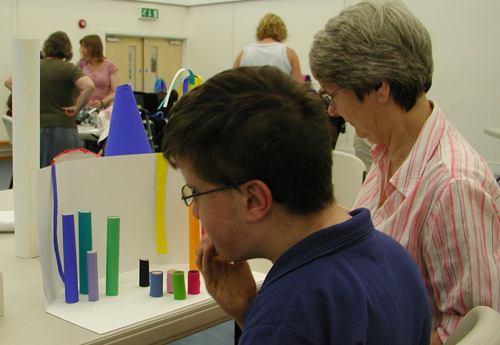 The special educational needs of participants directly related to the solutions presented in the final designs. 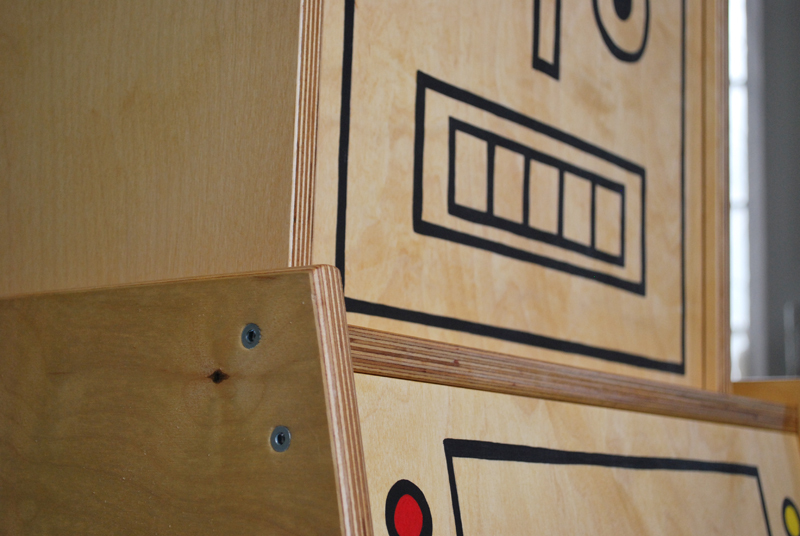 Titch the robot has arrived! 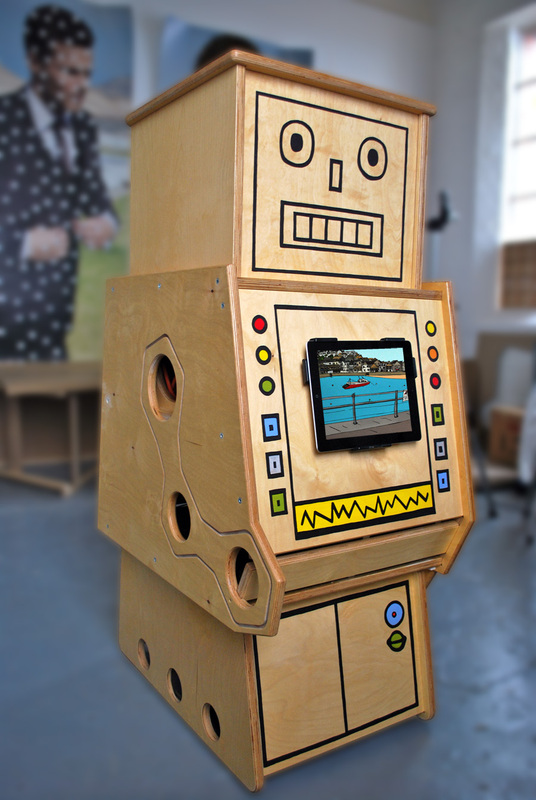 Titch the robot has arrived at The Windmill Primary School! 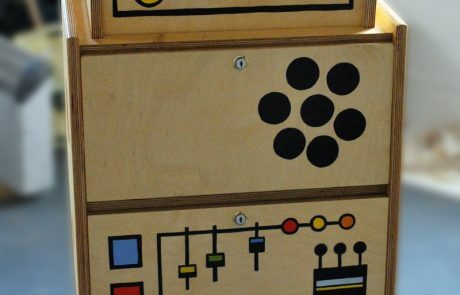 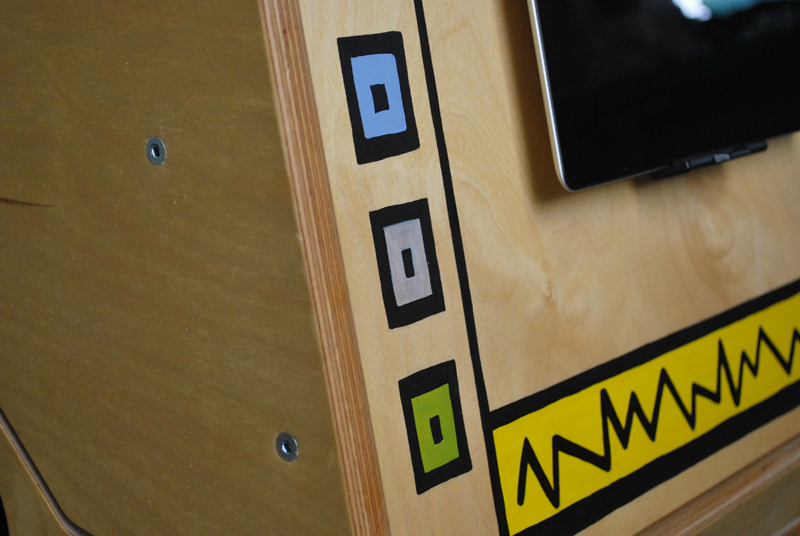 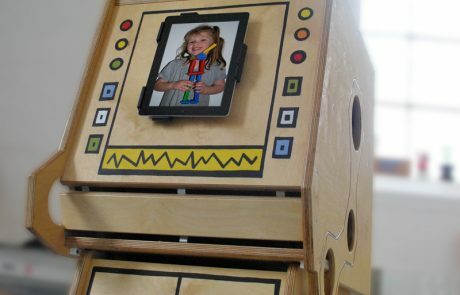 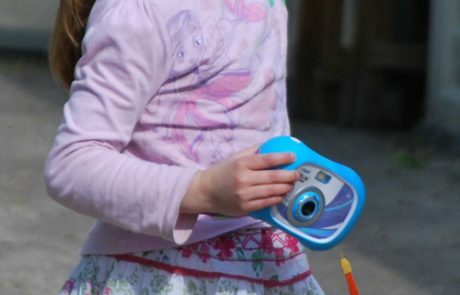 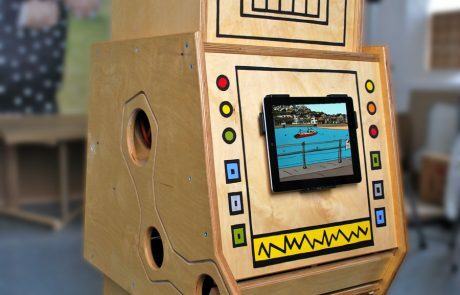 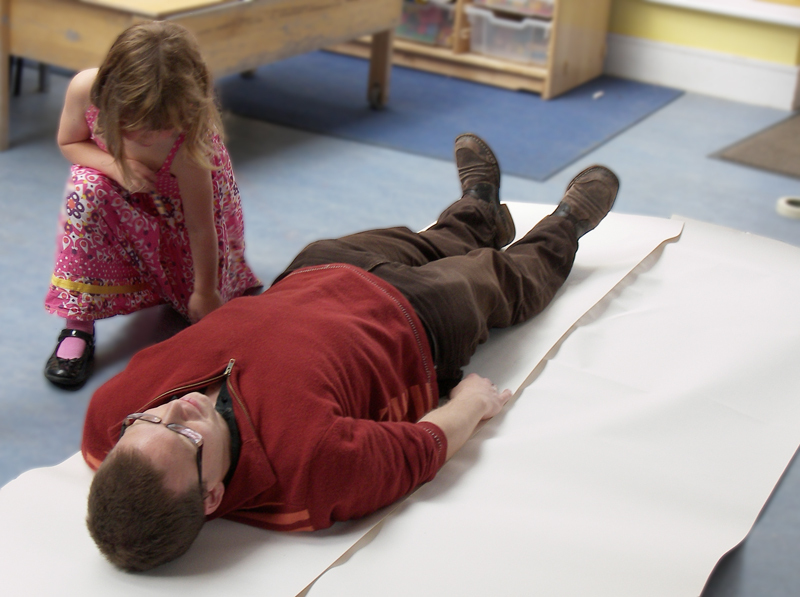 He will be projecting ideas, computing experiences and interfacing with students through his iPad tummy! Watch this space for further adventures. 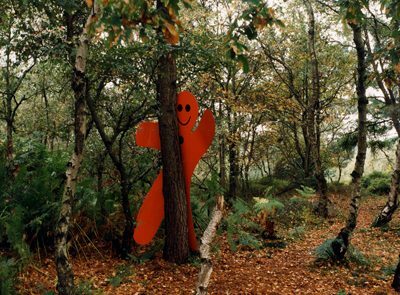 Good luck Titch. 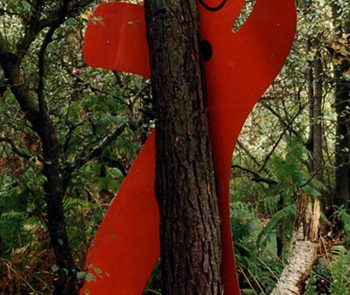 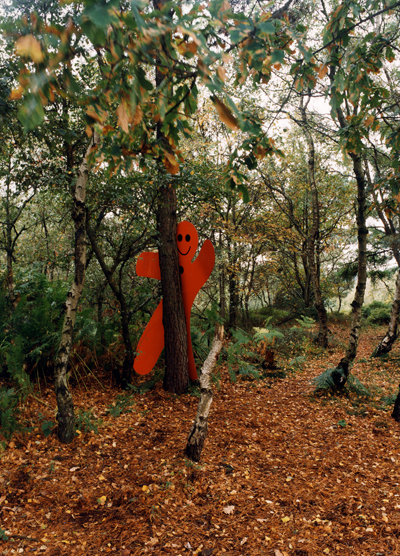 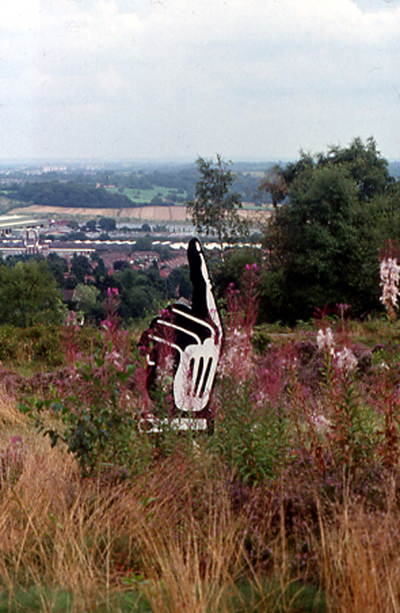 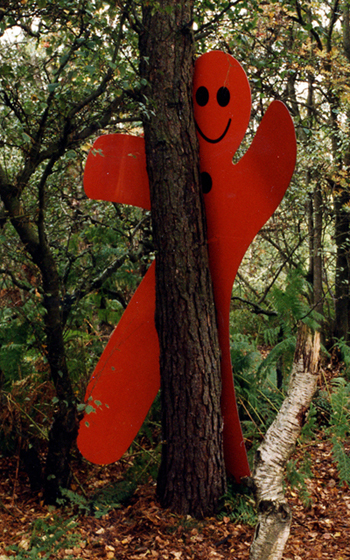 This Way Up – Gallery in the Trees, Lickey Hills, Birmingham As part of a series of temporary large scale outdoor sculptures, ThinkLockhart developed some quirky interventions to the woodland area. 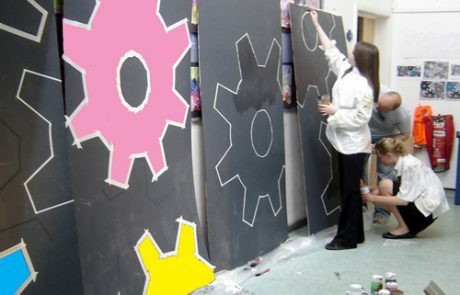 Chelesea Flower Show – Ranelagh School, Bracknell, Berkshire ThinkLockhart worked alongside students and staff to realise a relief wall sculpture for their centenary garden at Chelsea. 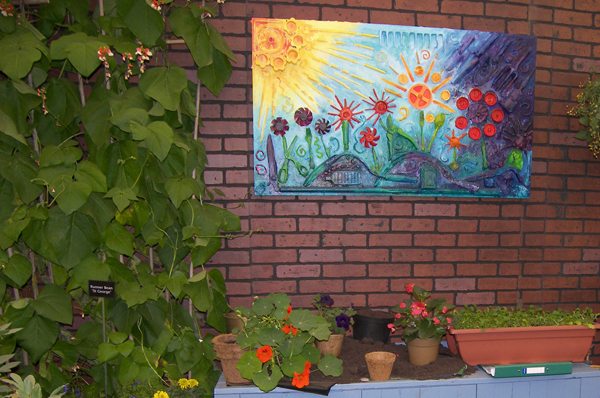 The garden achieved a silver medal and was highly praised. 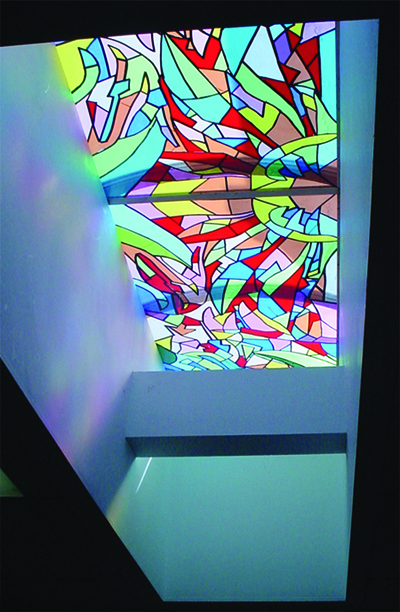 Rainforest Stained Glass Window – The Henley College Learning Zone, Henley on Thames, Oxon Working alongside BTEC National Diploma students, ThinkLockhart designed, fabricated and installed a rainforest inspired stained glass window. 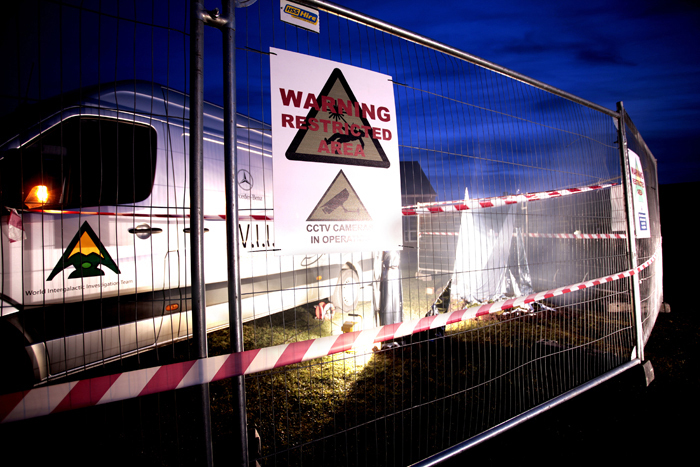 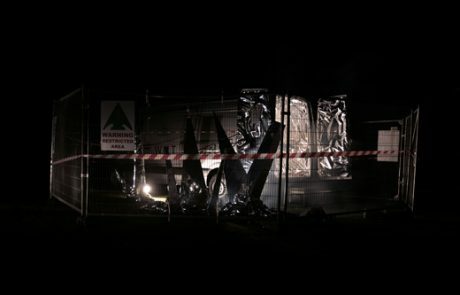 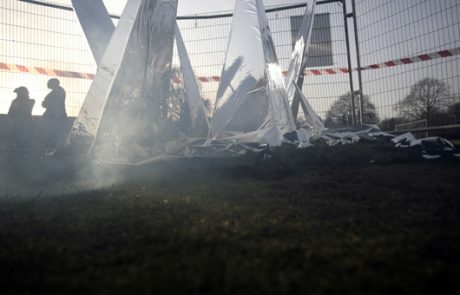 The work was created using lighting gels and acrylic for safety. 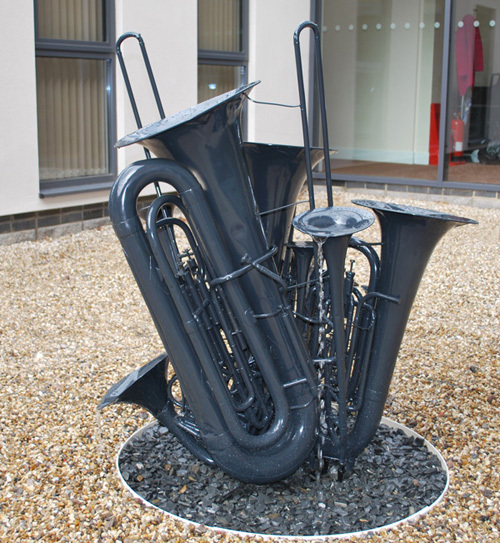 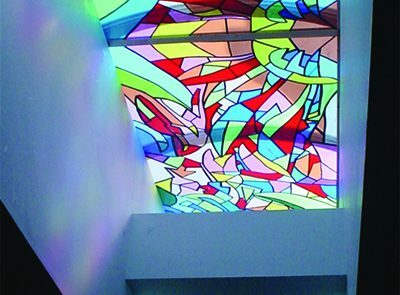 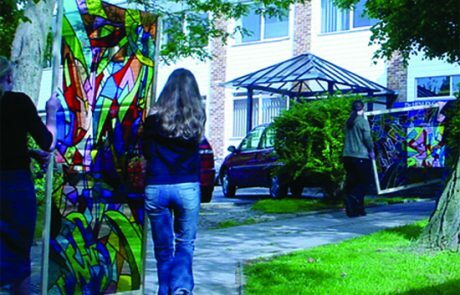 Sculpture Commission – Harefield Academy, Middlesex This project involved working with students preparing to move from their old school into a newly built Academy and to develop a permanent artwork for outside the new building. 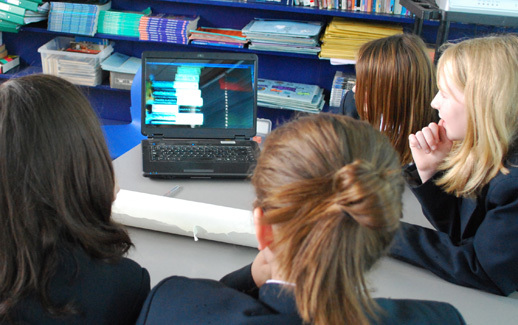 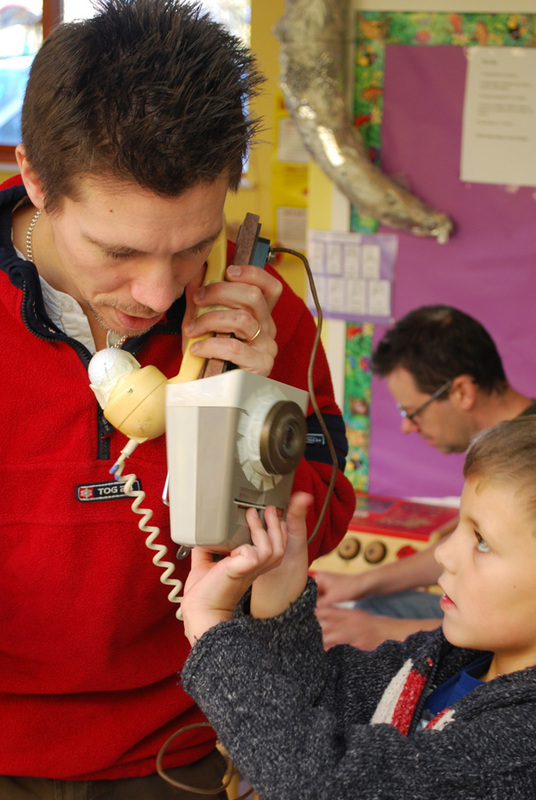 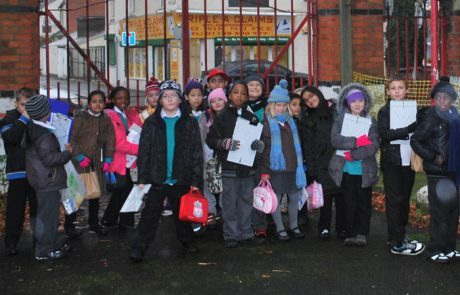 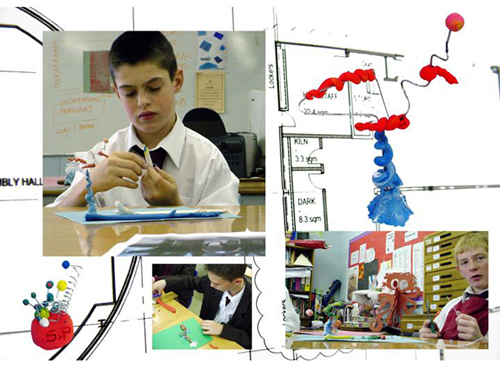 We worked at the school regularly over one term, leading sessions with students. 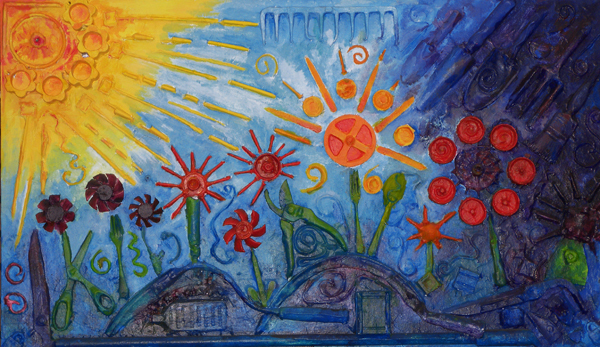 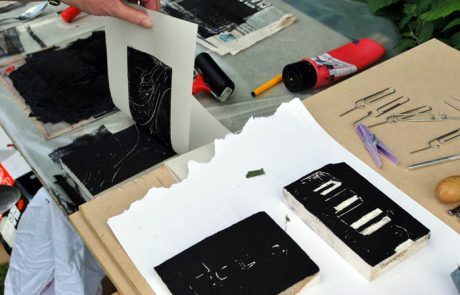 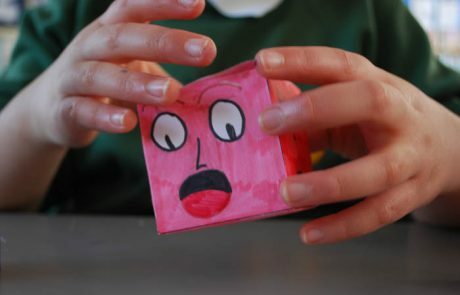 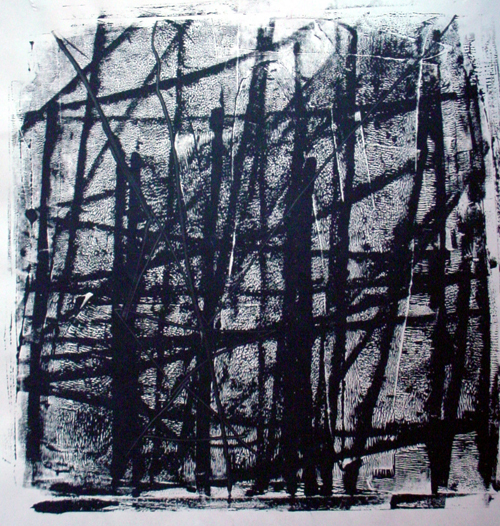 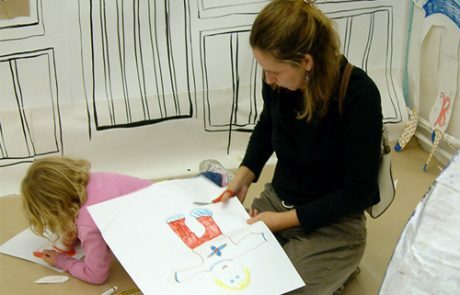 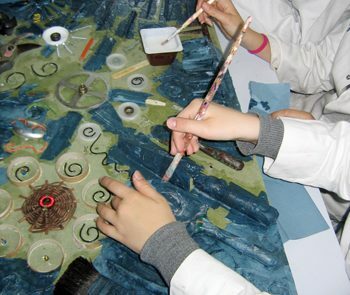 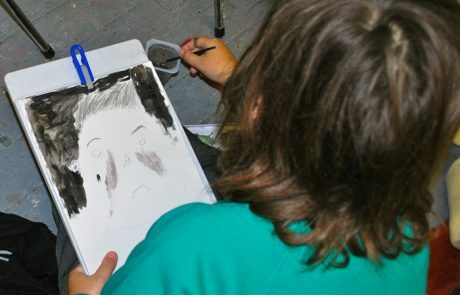 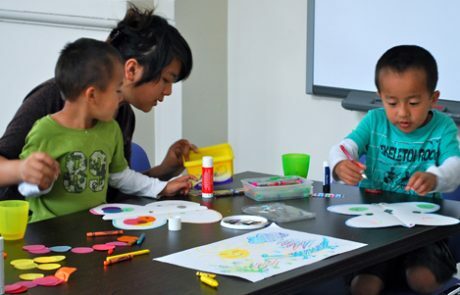 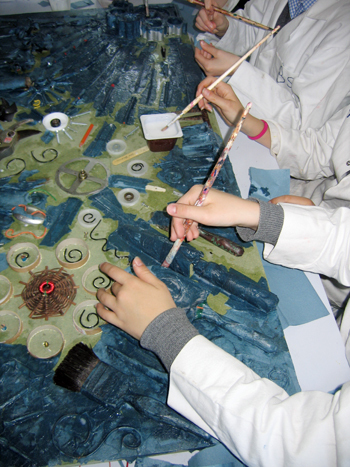 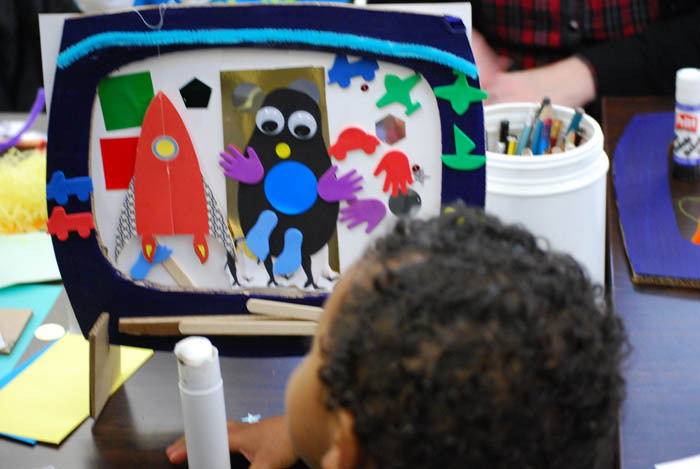 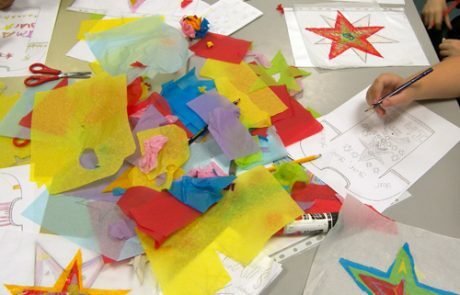 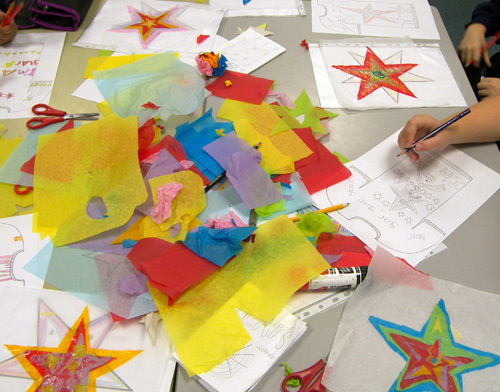 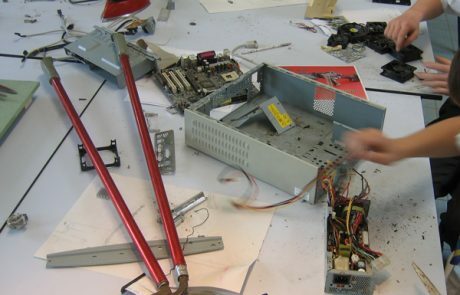 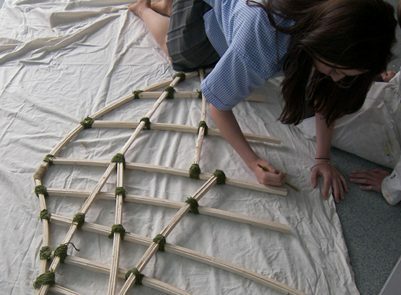 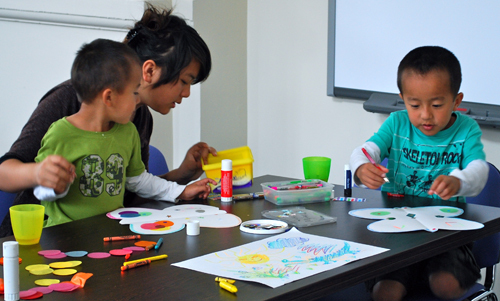 During these sessions, participants explored their school environment, experimented with materials, experienced a range of techniques and created designs for the new artwork. 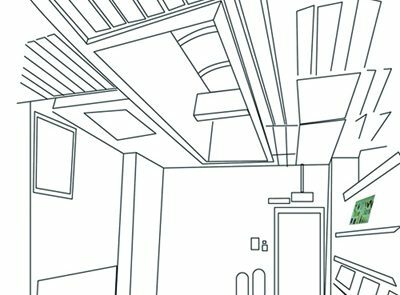 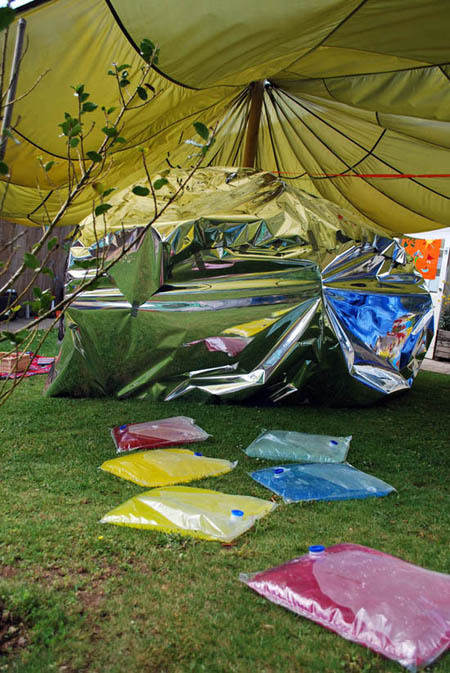 The students looked at how to create a sense of belonging within fresh architectural spaces through sculptural intervention. 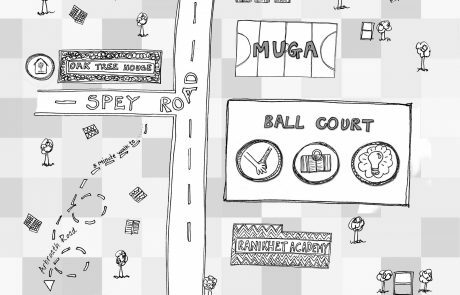 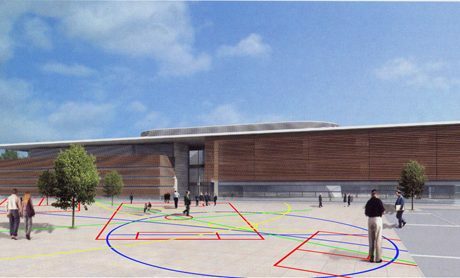 Combining the students ideas, we then developed a proposed outcome for the new building which would reinforce the Sports Specialist School theme, whilst embracing the student’s visions and aspirations for their school. 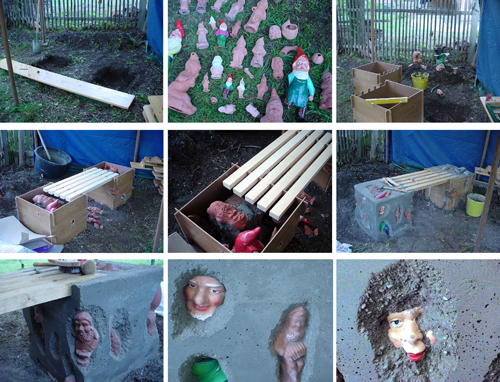 Public Seating Symposium and commission, Thuringren, Germany Thuringren Arts Festival, Germany; ThinkLockhart worked on the ‘Gnome Bench’ for the theme of public seating. 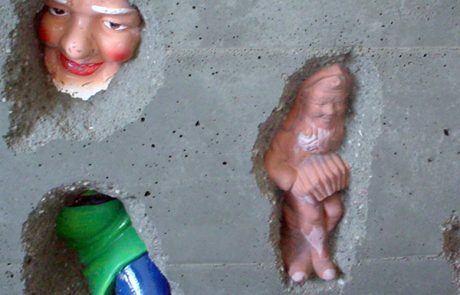 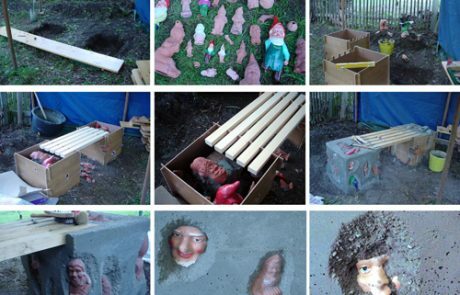 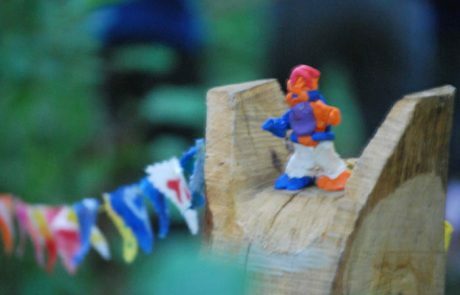 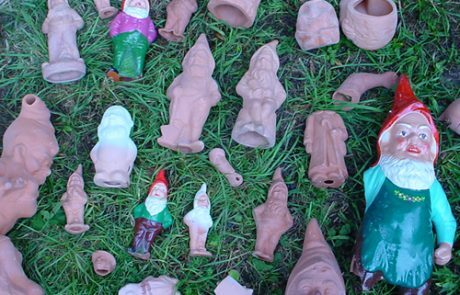 Legend has it that gnomes come alive at night to wreak havoc or to help in your garden. 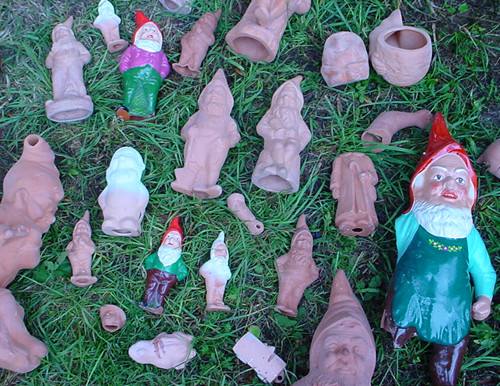 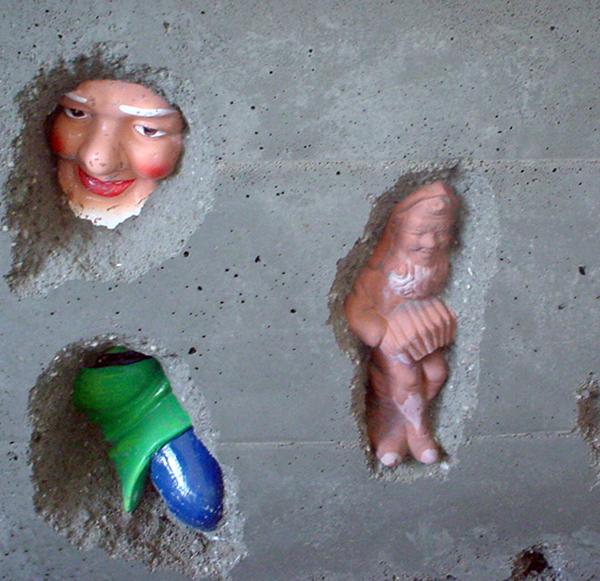 Garden gnomes had been invented very close to the town where the festival takes place. 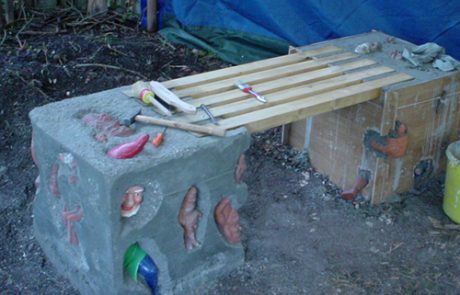 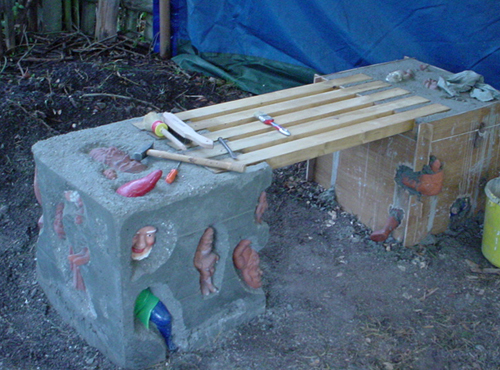 The small gnomes were encapsulated within the pillars of the bench and then revealed through carving. 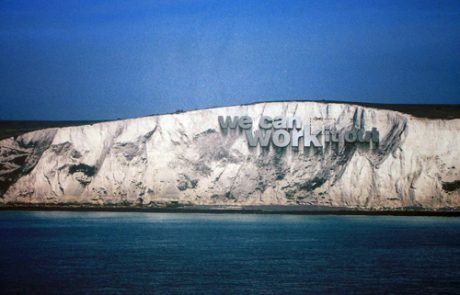 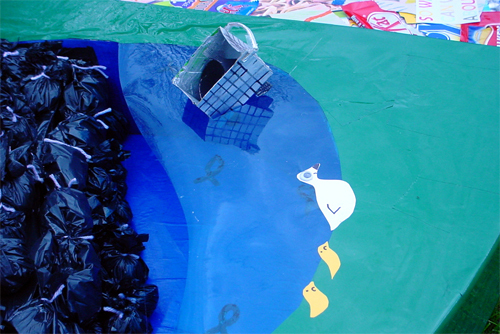 Creatively bridging the gap between individuals and organisations. 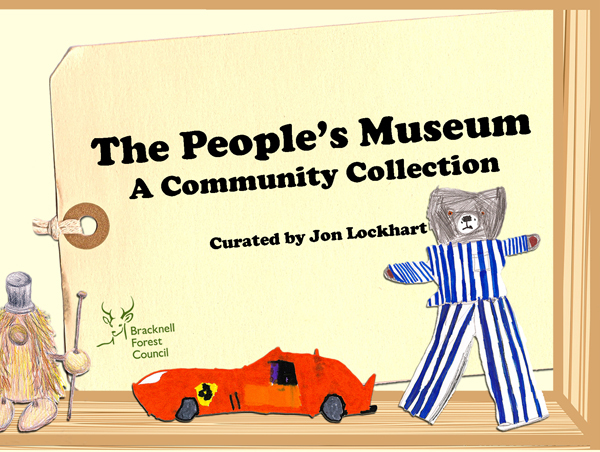 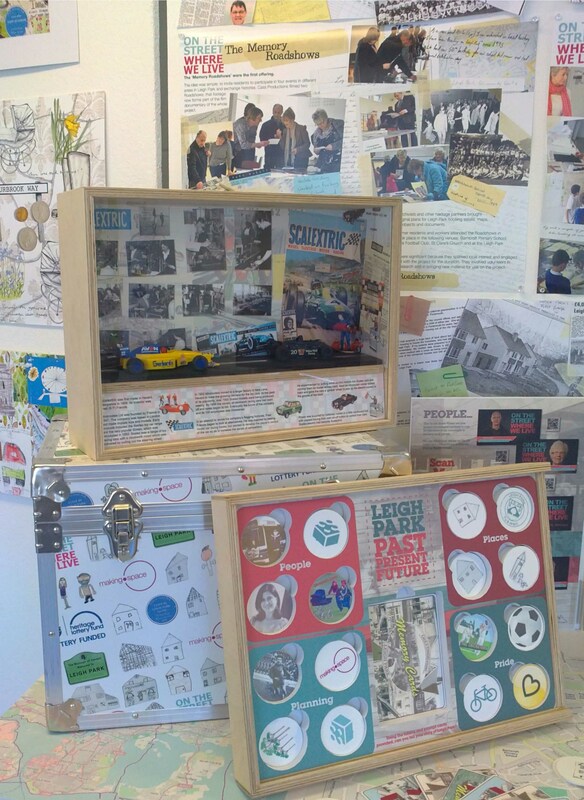 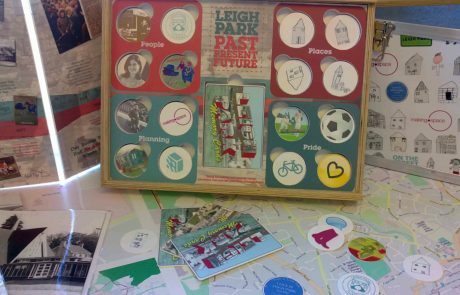 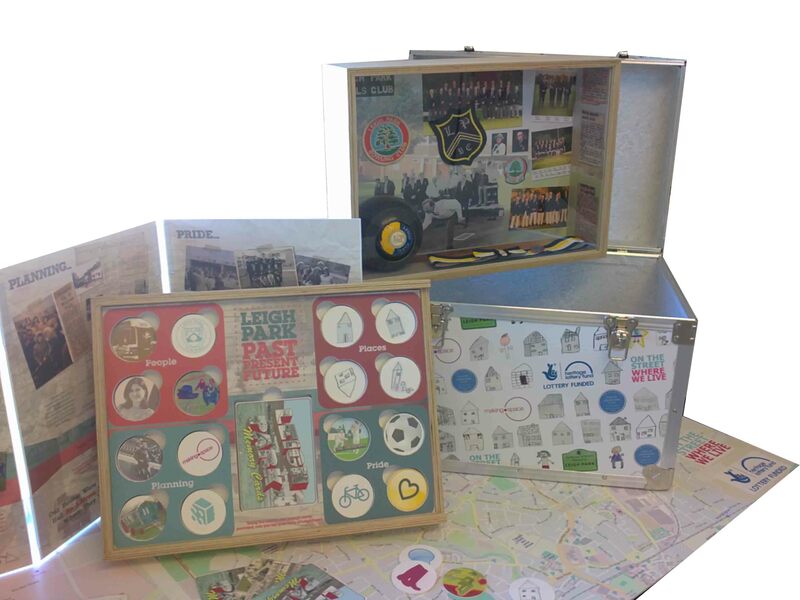 The People’s Museum – Bracknell Forest Council and Reading Museum Boxed Loans Collection A unique idea developed by Thinklockhart, enabling participants to contribute to a community project. 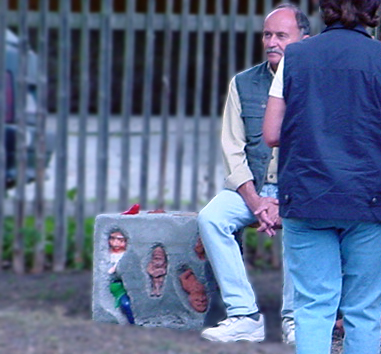 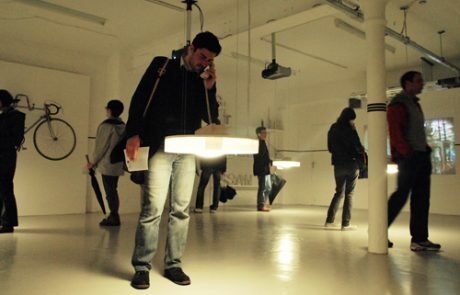 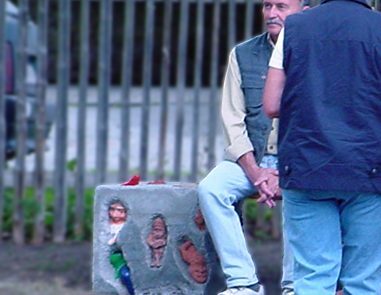 People are invited to bring along an item that holds some kind of meaning to them. 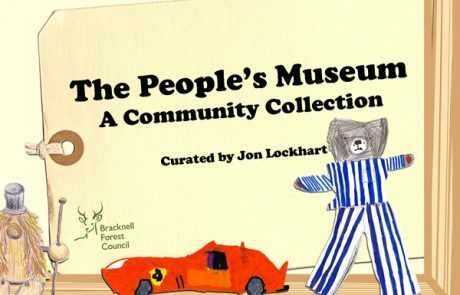 Contributors can then either draw the object, photograph it, write about it, scan it, or even leave it on the ‘museum’ shelves. 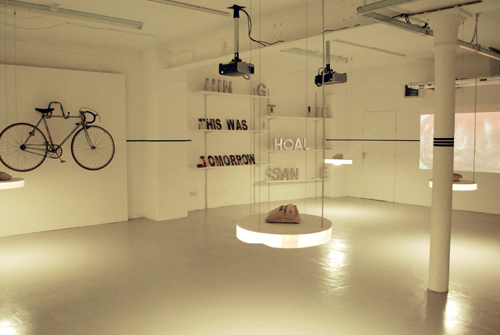 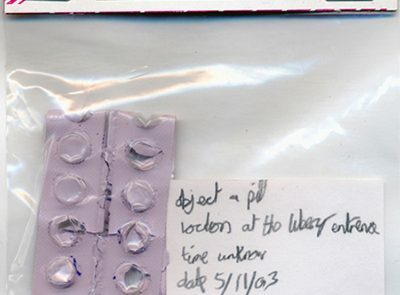 Using archive labels, each object is given it’s own identity within the eclectic exhibition. 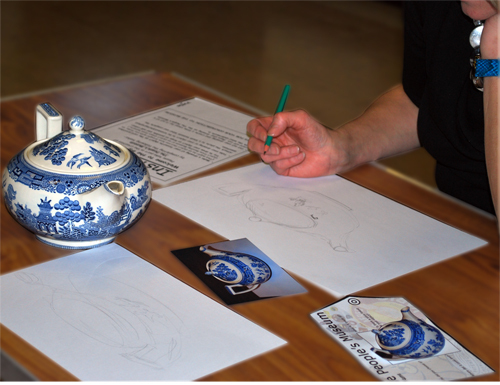 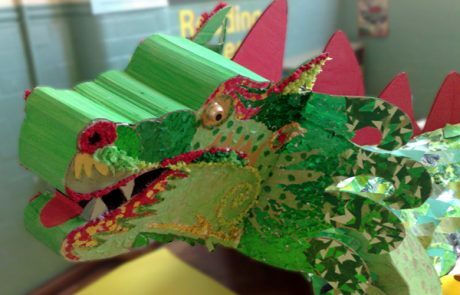 Community Cohesion Art Events – Battle Library, Reading, Berkshire ThinkLockhart have provided a series of art workshops for the users of Battle Library in Reading, Berkshire. 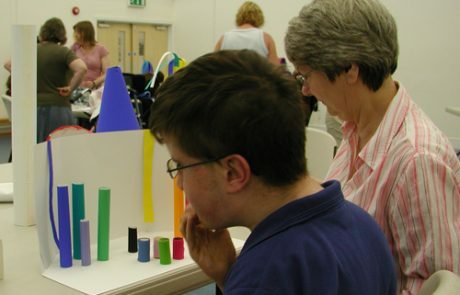 Focusing on inclusive activities for carers and their children, with an emphasis on participatory, accessible open ended activities. 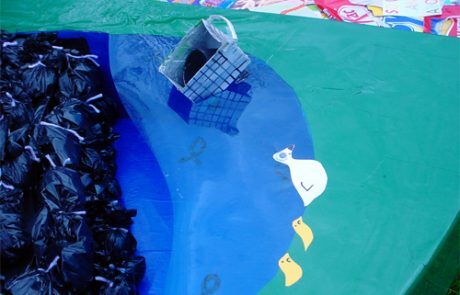 Norcot Early Years Centre, Reading, Berkshire Funded by Reading Borough Council and Arts Council England, We created an’under the sea’ themed sound garden at Norcot Early Years Center, Reading. 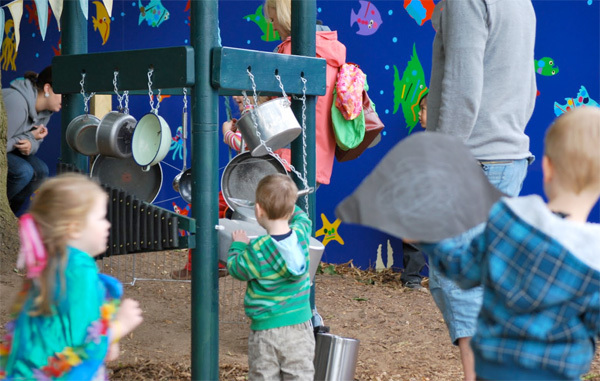 Over the course of several months we worked with the children and parents at the center to produce a stunning outdoor musical play space including a sunken play ship. 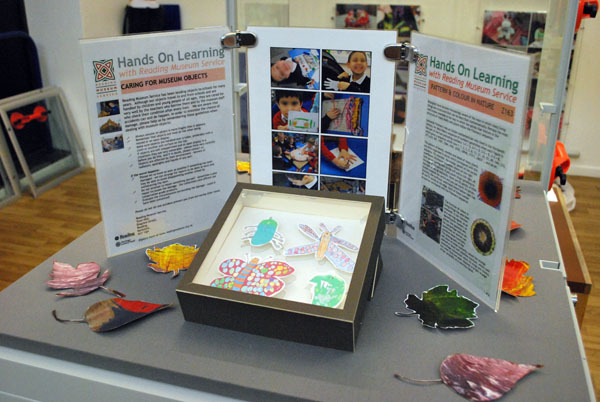 Artefacts Project The Museum of Reading, Arts Council England and Reading Borough Council teamed up with Thinklockhart and Primary Schools in Reading on this project. 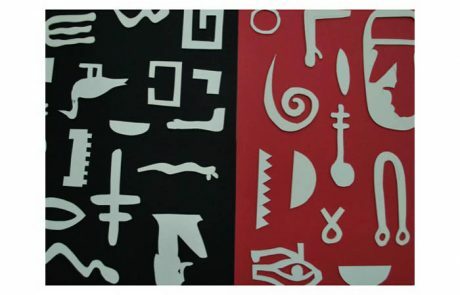 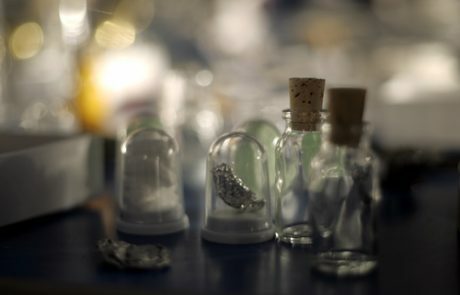 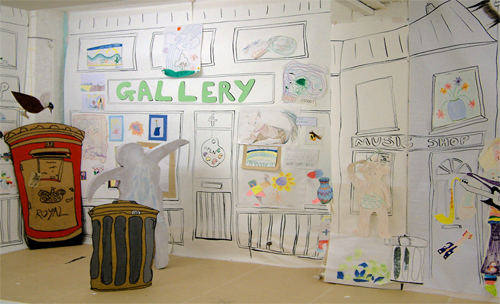 The work explored the museum’s objects as stimuli for creative enquiry. 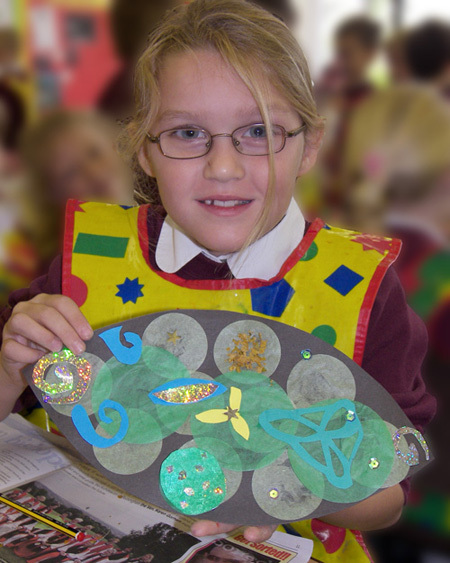 We led teacher training sessions and facilitated workshop within schools. 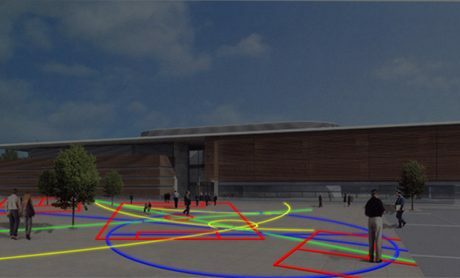 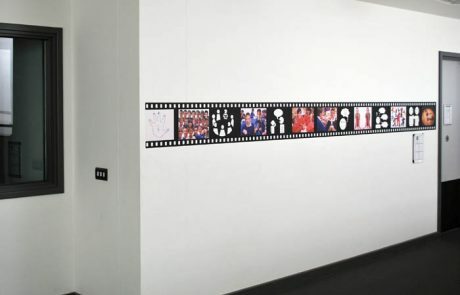 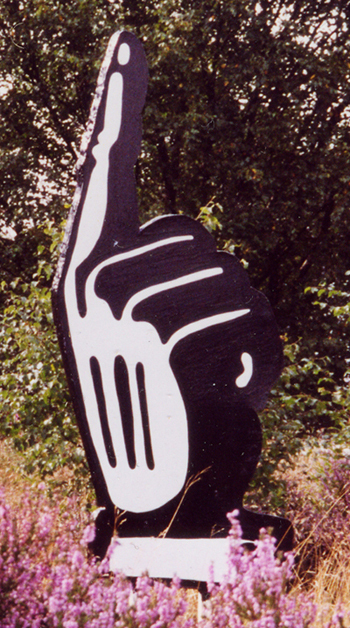 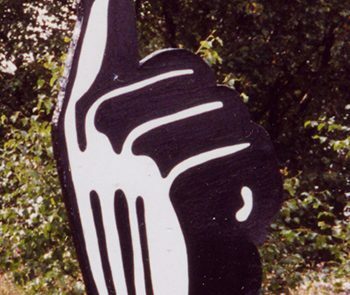 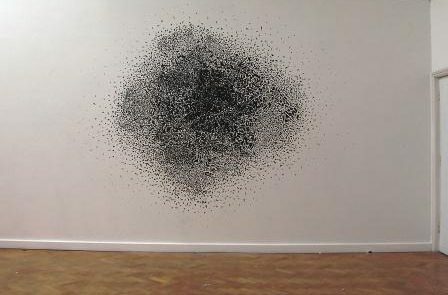 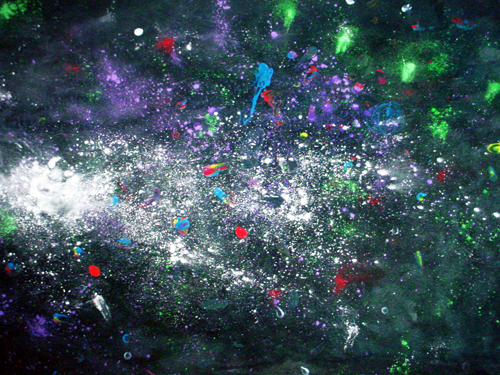 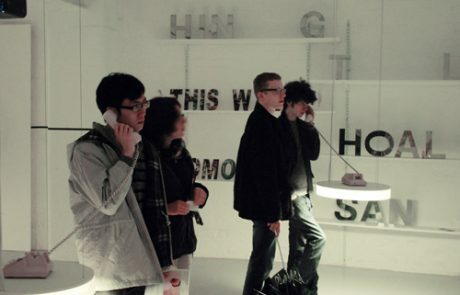 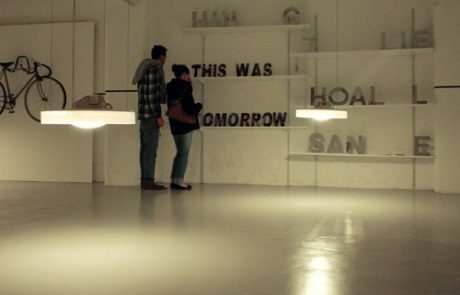 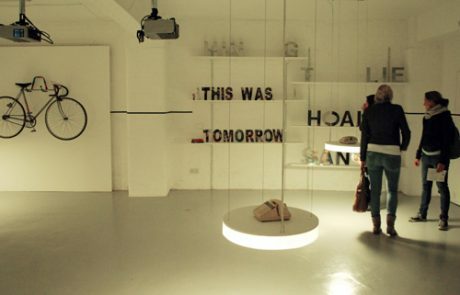 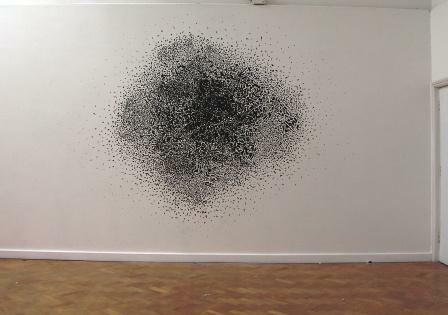 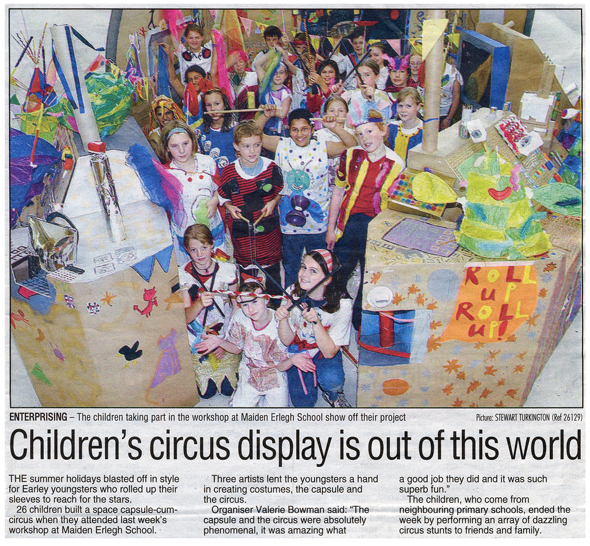 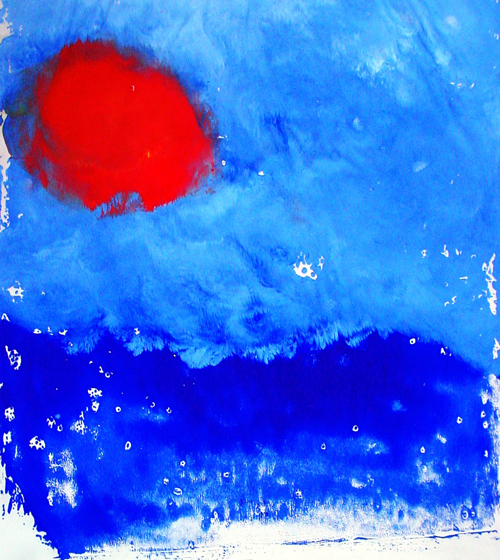 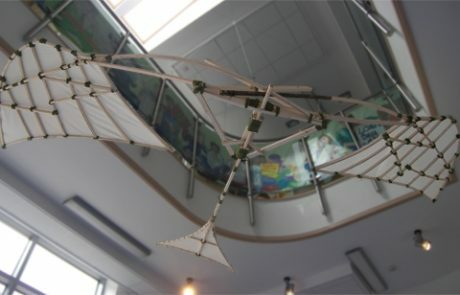 The final work was exhibited in Milton Keynes and Reading. 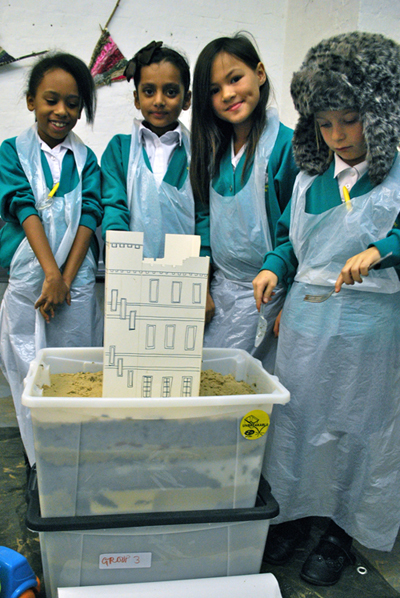 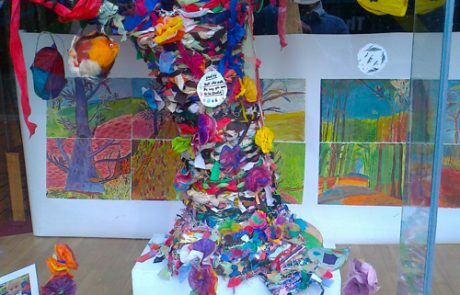 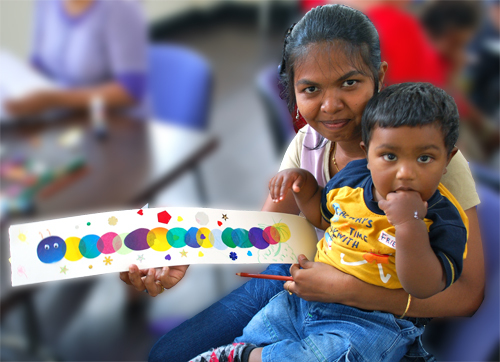 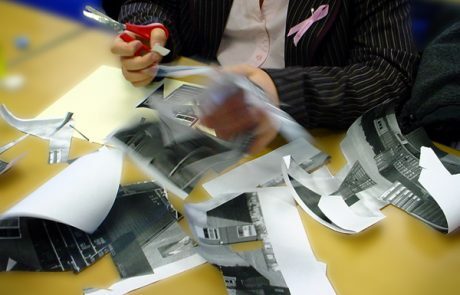 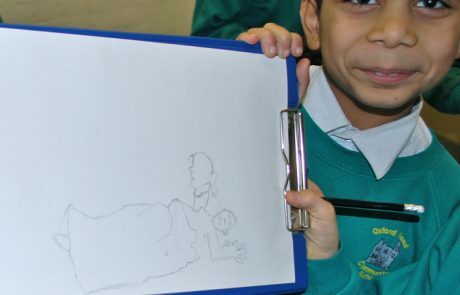 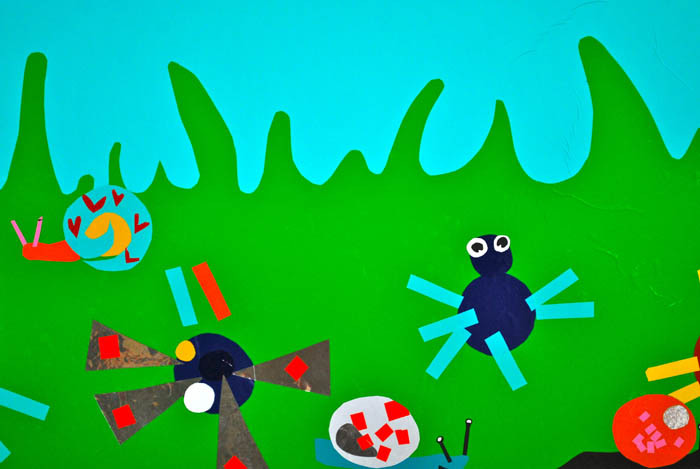 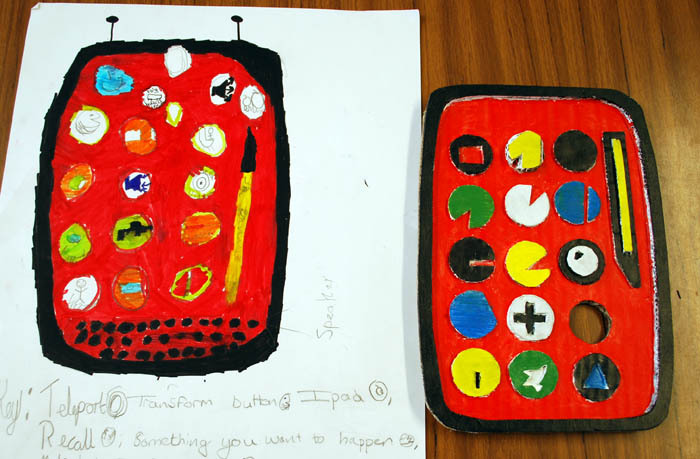 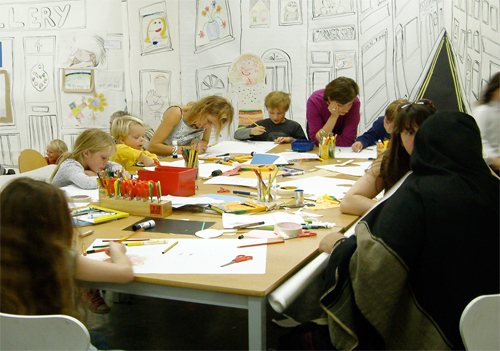 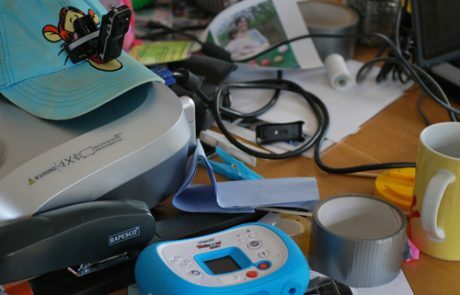 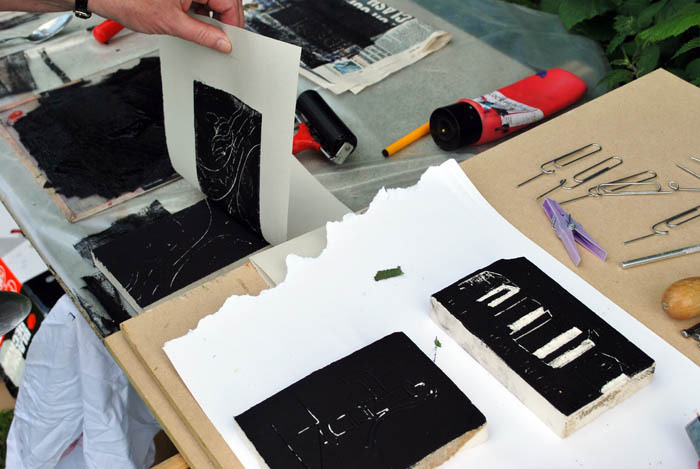 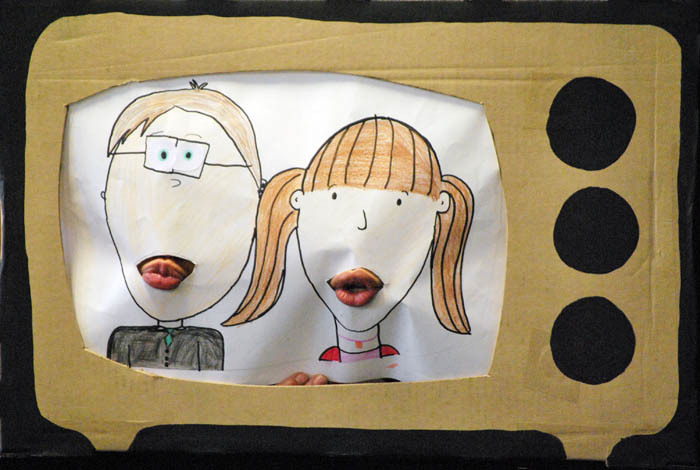 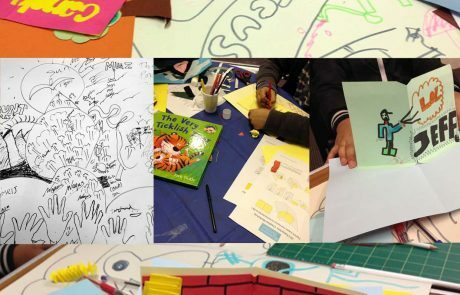 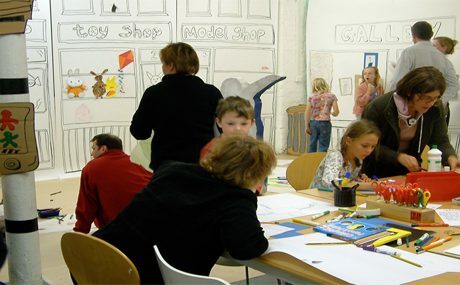 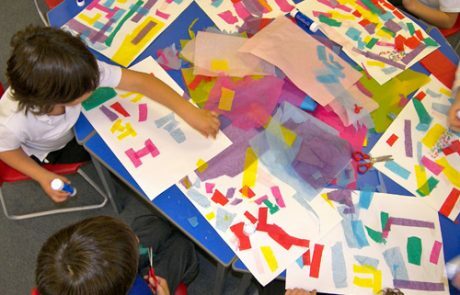 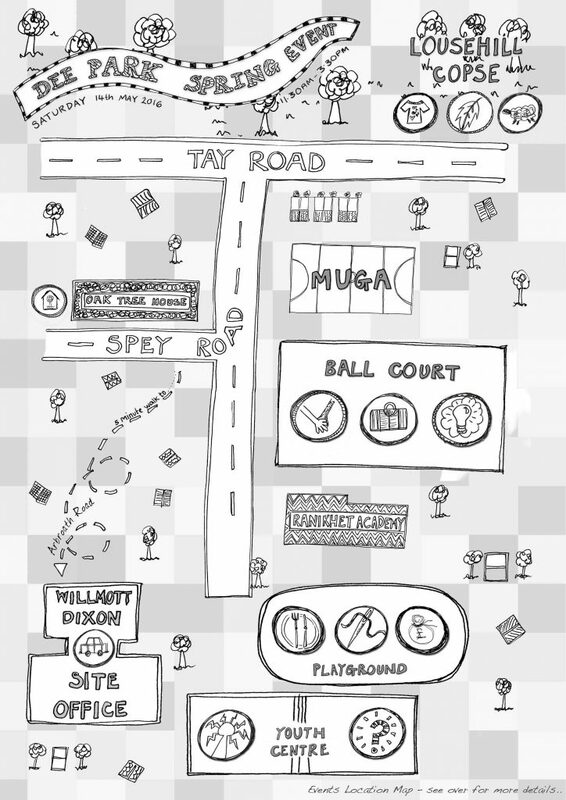 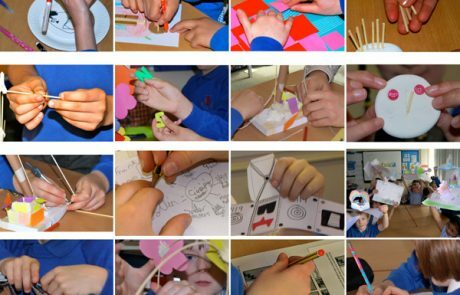 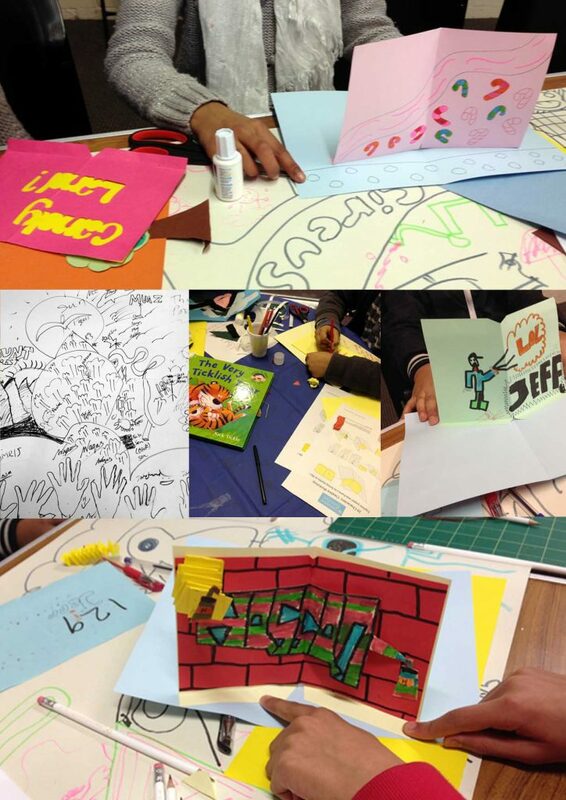 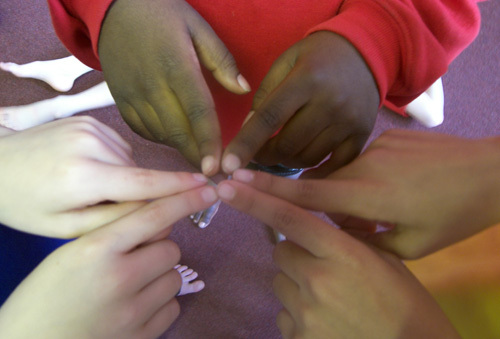 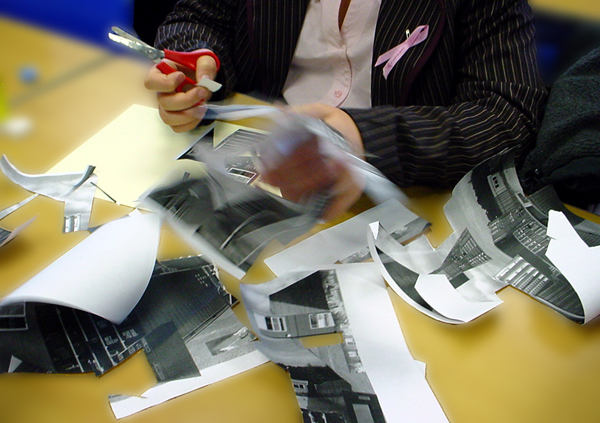 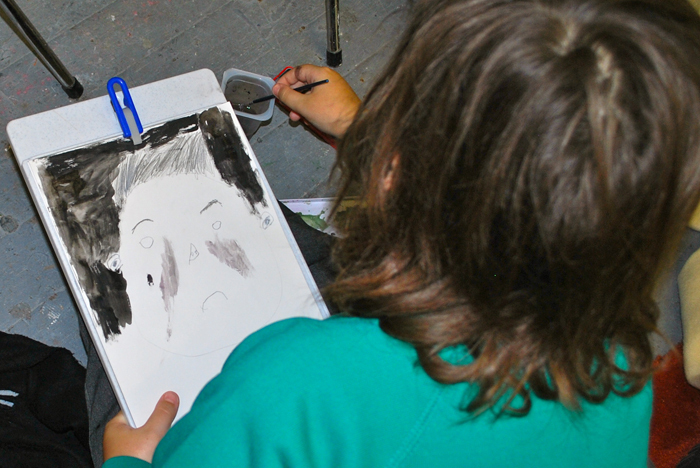 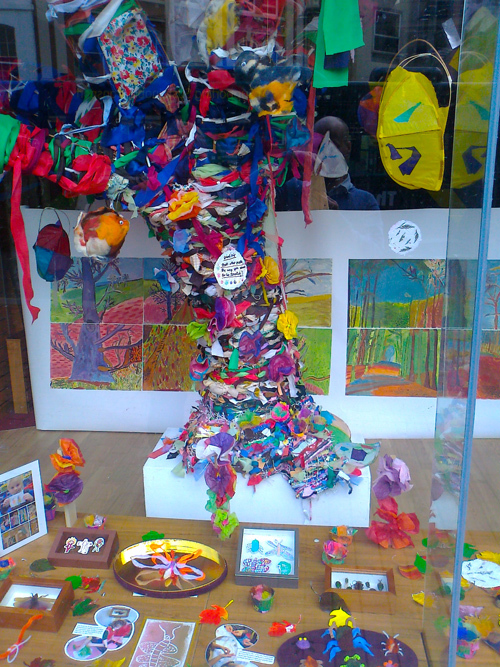 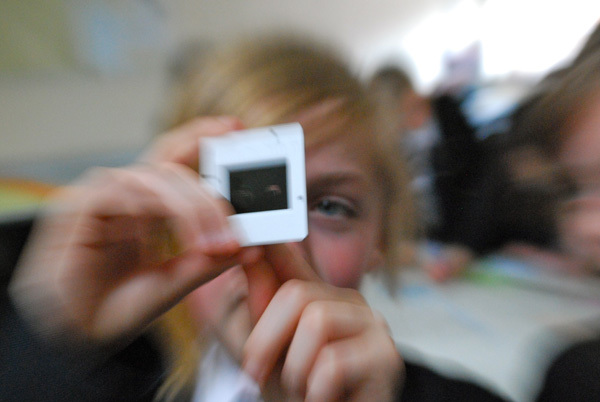 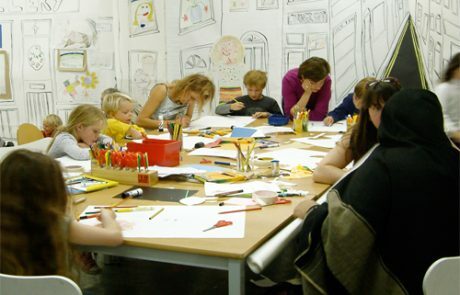 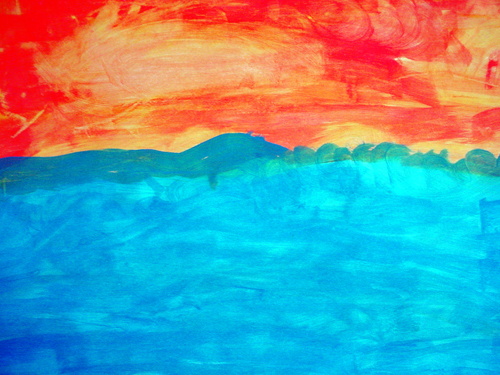 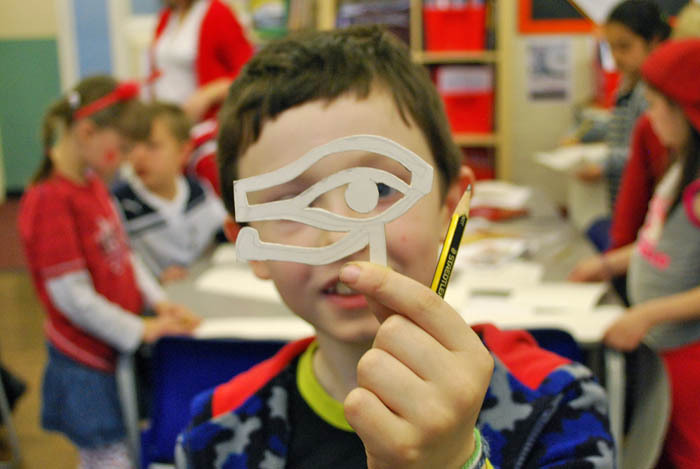 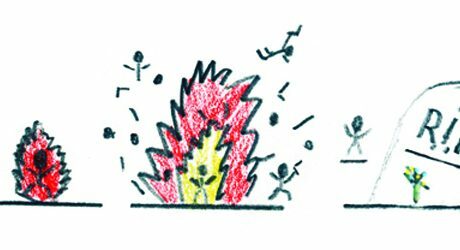 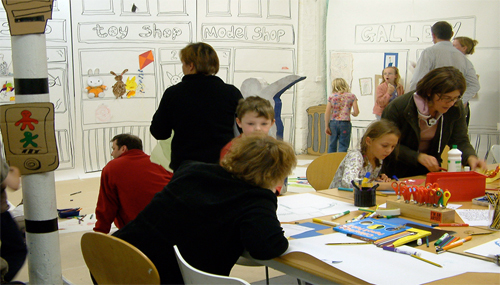 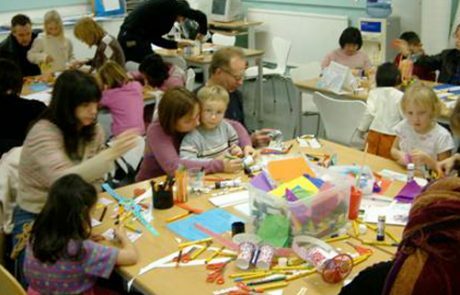 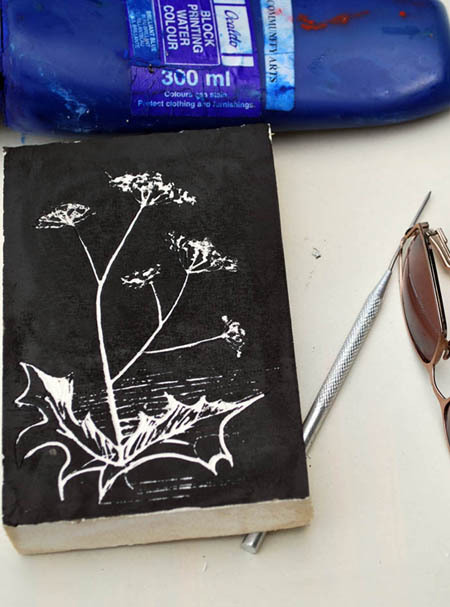 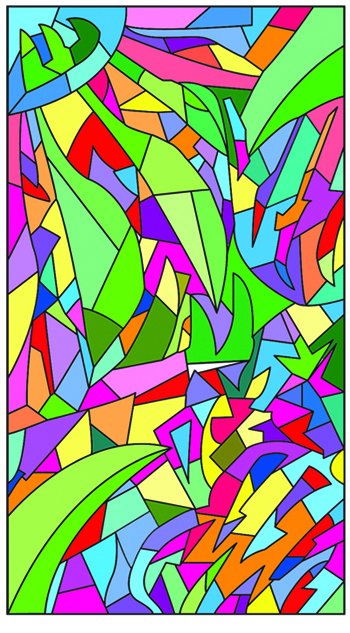 ArtsAward activities with young people in Slough – Creative Junction. 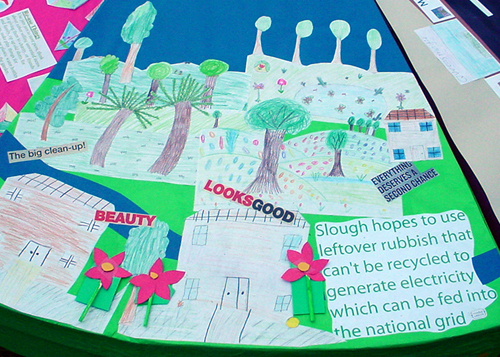 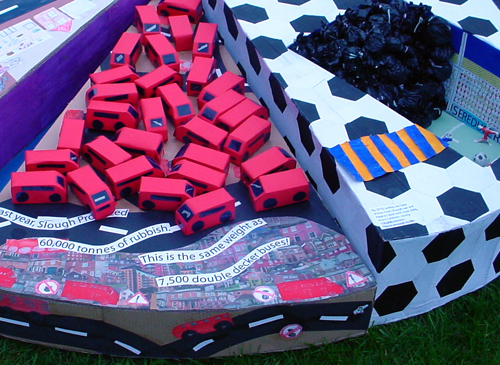 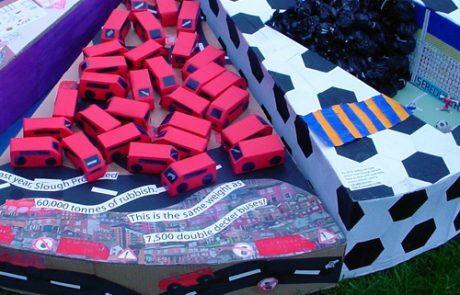 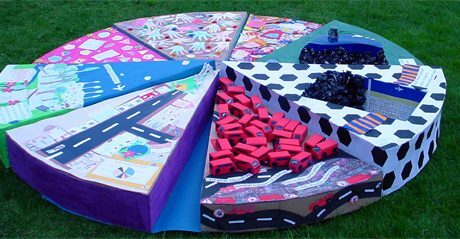 Groundwork Thames Valley, Recycling awareness project Thinklockhart worked with local school children, to produce a 3D chart showing how much waste is thrown away in Slough every year. 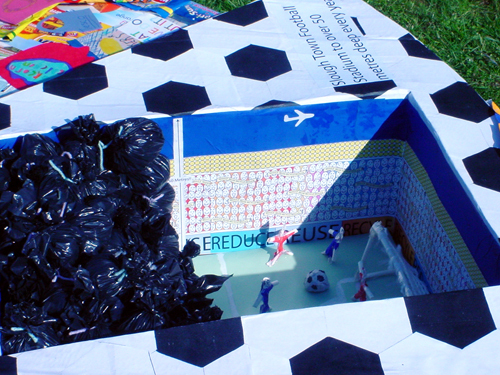 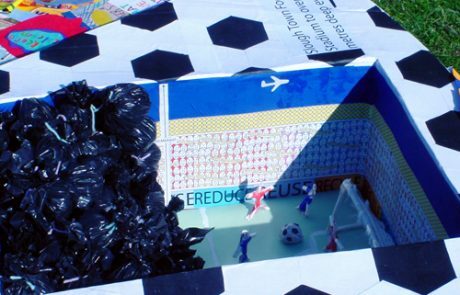 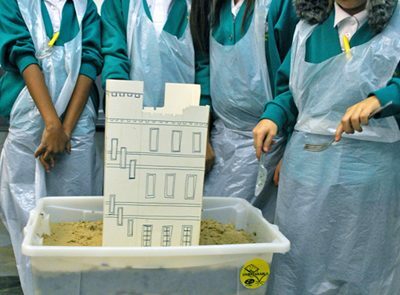 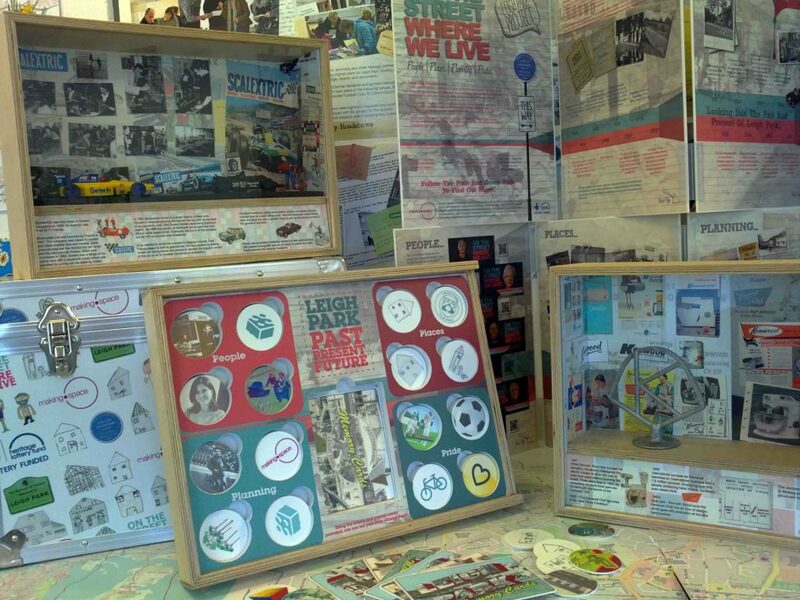 The project helped participants to visualise the sheer volume of unnecessary rubbish placed into landfill annually. 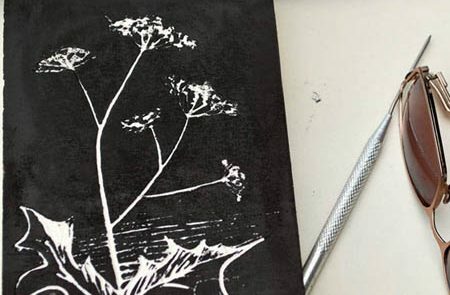 Henley Guild of Artists: Experimenting with ideas days Thinklockhart have worked on several experimentation days with the guild, both in Henley and near by. 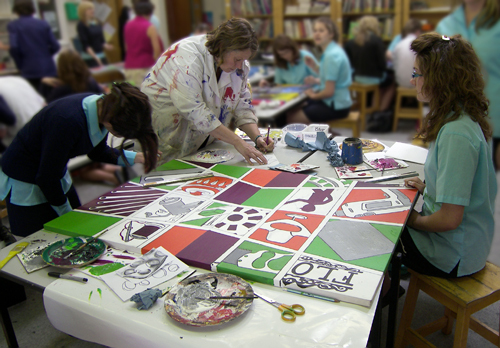 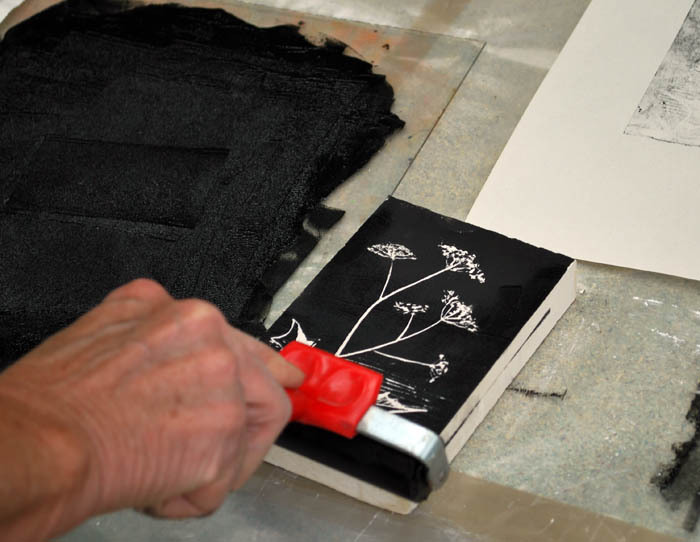 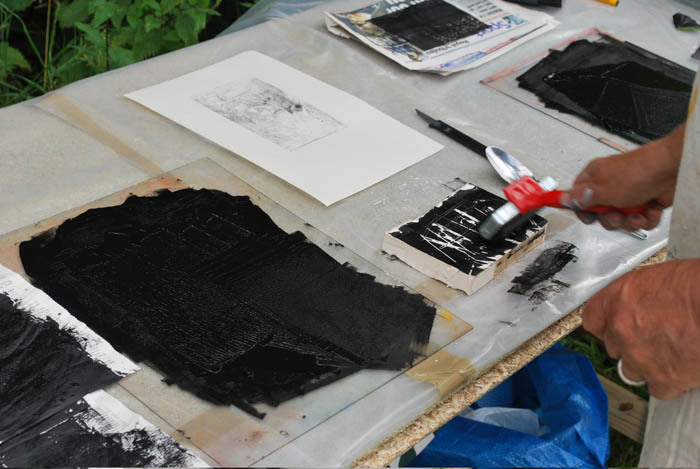 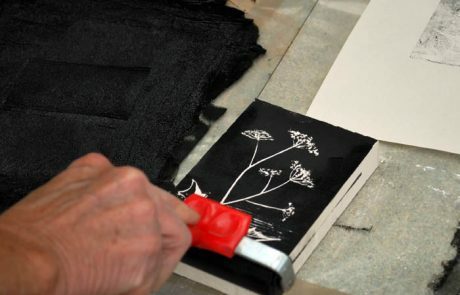 The members have been extremely keen and all demonstrate an extensive range of skills and creative experience. 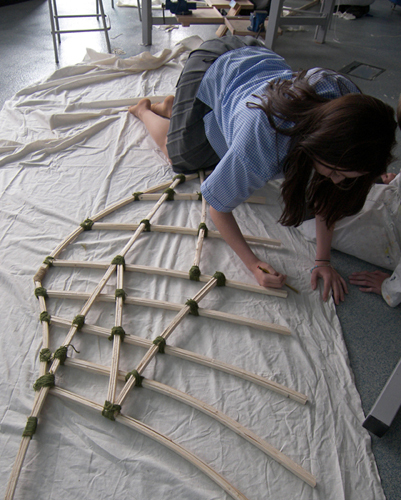 It is always a pleasure and a mutual learning experience when working with the guild. 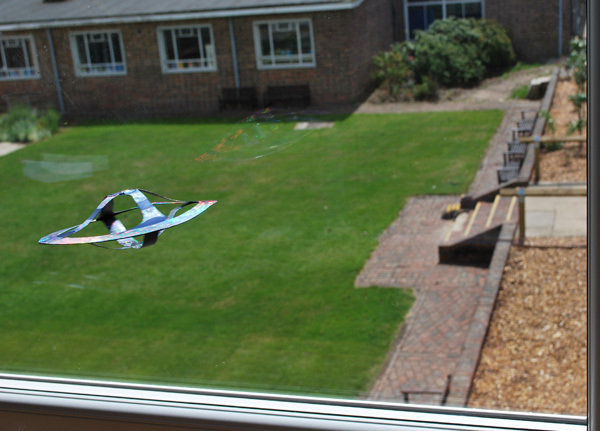 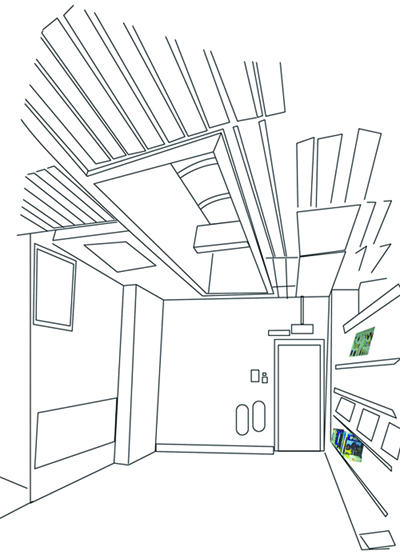 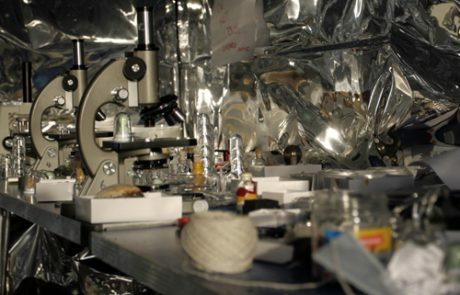 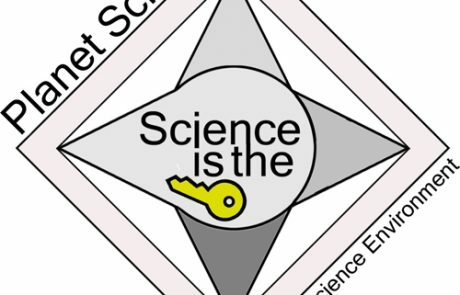 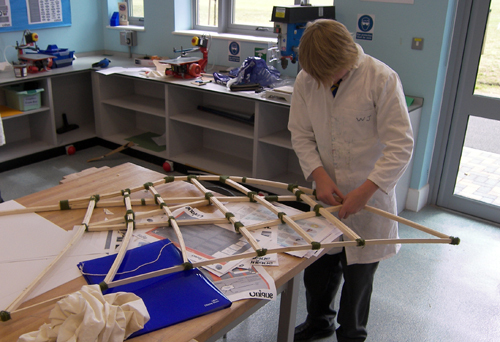 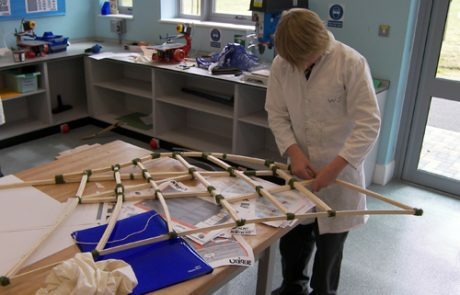 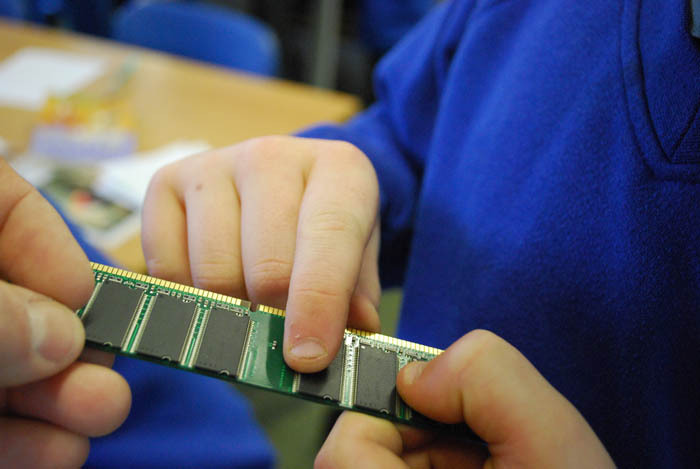 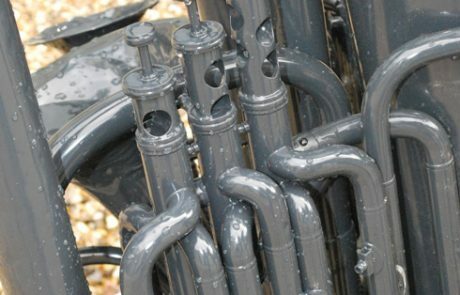 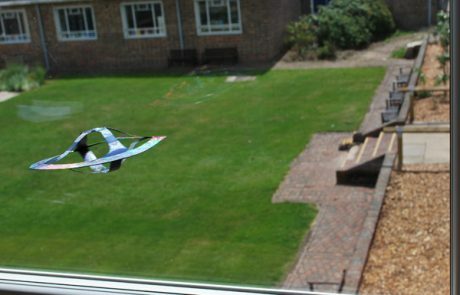 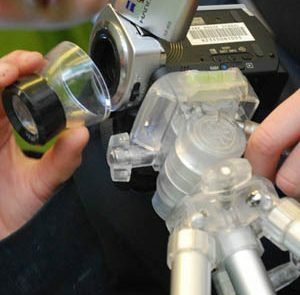 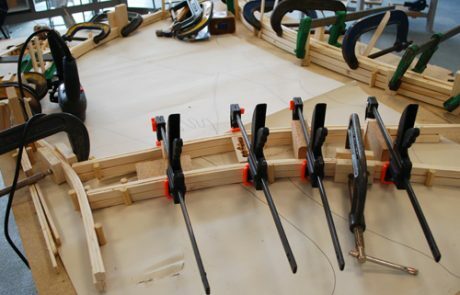 Taking Science out of the Lab – Park House School Newbury, Change Schools Through consultation with staff, senior leadership and students, Thinklockhart reviewed the internal mechanics of The Science Department enabling a highly effective change to take place. 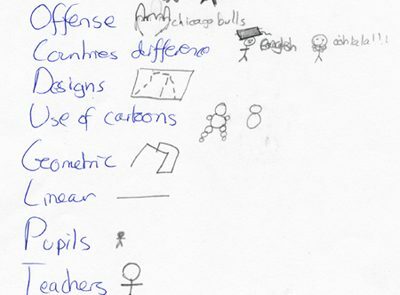 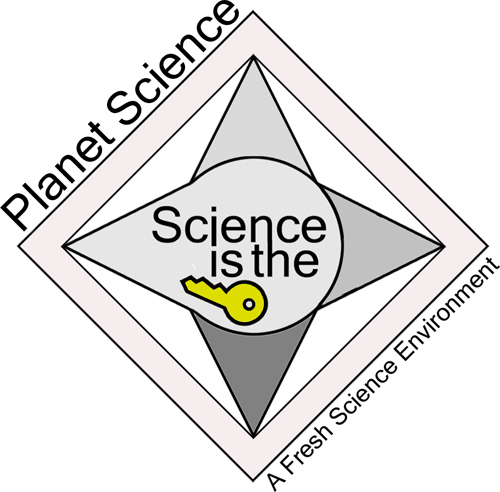 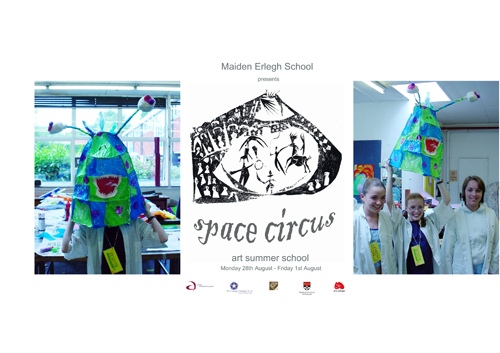 A series of considered activities within the school led to a program of mutually agreed events including a ‘Science Oscars’ awards ceremony and a departmental re-branding. 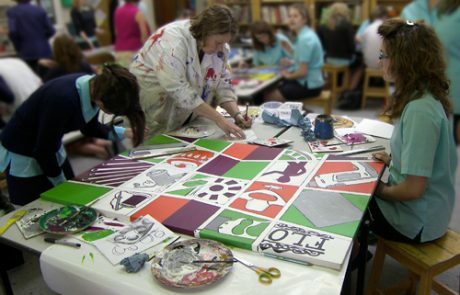 The project significantly contributed towards a renewed culture of achievement, celebration and understanding for all involved. 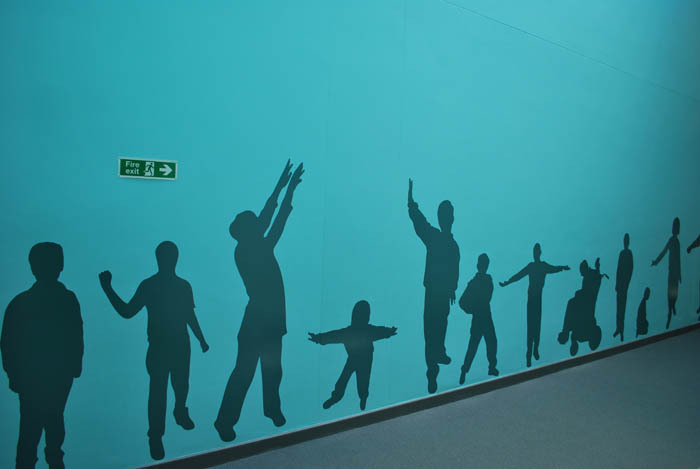 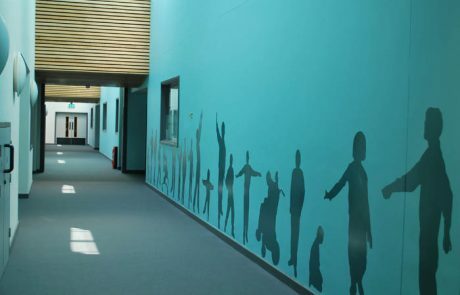 Wall vinyl displays at Addington Special School, Wokingham Using wall display vinyl, Thinklockhart created large mural images across areas within the school. The wall based art work depicted students and motivational text. 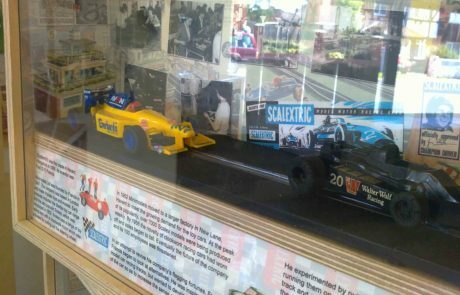 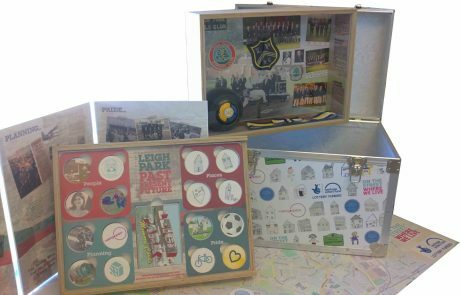 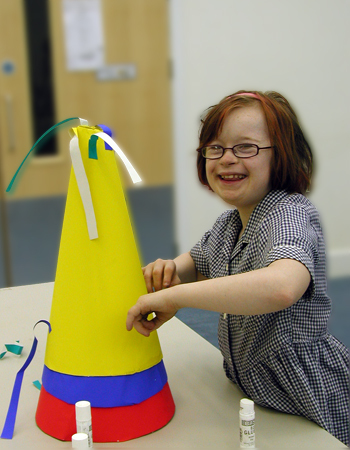 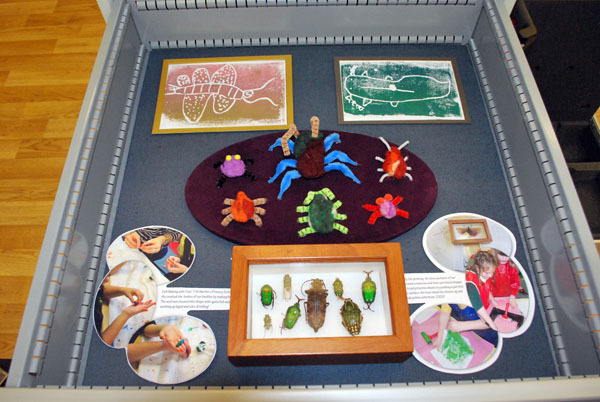 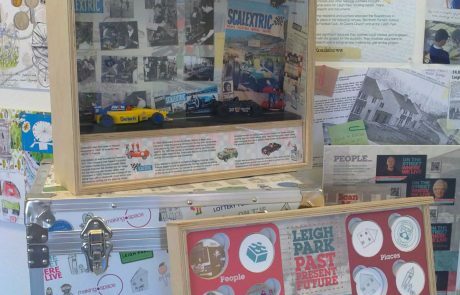 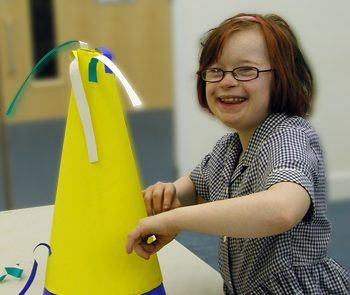 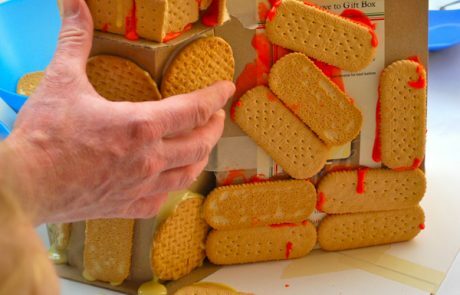 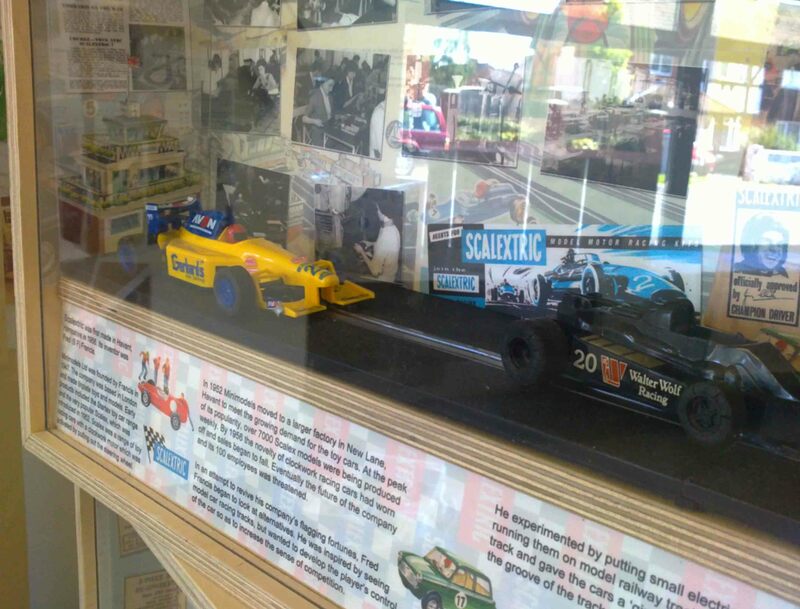 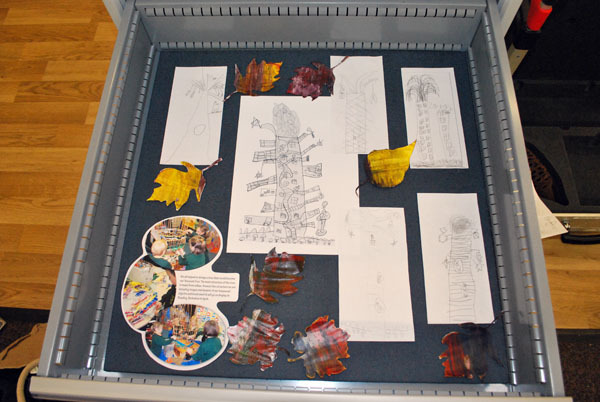 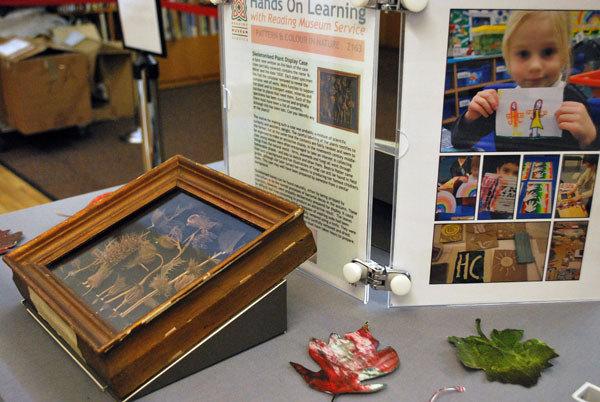 Part of a Creative Partnerships project, the displays were researched and produced during a residency period at the Special School. 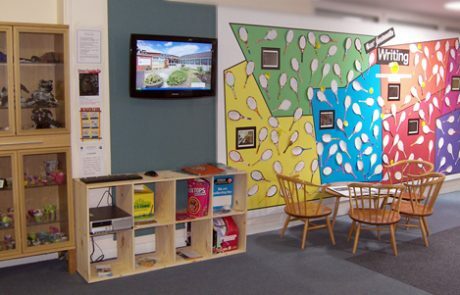 Change Schools Programme – St Joseph’s Catholic Primary School, Bracknell, Berkshire At St Joseph’s, we installed a real ‘home page’ in the school reception. 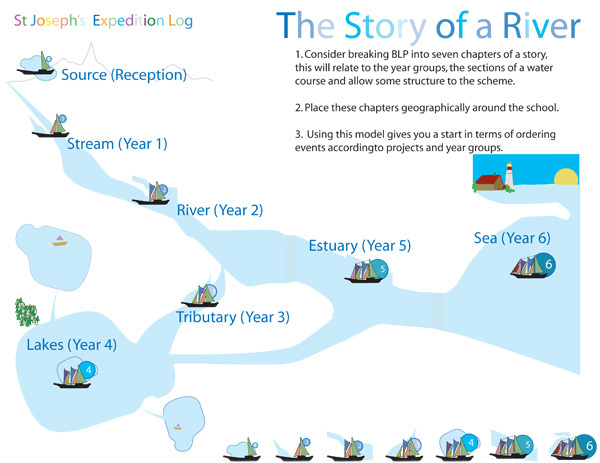 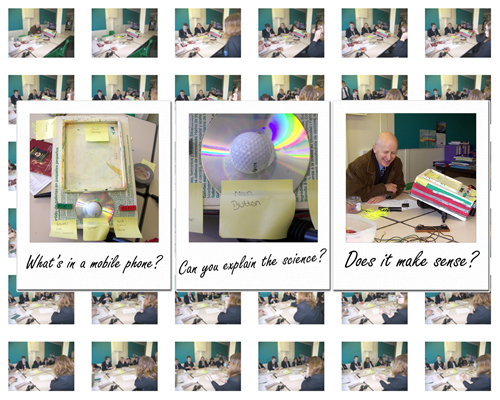 This allowed each year group to present digital and actual work almost as soon as it had been created. 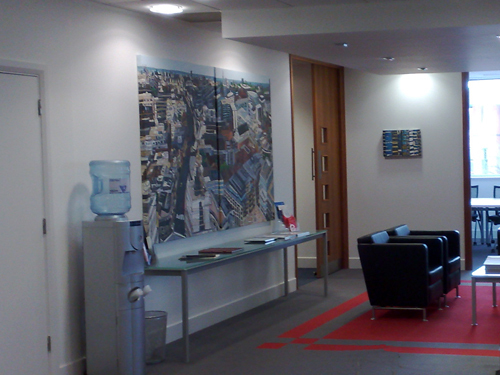 The magnetic board and display area acted as a focal point to the project. 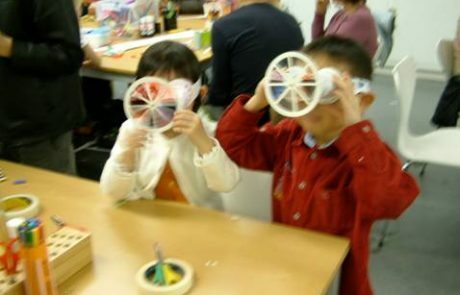 Looking at how the visual medium can improve teaching and learning was the inquiry question and through many activities, we have started to really impact on this. 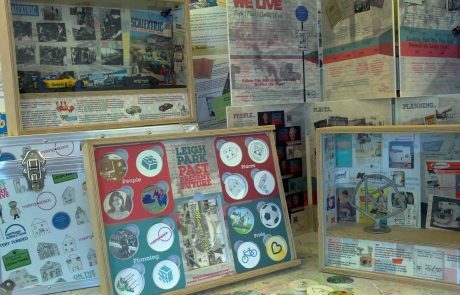 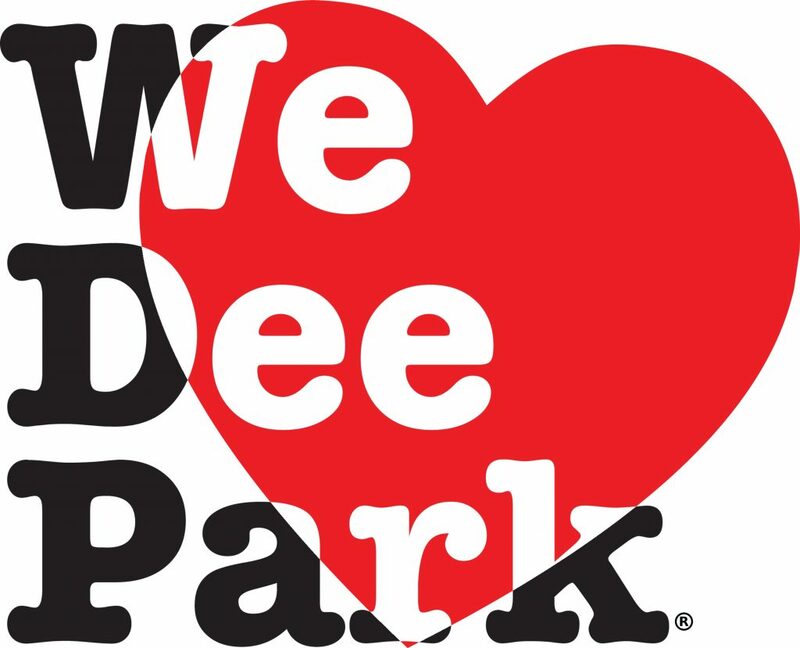 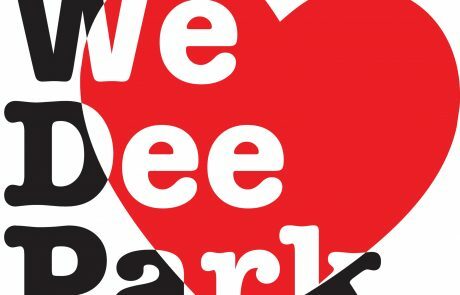 Dee Park Community Art Project Working with Catalyst Housing on a long-term community engagement project. 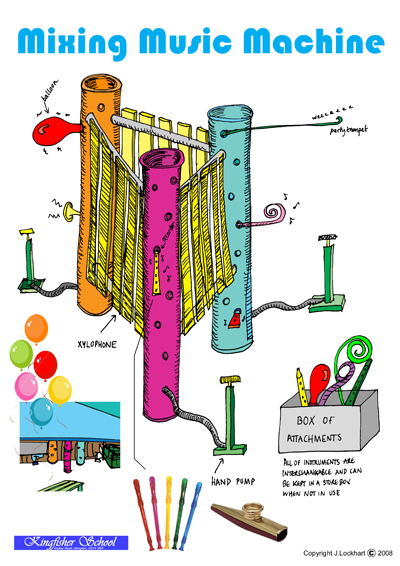 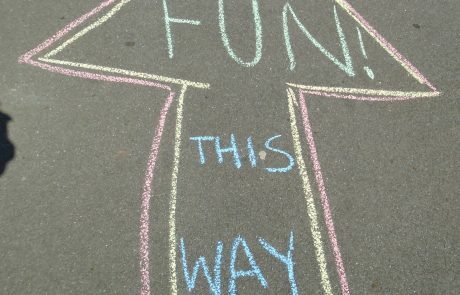 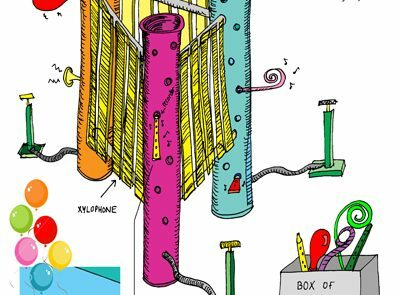 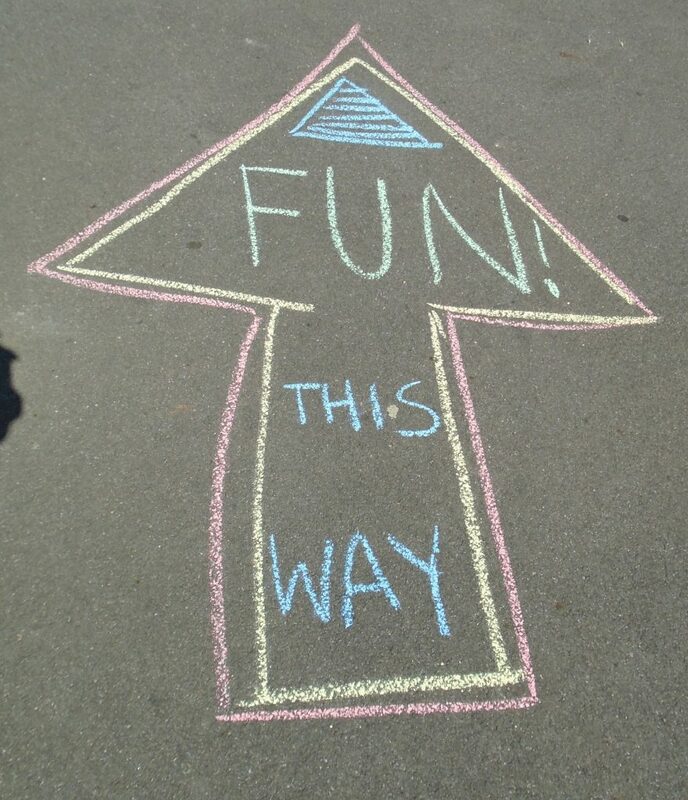 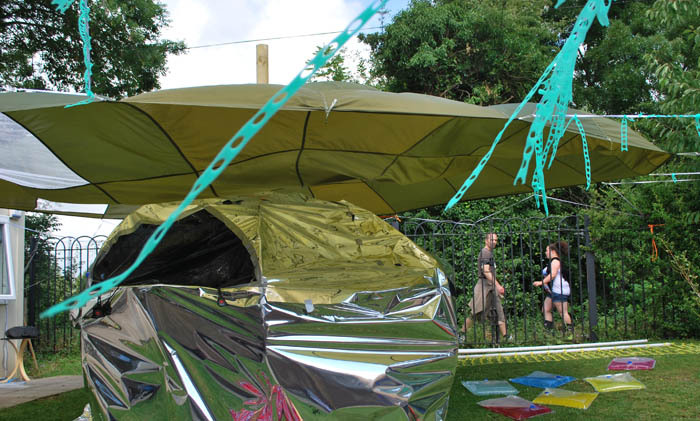 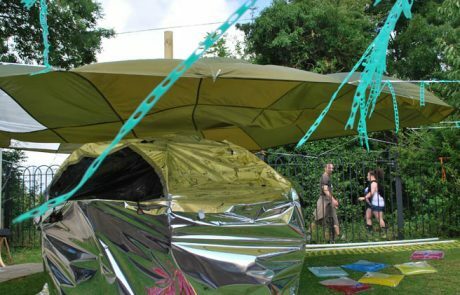 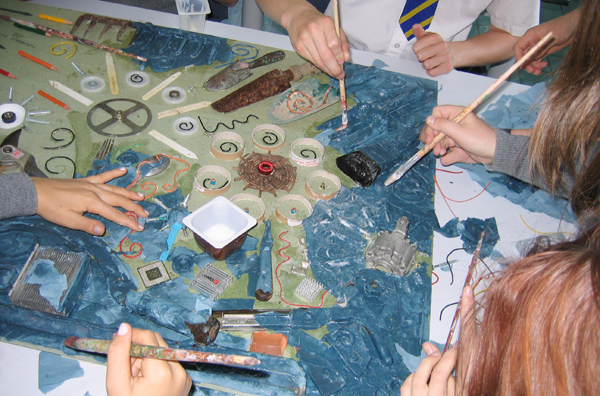 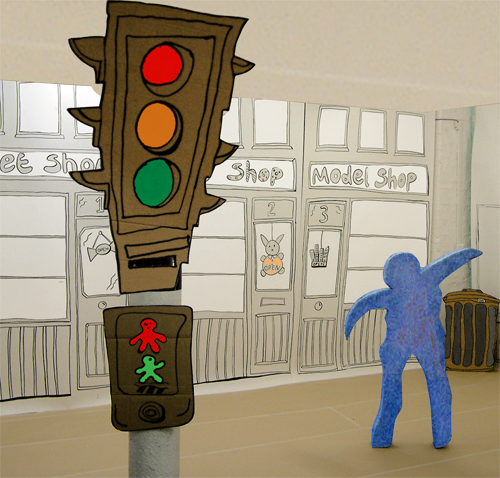 Exploring ideas for public artwork, participatory arts adventures and shared creativity. 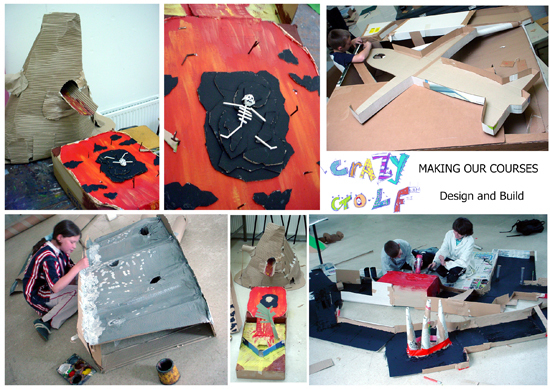 Creating new work specifically for clients, providing workshops, team events and creative sessions. 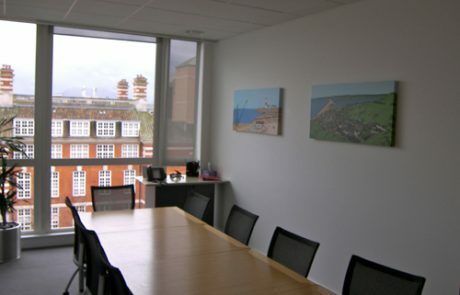 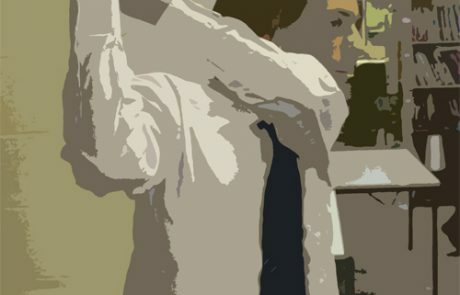 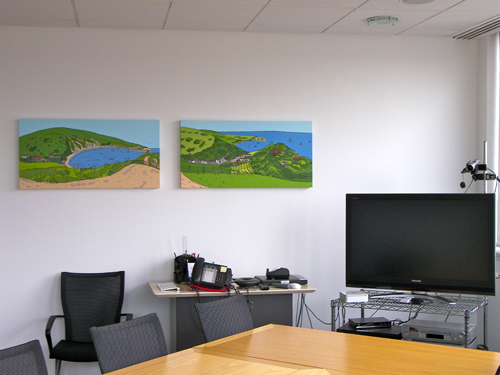 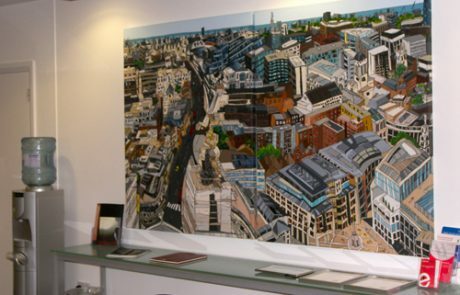 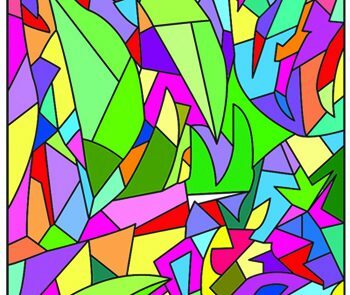 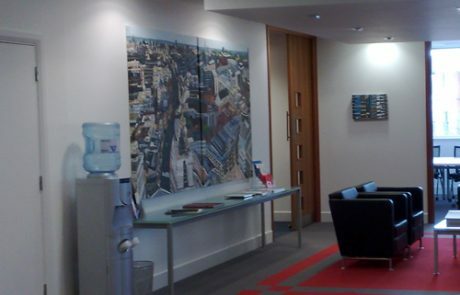 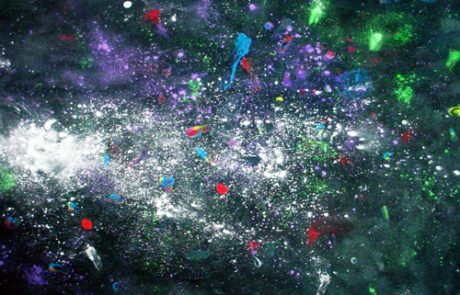 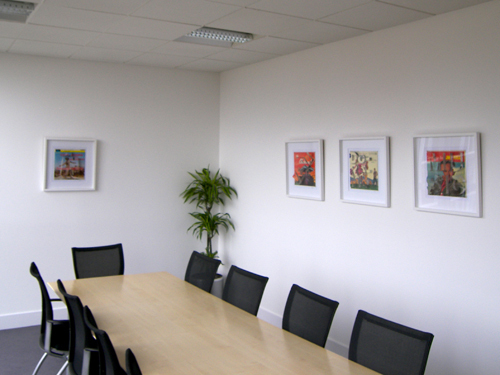 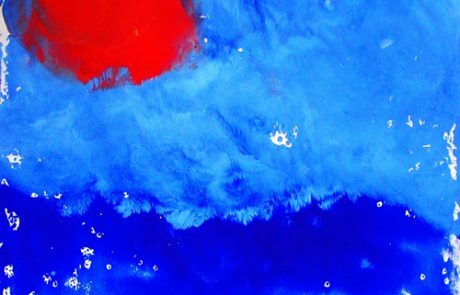 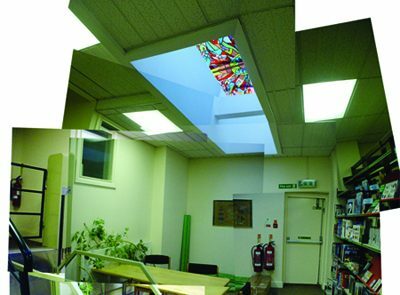 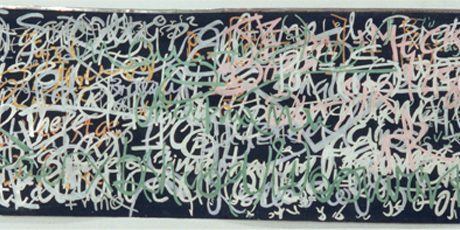 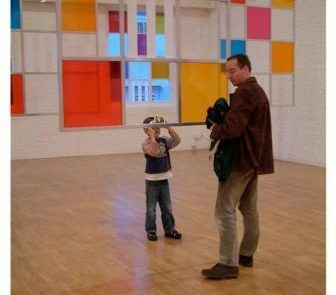 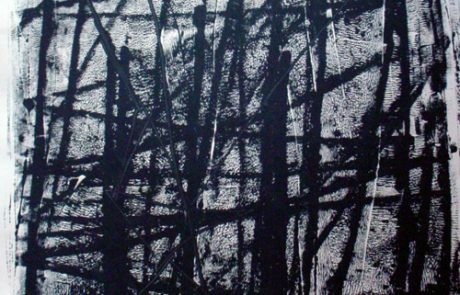 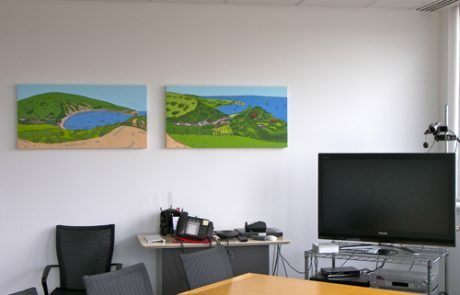 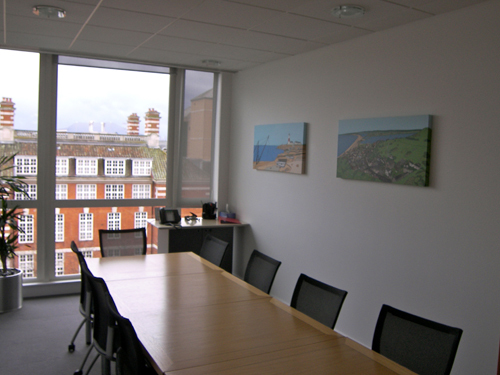 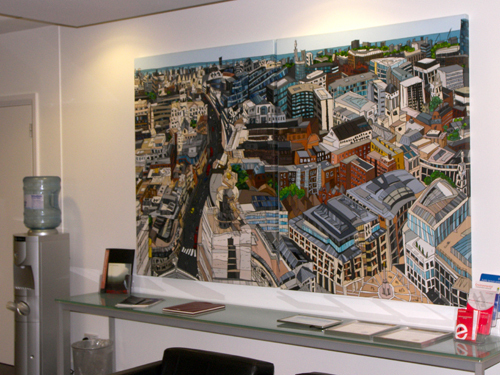 Art Loan Scheme – Clarks Solicitors, Reading, Berkshire We can provide a wide selection of art work for your office space, from curated exhibitions of original work through to large scale prints and reproductions. 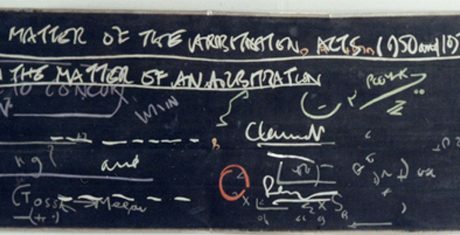 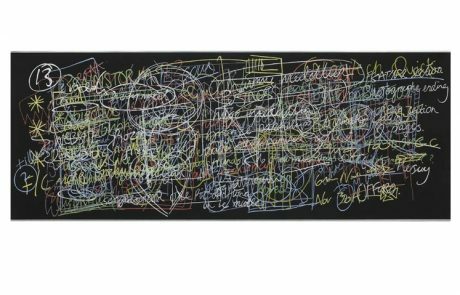 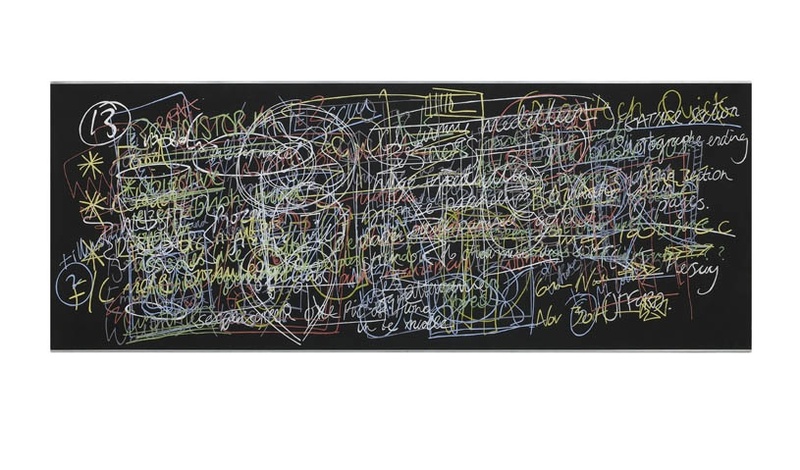 Blackboard Painting – John Brown Publishers, London Created for John Brown’s boardroom, the painting consisted of a collection of the staff’s doodles and sketches. 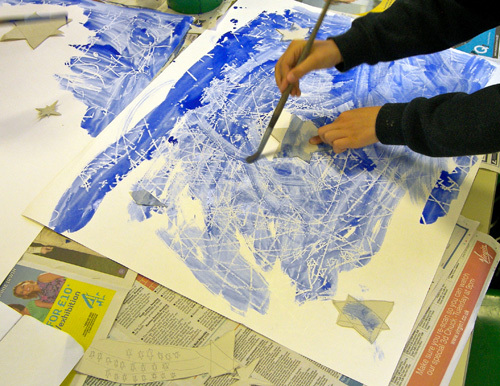 These fragments were worked into the painting to create layers of interspersed shapes and pattern. 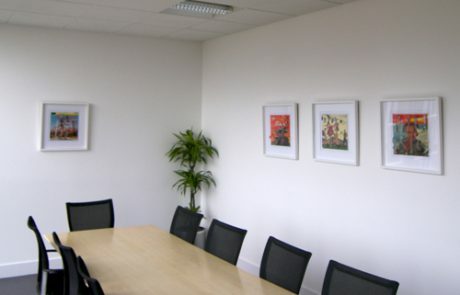 Wall Pieces Removable vinyl images and large scale printed wallpaper wraps enable workspaces to become thinking spaces. 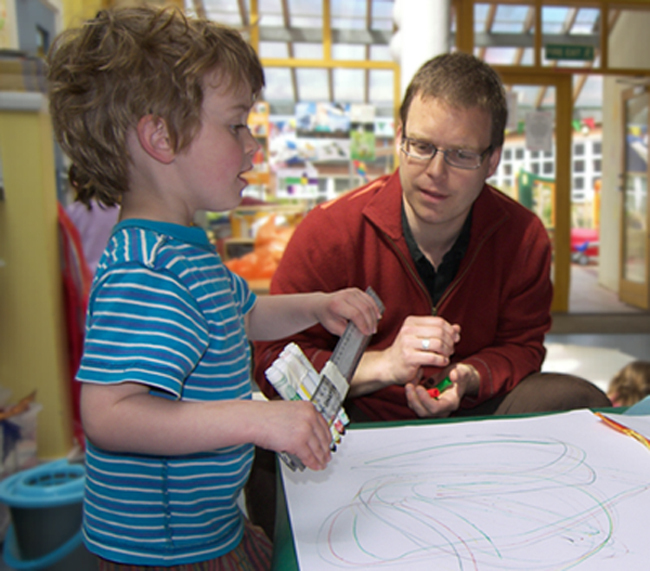 Kate and Jon are both qualified teachers. They work regularly within a wide variety of educational settings. Kate and Jon understand working within an educational environment and are considerate to this when negotiating projects with staff and students. 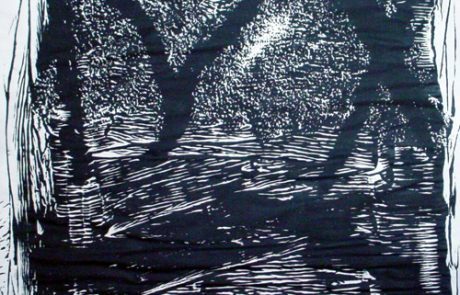 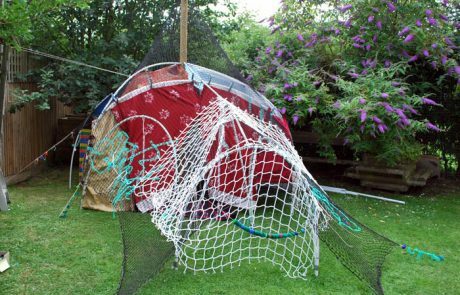 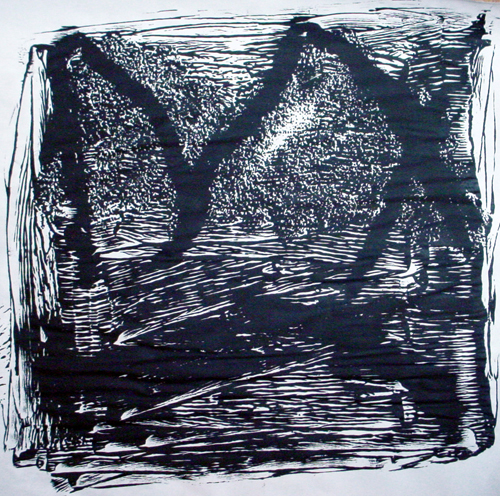 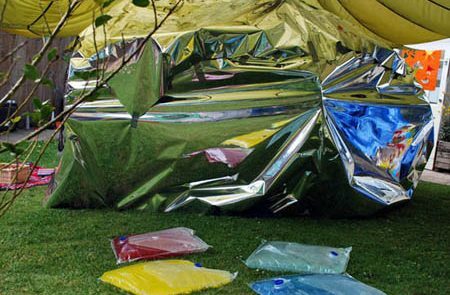 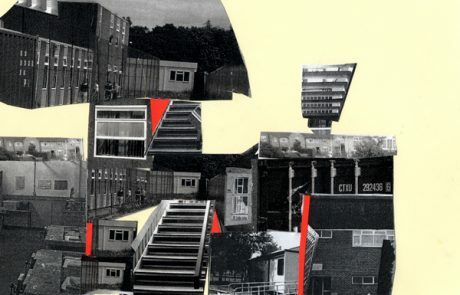 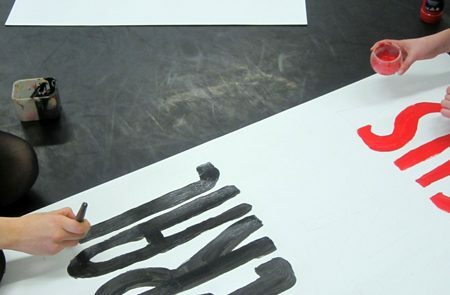 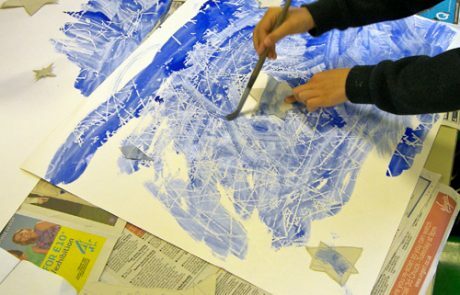 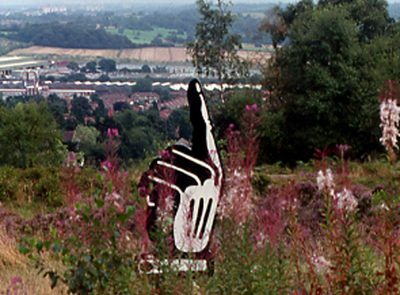 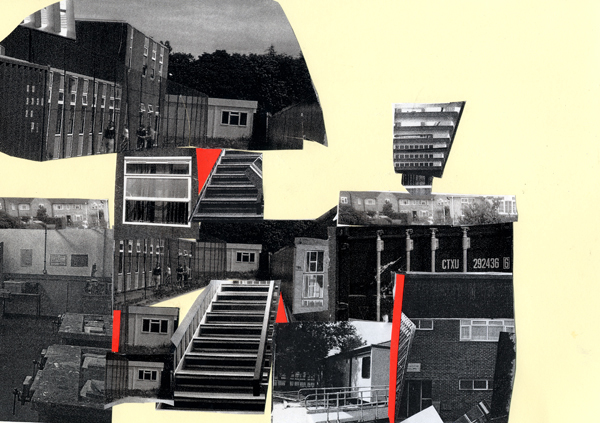 Young Artists Project – Segro and Creative Partnerships Based at St Bernards Grammer School, Slough and Chalfonts Community School, Buckinghamshire, Thinklockhart worked regularly over 2 terms in the respective art departments. 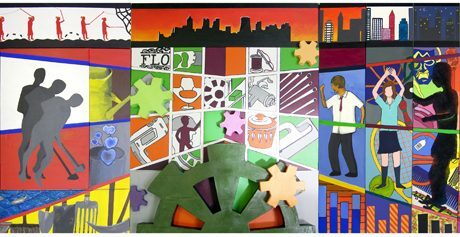 Each school had been selected by Creative Partnerships to take part in the project and the brief involved students producing a piece of artwork in response to the theme ‘World of Work.’ SEGRO sponsored the project and hosted an exhibition of the work produced in London. 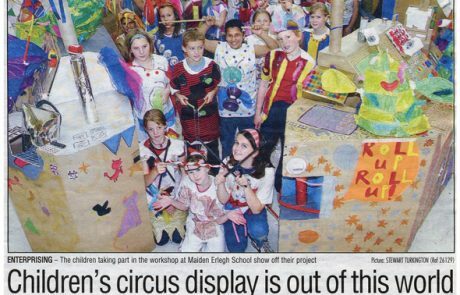 Shape and Layer, Maiden Erlegh School, Wokingham and eight feeder Primary Schools in the area This project involved coordinating, managing and running a dance and visual arts project based on shapes within eight separate Primary schools in the Berkshire region, leading to final performance and exhibition event. 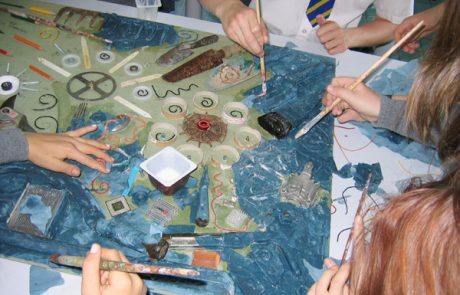 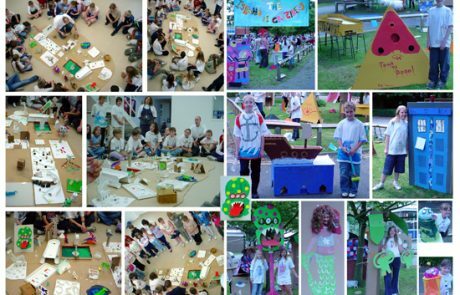 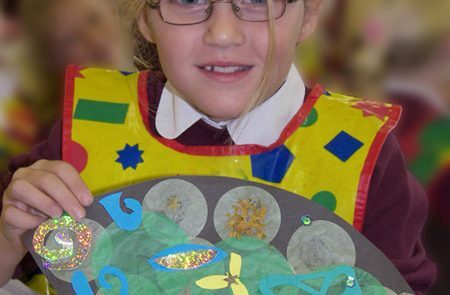 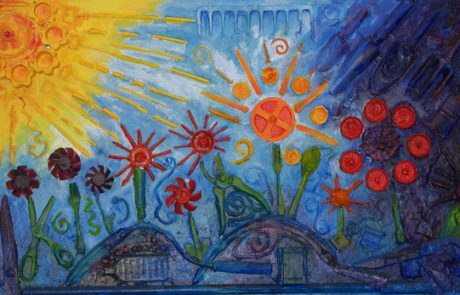 As lead artists we negotiated the content of all the art activities, delivered INSET training, lead practical sessions, provided teachers notes and evaluated the project as a whole. 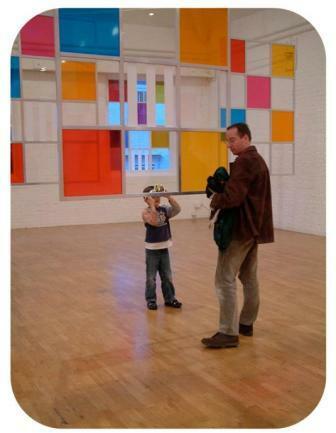 ‘Enviroscopes’ at the Daniel Buren Exhibition – Modern Art Oxford Thinklockhart has worked on numerous educational based projects with Modern Art Oxford, most of which are in response to the changing exhibition programme at the gallery. 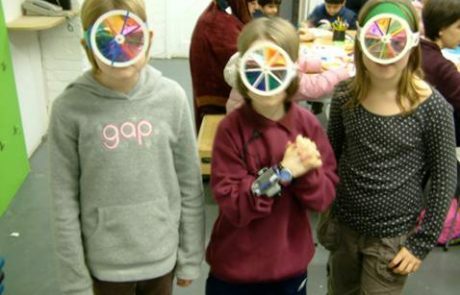 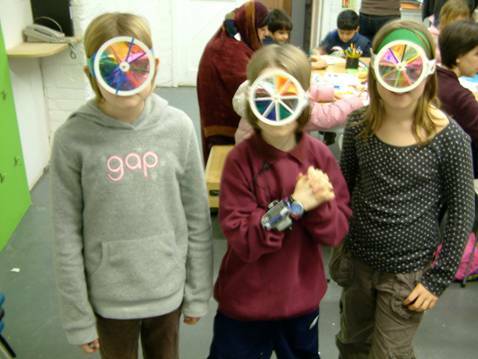 For the Daniel Buren exhibition at MAO, Thinklockhart designed ‘Enviroscope glasses’ for all the participants to make. 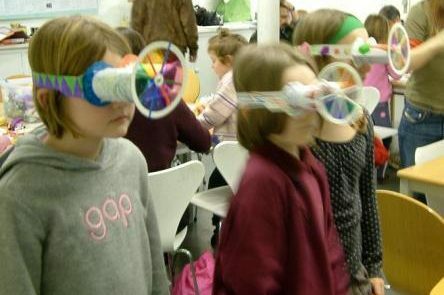 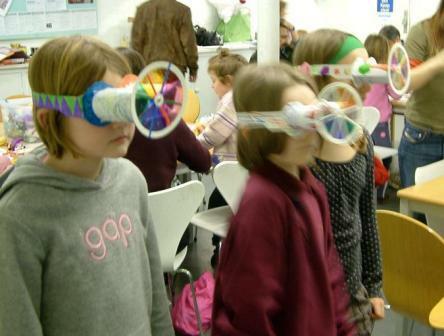 These unusual glasses allowed people to view and interact with the exhibition through a changing spectrum of colours and shapes whilst drawing what they experienced. 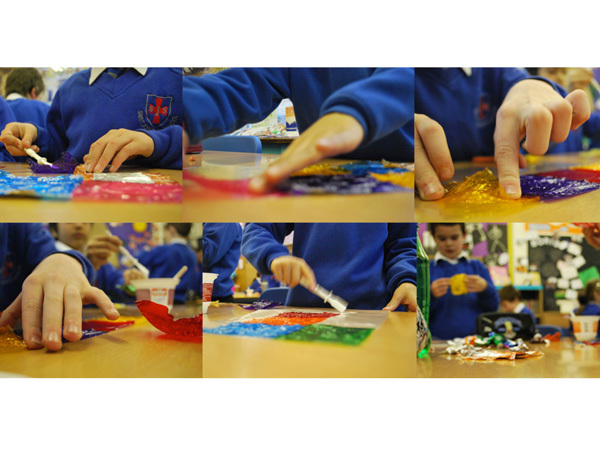 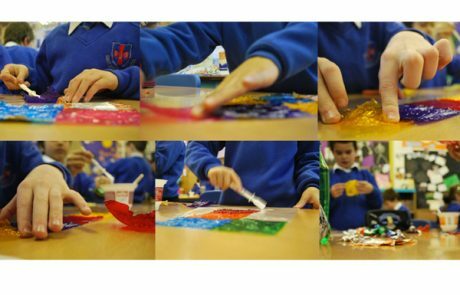 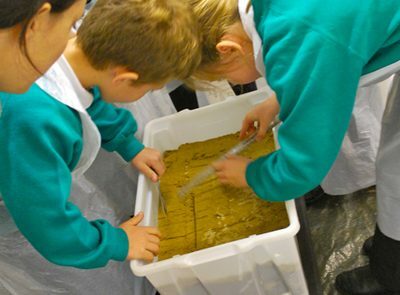 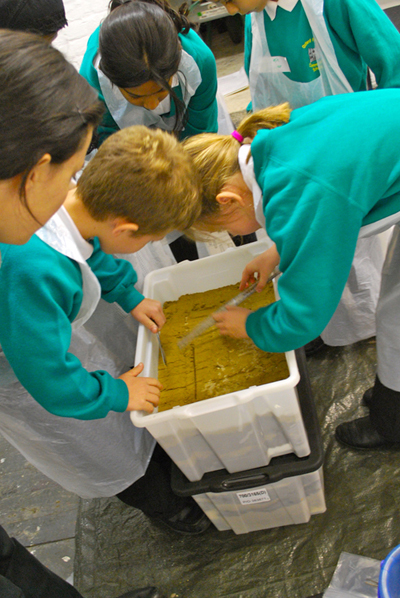 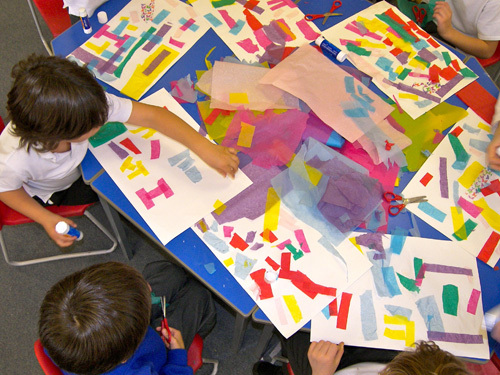 St Joseph’s Primary School, Bracknell, Berkshire Thinklockhart worked with Creative Partnerships and the school on their third year Change Schools program. 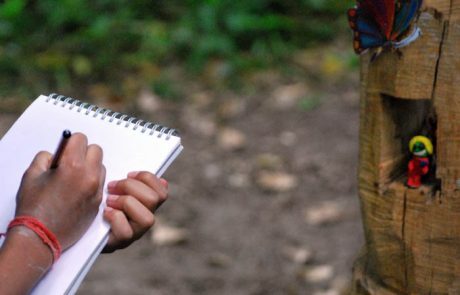 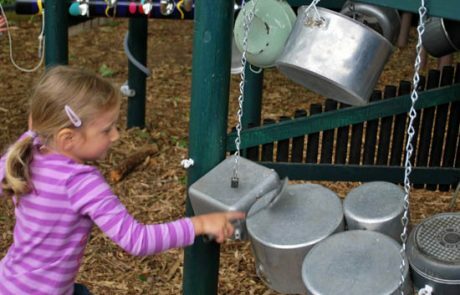 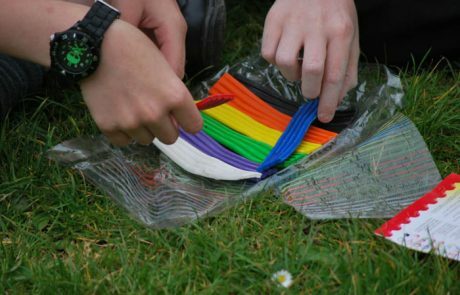 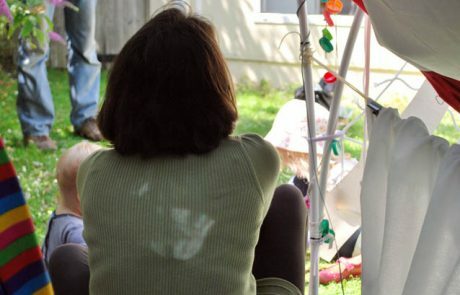 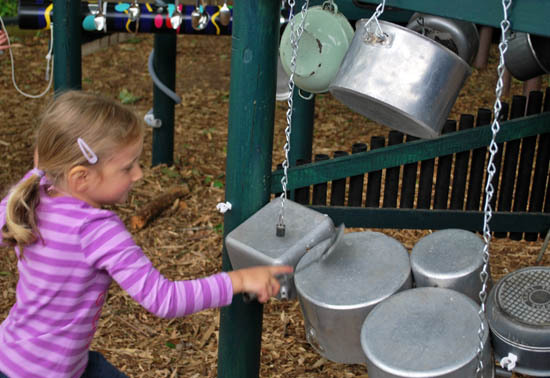 We looked at integrating outdoor learning environments into the curriculum as well as exploring and expanding upon their use of creative curriculum techniques. 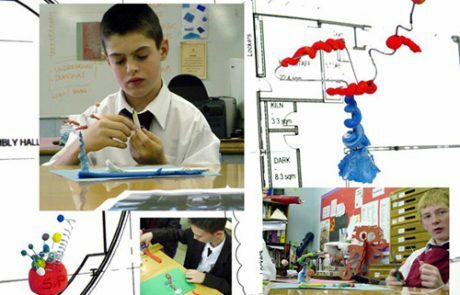 Parkhouse Academy, Newbury, Berkshire The Creative Partnerships project at Parkhouse Academy has explored the ways in which exploratory learning can enhance the overall attainment of pupils across all subject areas. 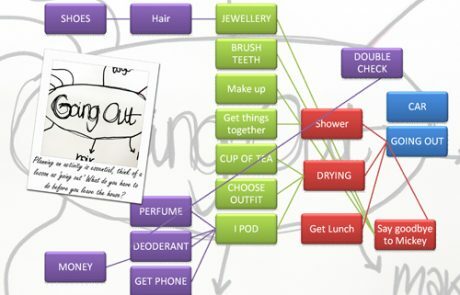 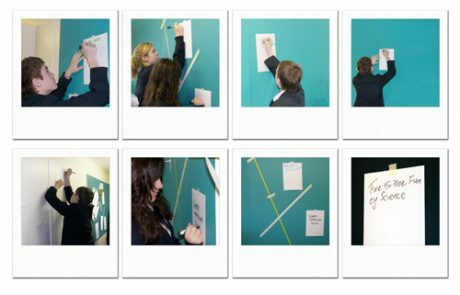 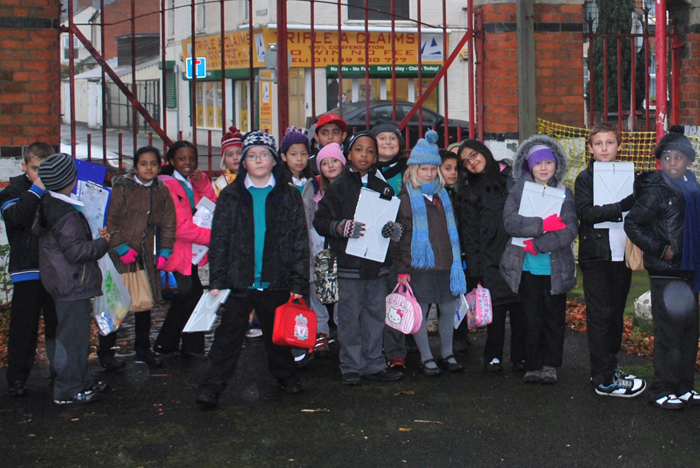 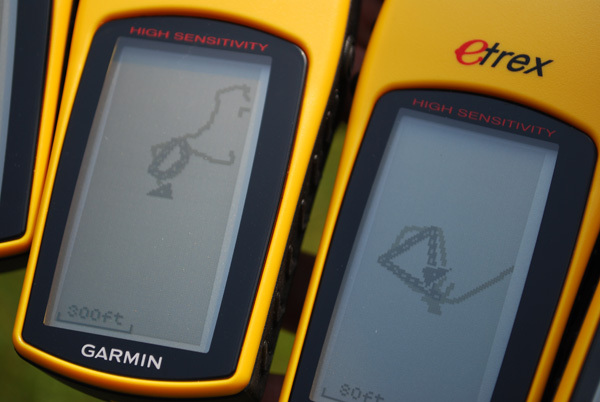 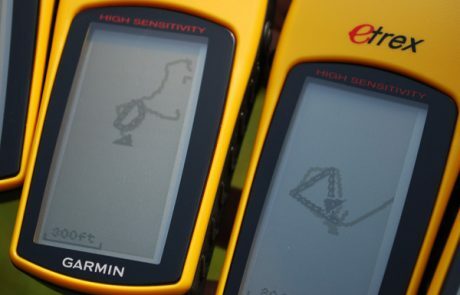 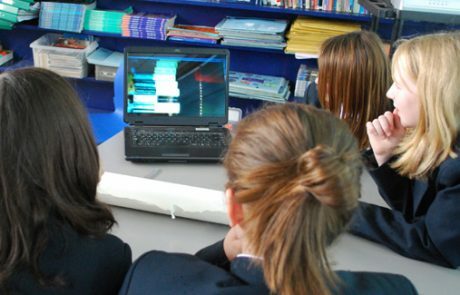 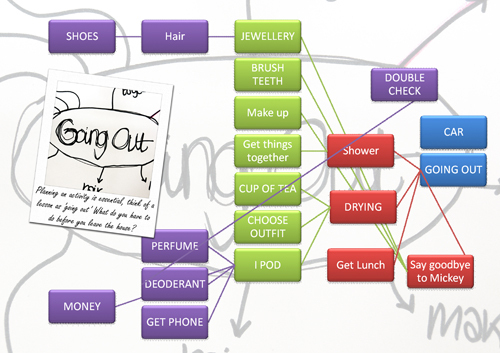 Thinklockhart have employed a wide range of methods during this project including G.P.S trackers and film making. 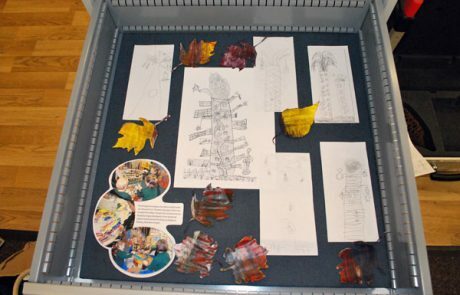 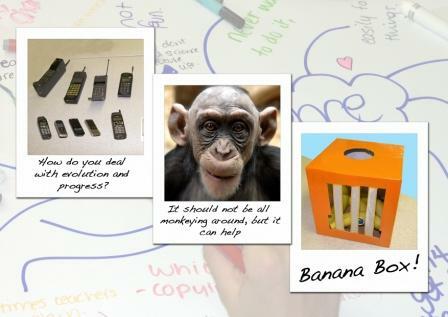 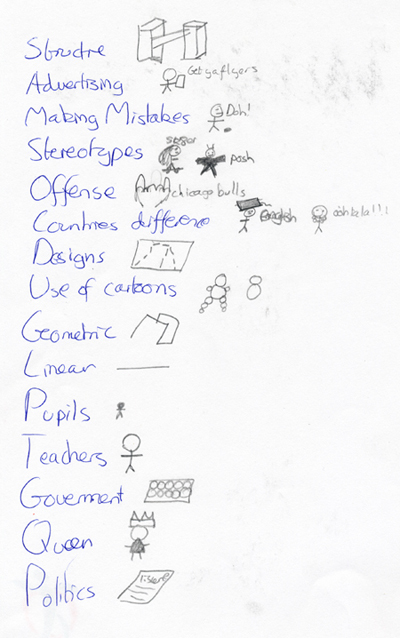 The Windmill Primary School, Oxford Thinklockhart worked alongside year 6 staff and students to create ideas for interactive displays around the school. 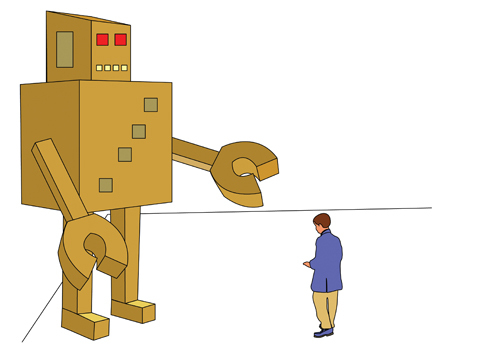 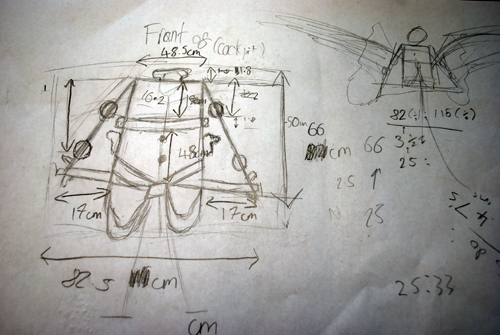 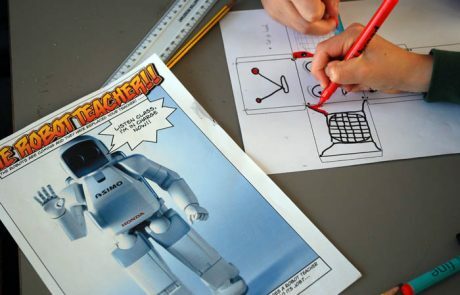 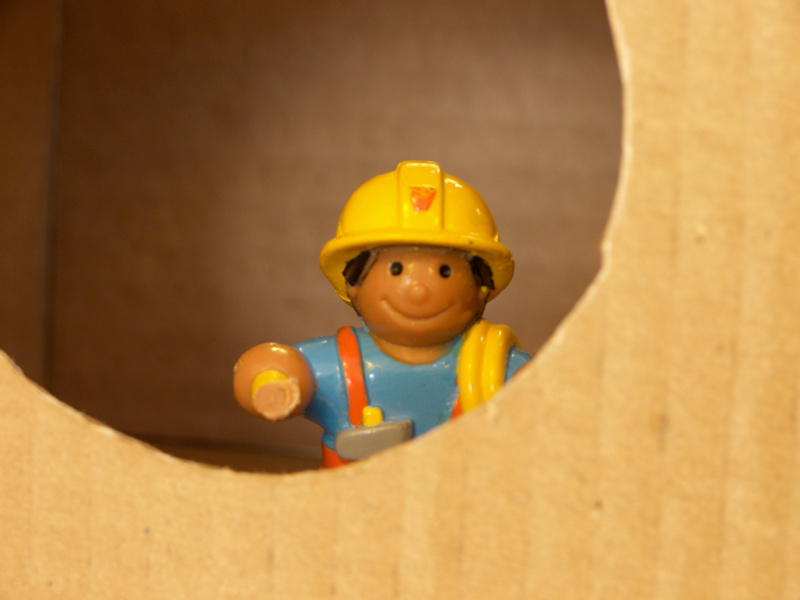 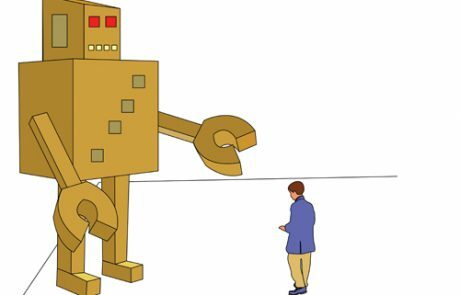 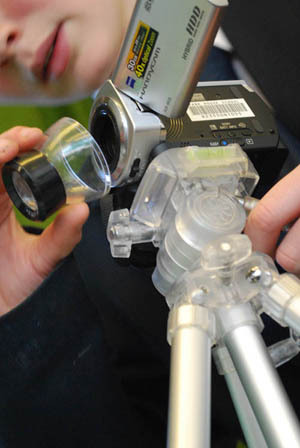 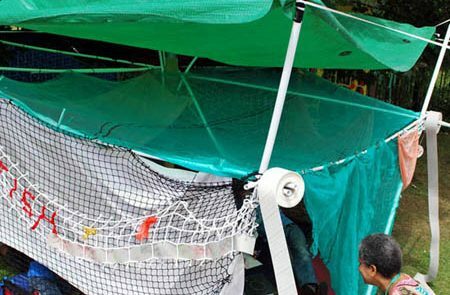 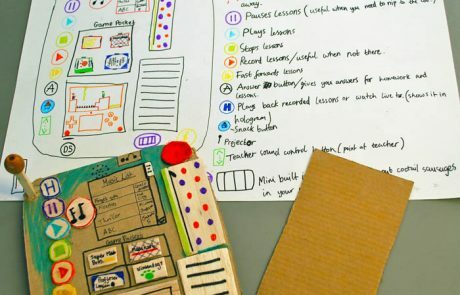 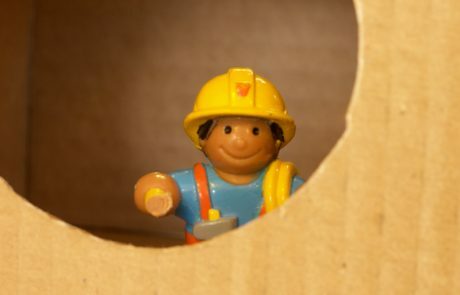 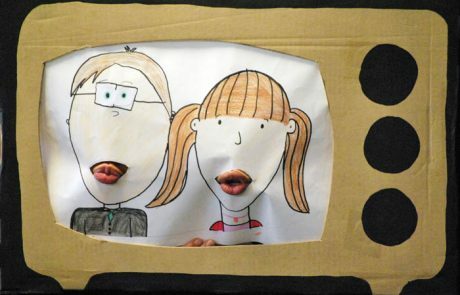 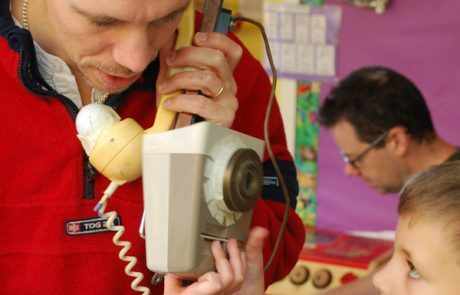 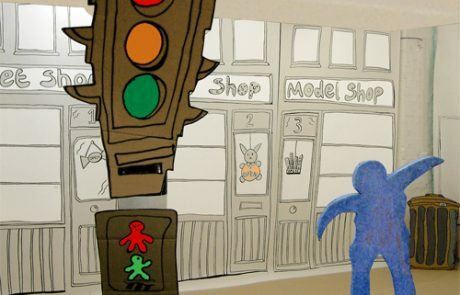 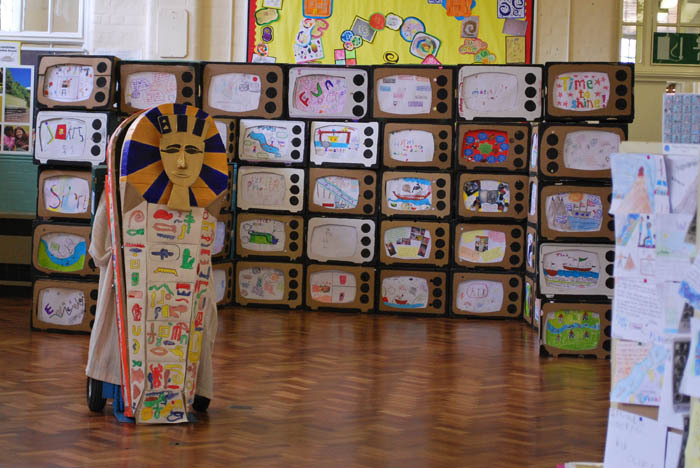 We explored ‘pop-up’ fashion shows, remote controlled teachers and teacherbots! 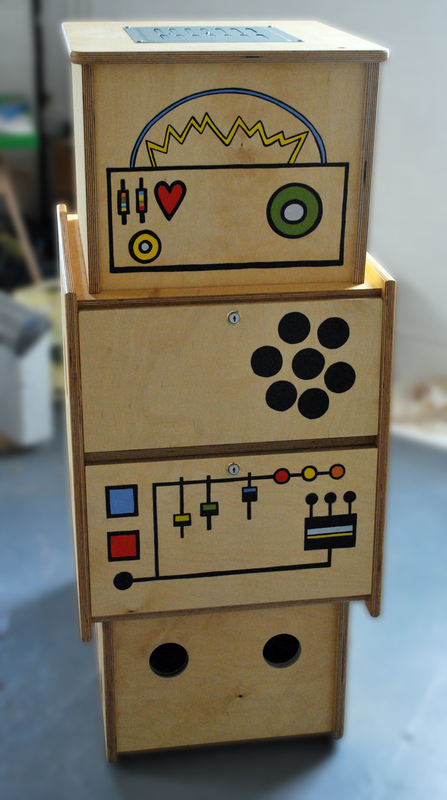 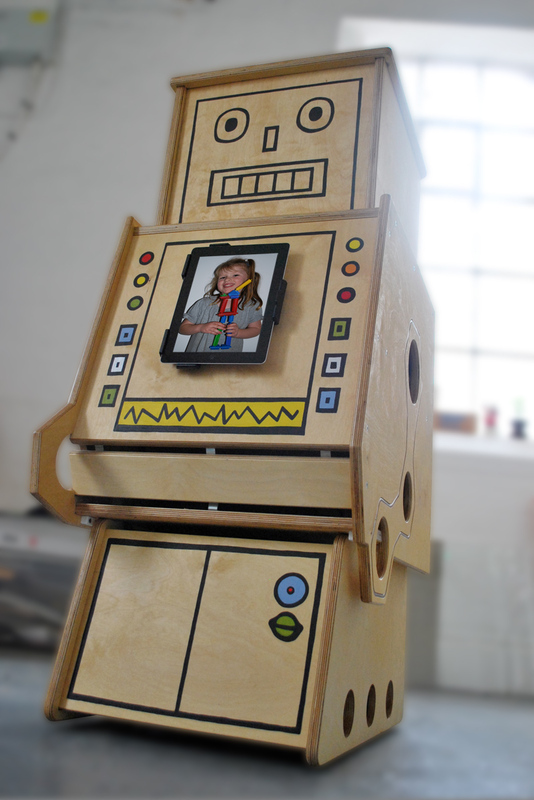 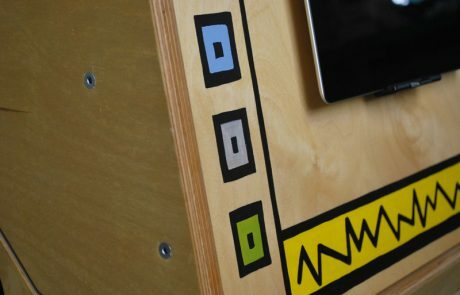 The final displays will have an added feature of a robot that visits each classroom to help with the class activities! 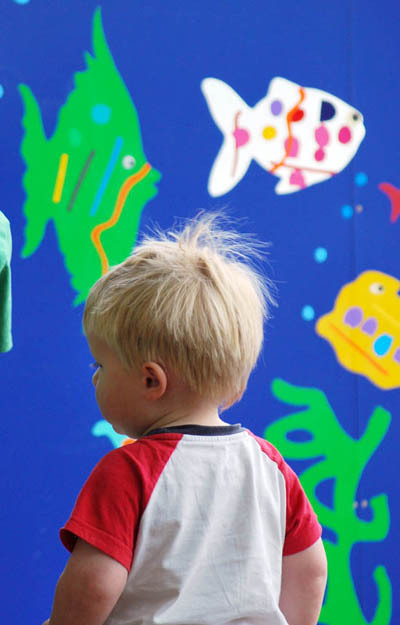 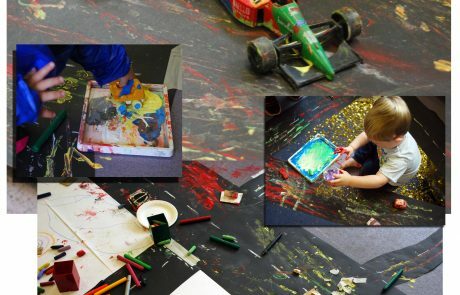 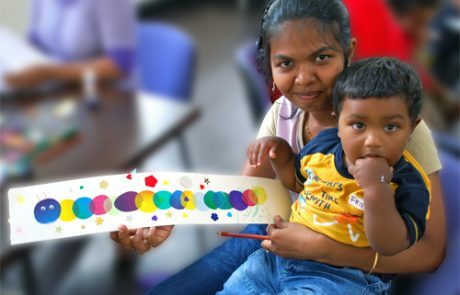 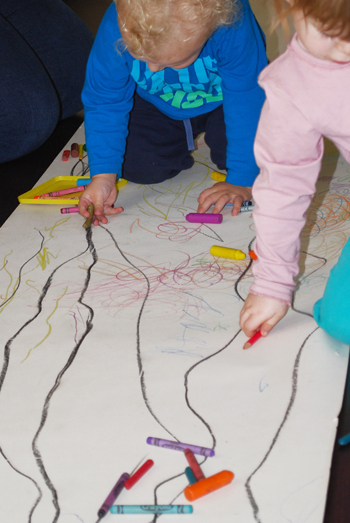 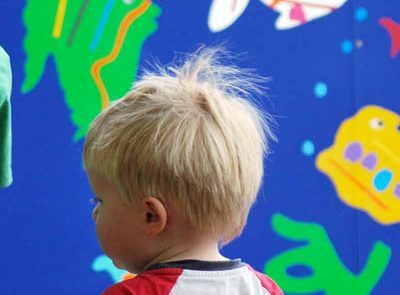 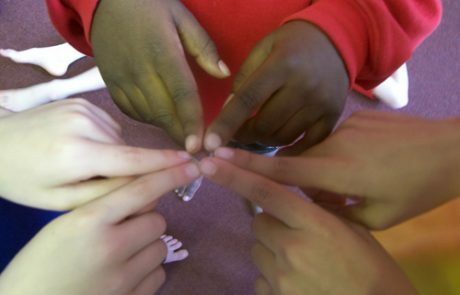 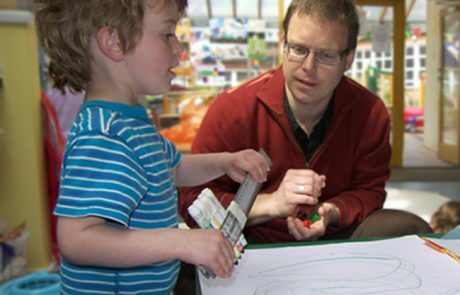 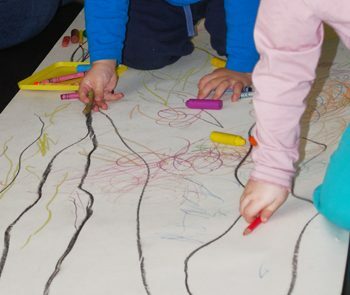 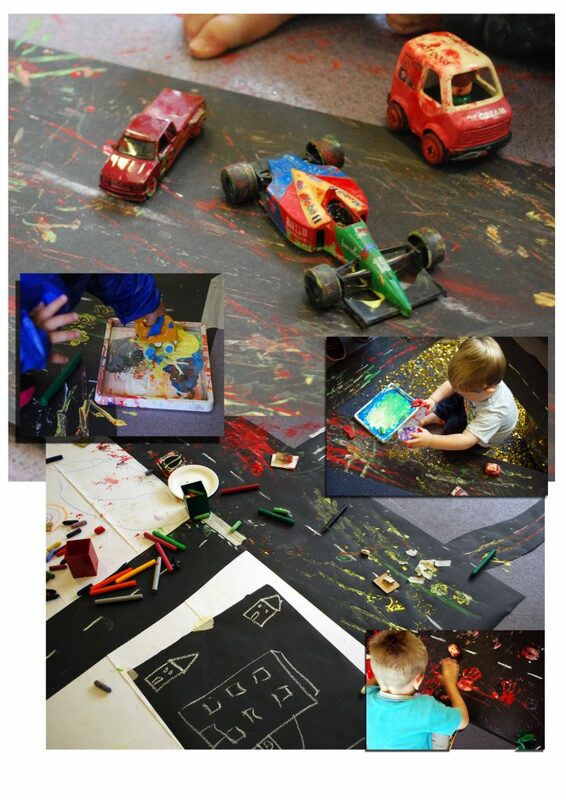 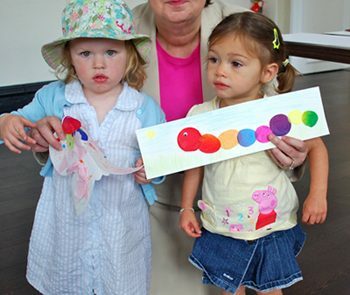 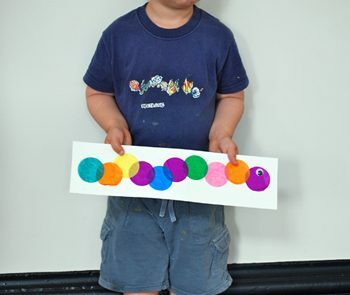 Grandpont Early Years- Oxford Thinklockhart have delivered a number of sessions at the centre, most recently a mark making week and a listening and learning week.ThinkLockhart spent a week working alongside carers and their children over at Grandpont Children’s Centre in Oxford. 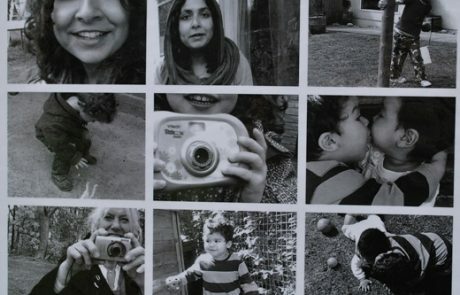 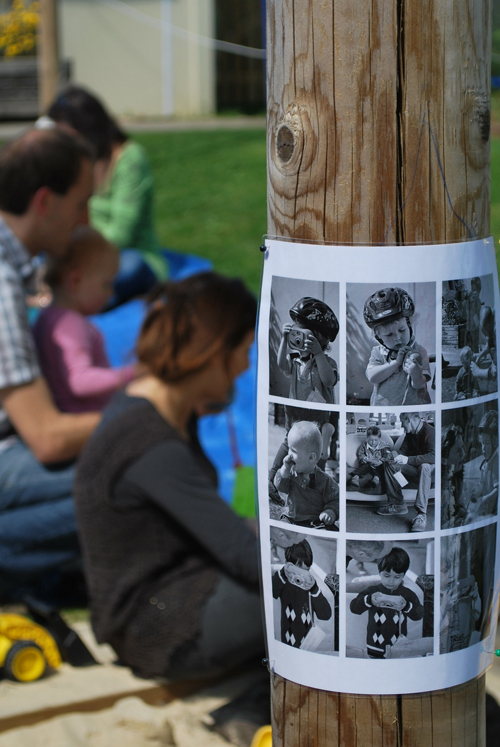 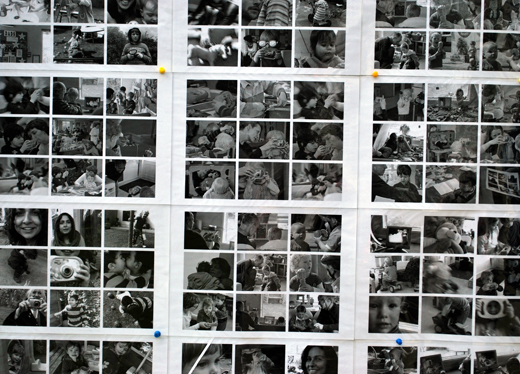 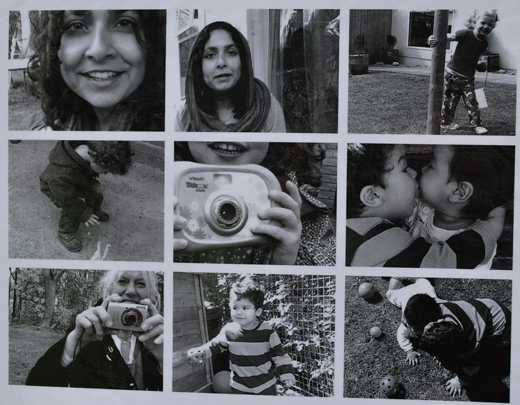 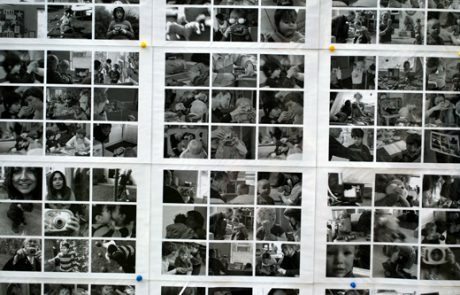 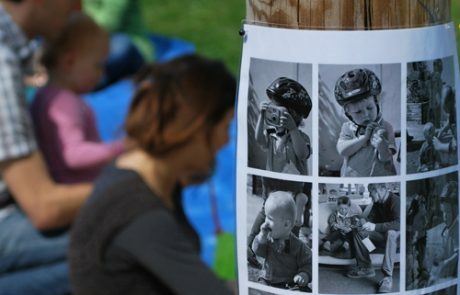 We used photography to enable carers to share their children’s perspective and to develop a sense of listening to their needs. 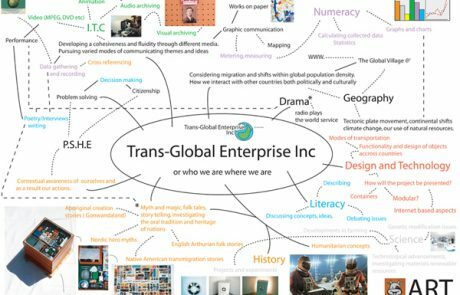 Trans Global Enterprises Ltd, Artist in Residence, The Forest School, Winnersh. 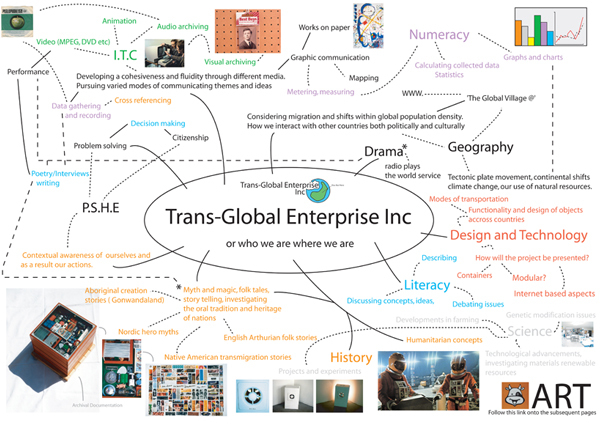 Trans Global Enterprises Ltd was a project looking at the nature of international communication through business and art. 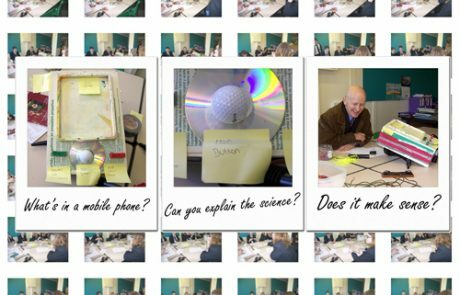 The participants created an imaginary company and then spent the residency period developing ideas and scenarios within this company. 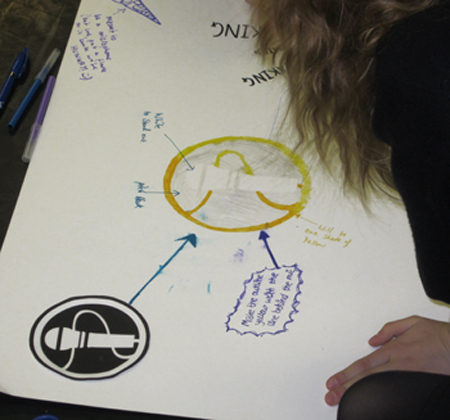 Key stage three students looked at the nature of the business in terms of products, services and the visual identity of the ‘corporate brand’. 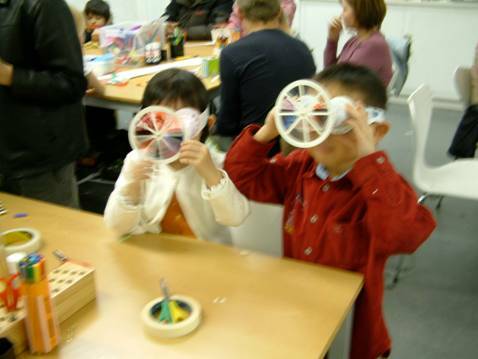 Older students began to think about the dynamics of business and the work place. 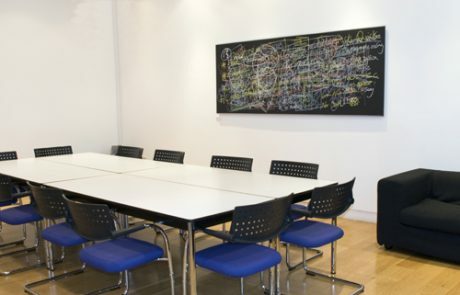 They performed boardroom PowerPoint led presentations and started to bring in elements such as corporate espionage and insider trading. 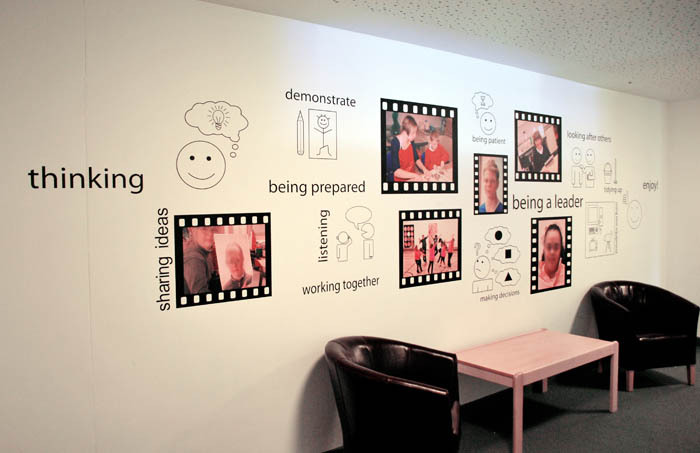 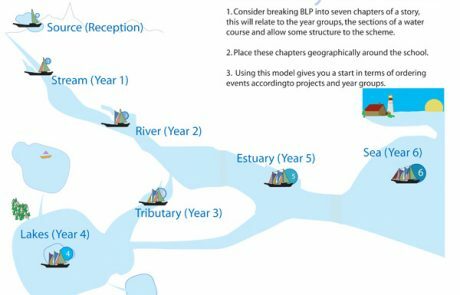 The framework of the project can be extended and built around many different curriculum areas and offers a superb meeting point for philosophy for kids, citizenship, ethics and across years team building. 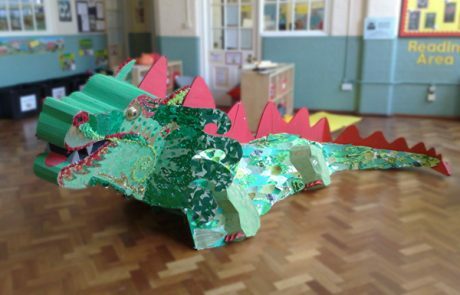 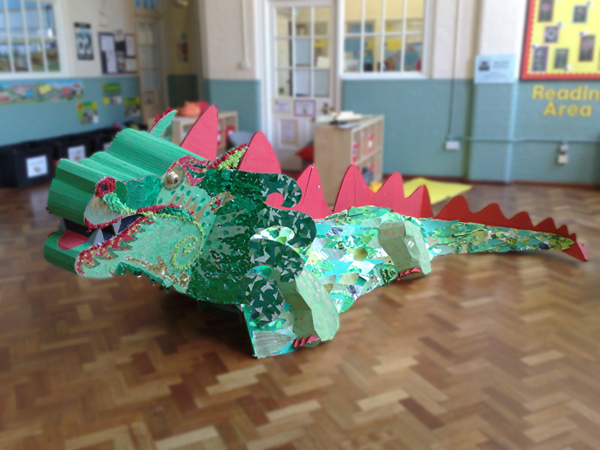 George’s Dragon, Wilson Primary School, Reading, Berkshire Working with all year groups, Thinklockhart helped students to create this fantastic giant dragon. 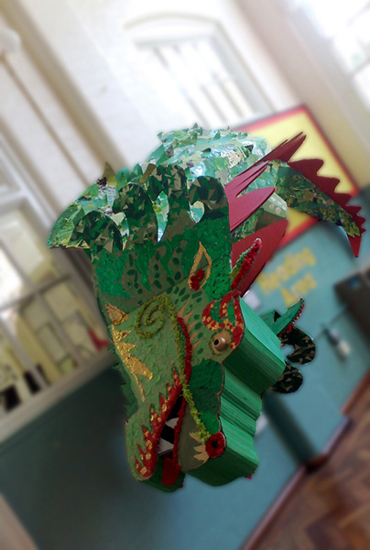 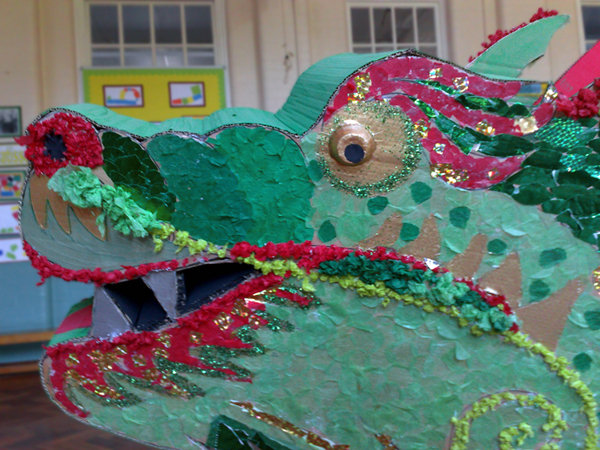 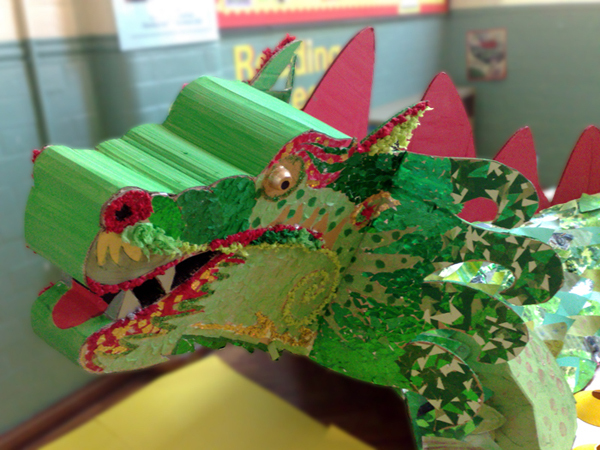 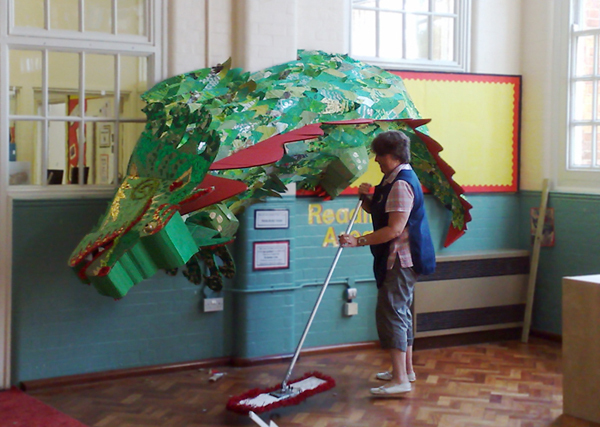 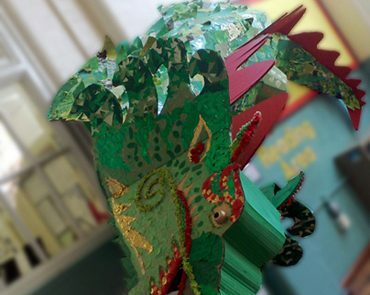 The beast was installed in the main hall on the wall, greeting visitors and keeping an eye on the children! 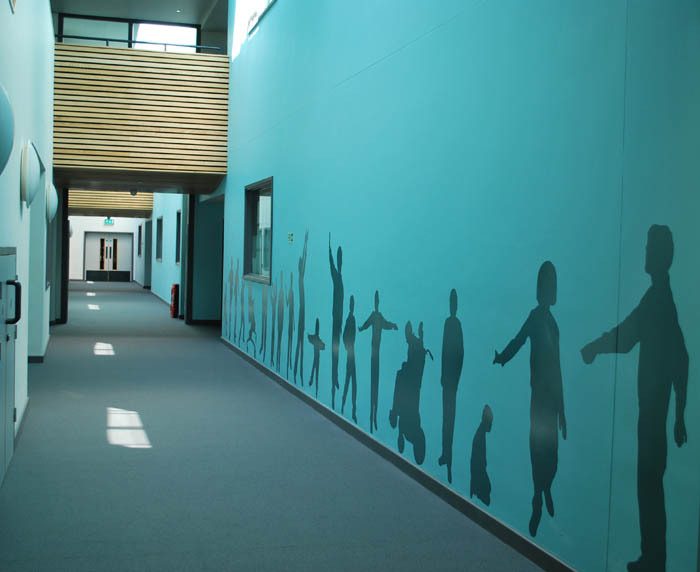 Larkmead Secondary School – Abingdon. 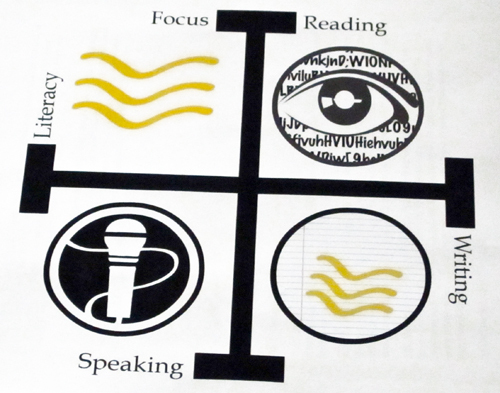 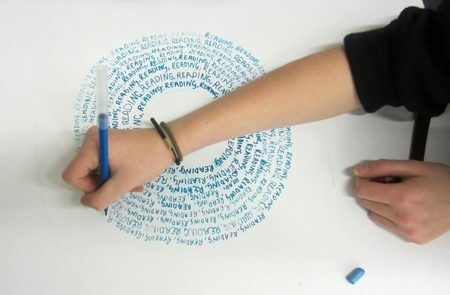 Literary Focus A project to develop a set of symbols to promote literacy across the whole school. 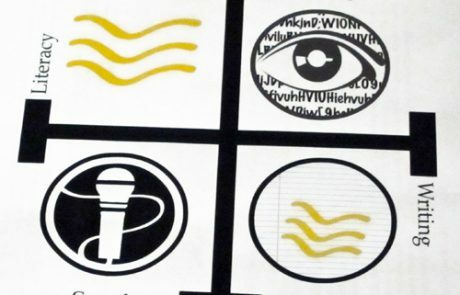 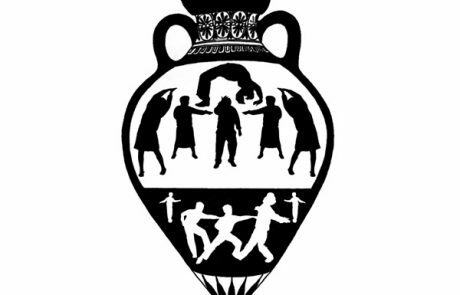 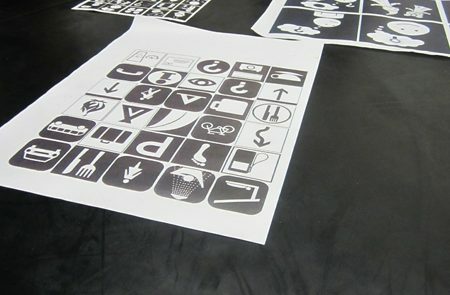 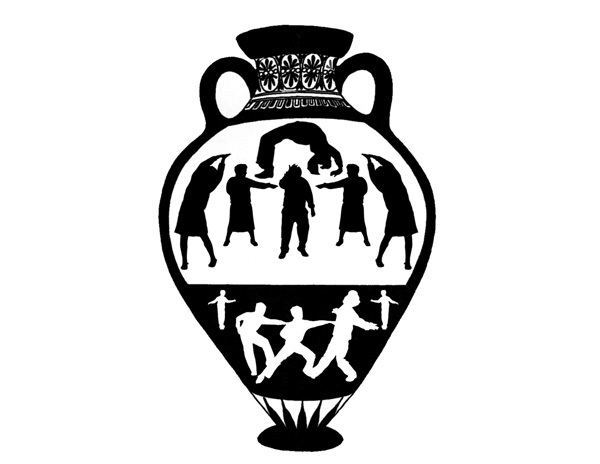 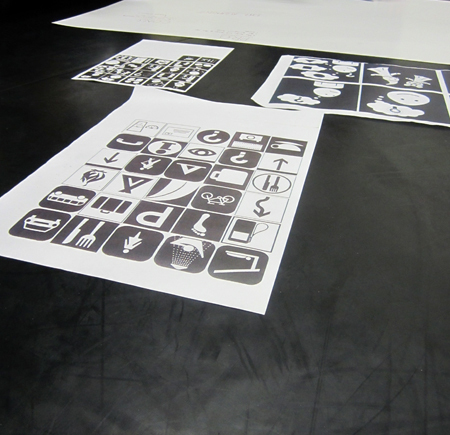 We worked with a stunningly talented team of year 9 students to explore the ideas behind symbols and to develop some images to be used by around the school. 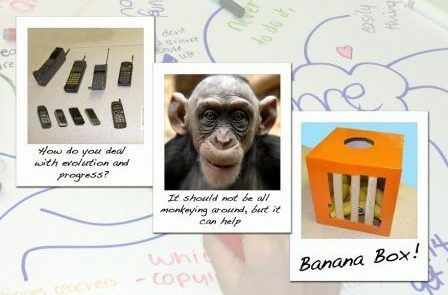 Working to a brief or creating bespoke events from initial concept through to realisation, documentation and evaluation. 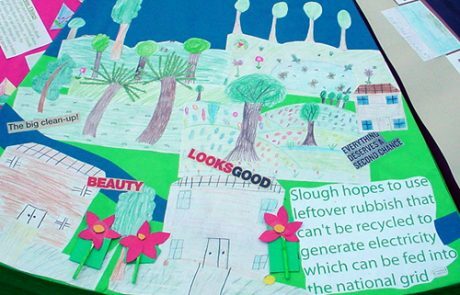 National Art Bridging Event – Tate Britain, London Following a group visit to the Turner, Whistler and Monet Exhibition at Tate Britain, children from National Childrens Home, Milton Keynes worked alongside Thinklockhart to create work in response to the exhibition. 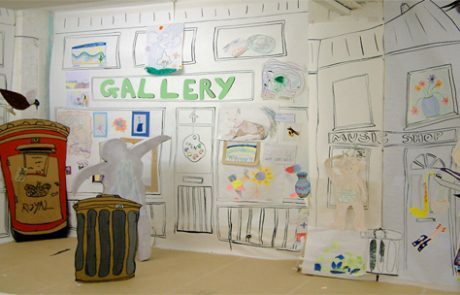 The work was documented and displayed alongside the exhibition in a virtual gallery in the entrance to Tate Britain. 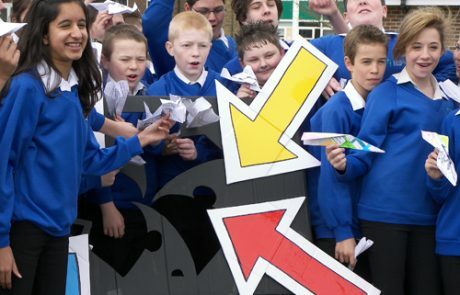 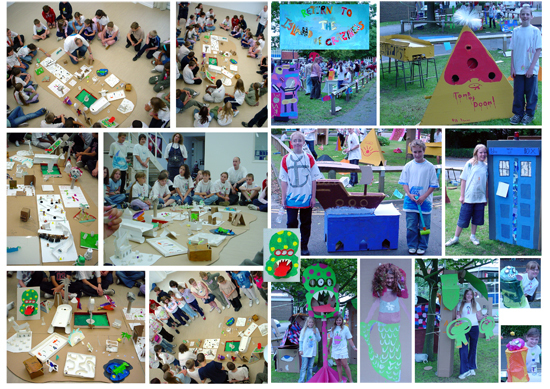 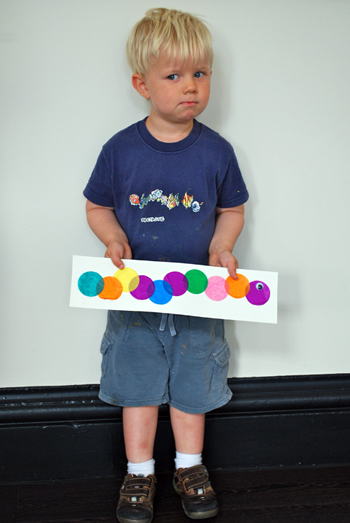 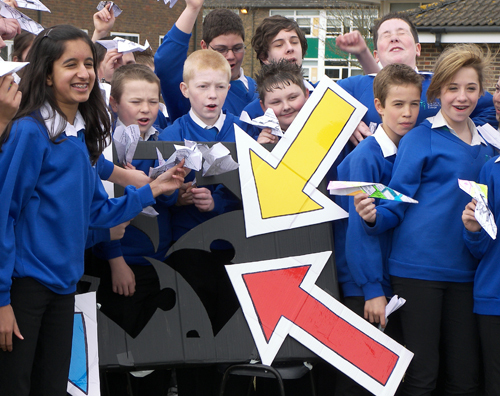 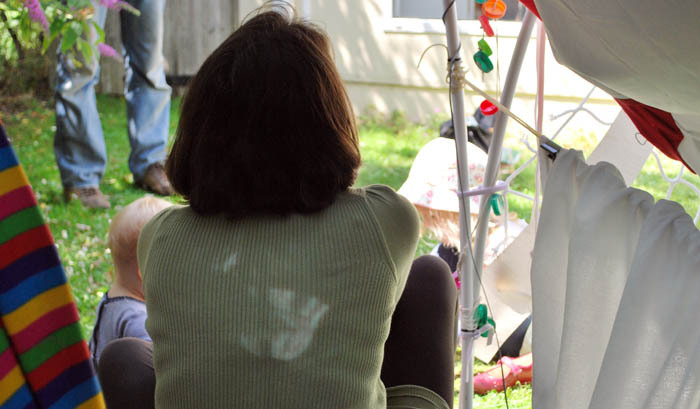 Images from our sessions were used to promote the entire project Nationally. 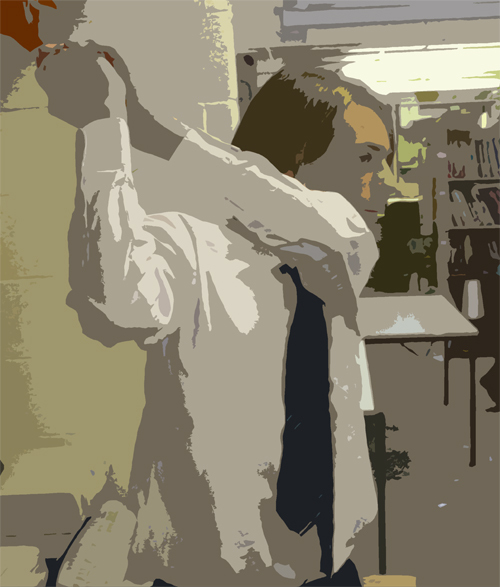 The Landing, Oxford School A performance event, working alongside A level students to present work that the whole school could engage with, experience and enjoy. 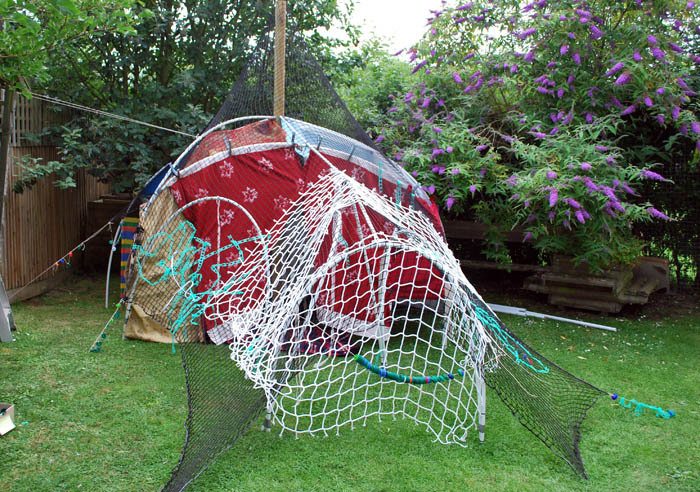 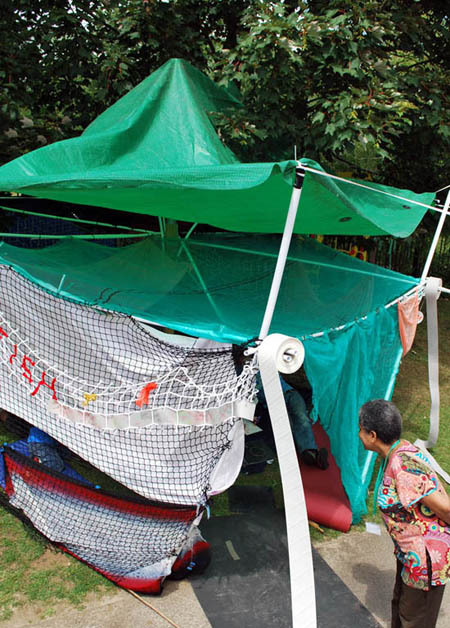 Den Building – Grandpont Children’s Centre, Oxford During a week long residency, Thinklockhart helped visitors, staff, children and parents to create three very special outdoor spaces. 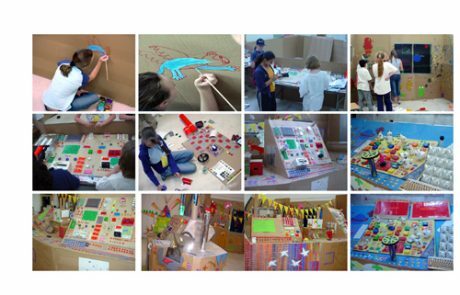 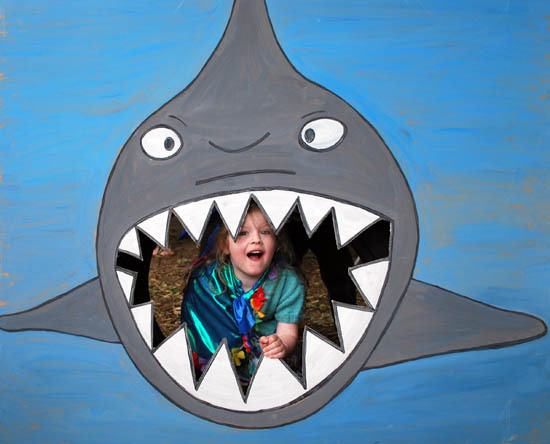 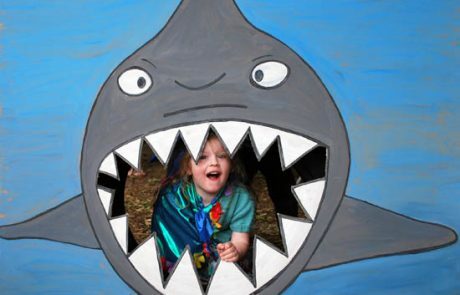 Each den was themed in order to celebrate the International Year of Communication. 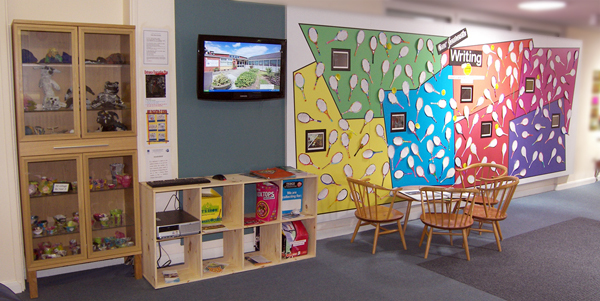 We had a storytelling, mark-making and listening den which were all connected using speakers. 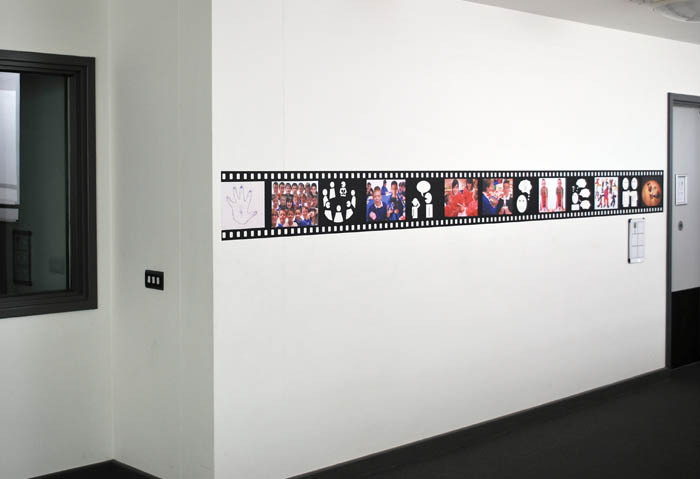 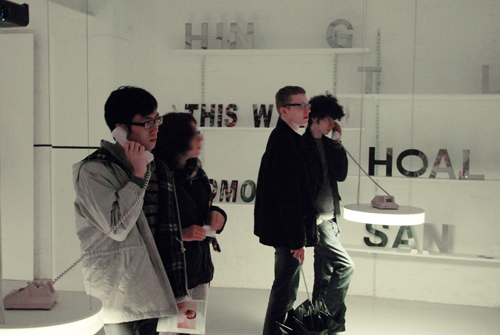 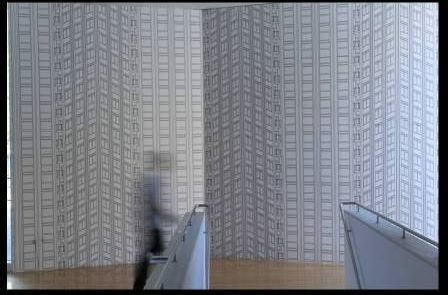 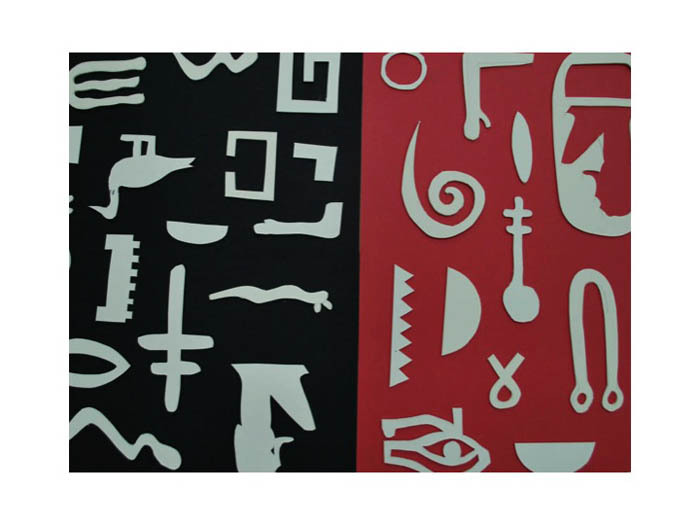 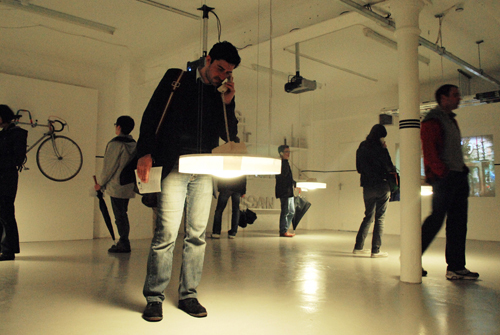 Lost in Time and Space – Modern Art Oxford An exhibition of film and installation work. 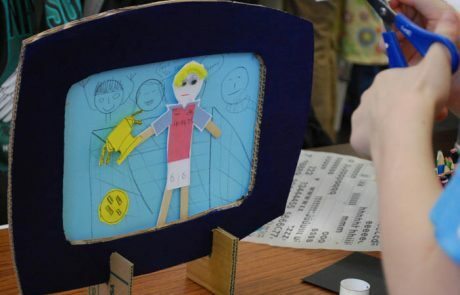 Young people from across Oxford worked collaboratively with a group of older people with dementia to create a film and installation work exploring personal histories and stories of Oxford. 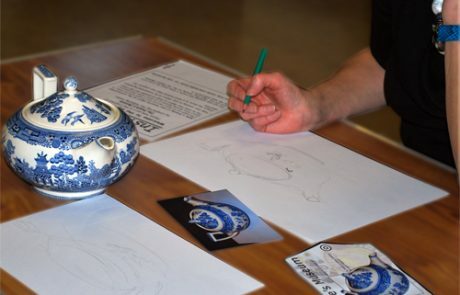 Thinklockhart worked with writer Samina Baig and filmmaker Nicola Armitage along with 20 participants with the support of the Creative Dementia Arts Network, Oxfordshire Alzheimer’s Society, Cheney School and Project Room. 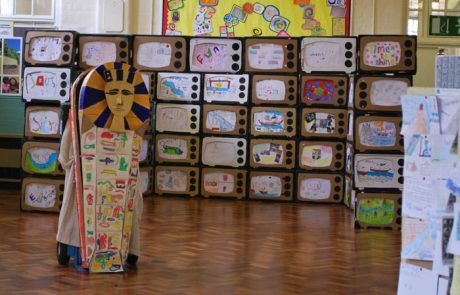 Lost in Time and Space was supported by the Big Lottery Fund’s Awards for All Scheme and Grants for the Arts, Arts Council England. 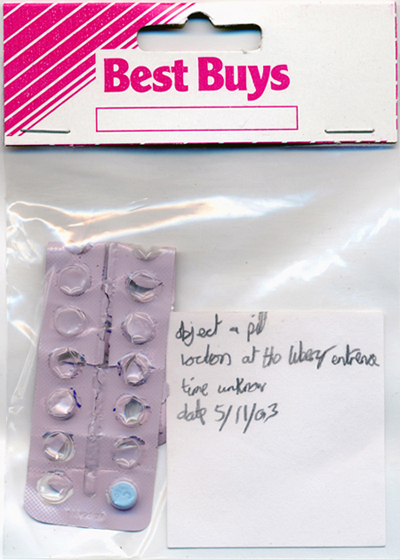 With thanks to Film Oxford, Pitt Rivers Museum and Museum of Oxford. 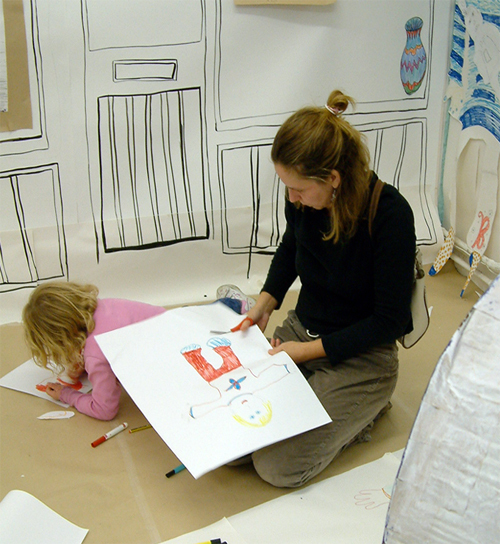 The Big Draw, Modern Art Oxford Working in the Gallery’s Education Space we worked with families of all ages to draw a new Oxford. 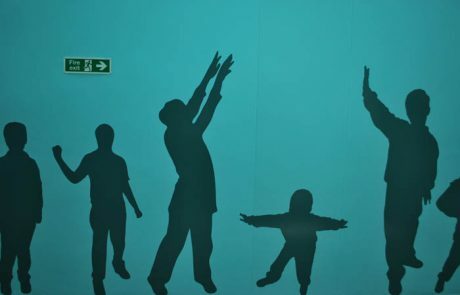 From shops, streets, parks to museums, cafes and homes, each person added something to the scene and by the end of the weekend we had created a spectacular installation that could be walked through and enjoyed by all of the visitors to the gallery. 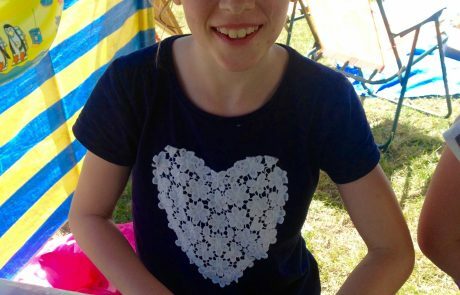 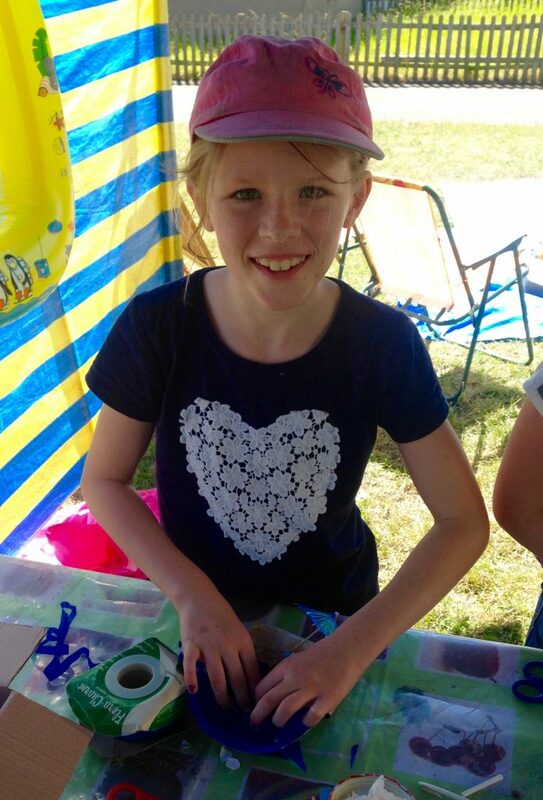 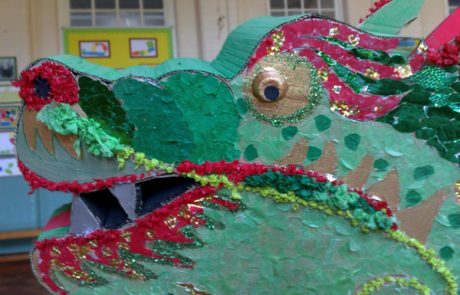 Art Summer School, Maiden Erlegh ArtsMark Gold Secondary School Thinklockhart have provided Maiden Erlegh with their feeder primary school summer school event for the past five years. 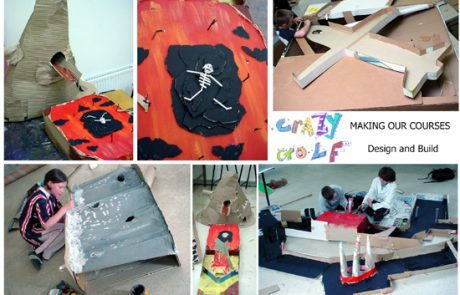 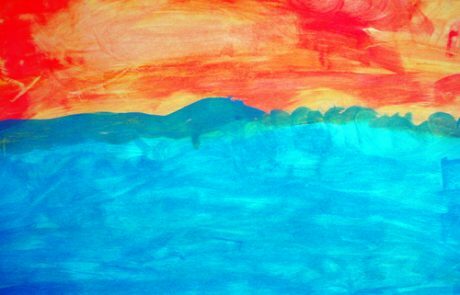 Through a wide range of activities and escapades, participants have been able to explore art in exciting, alternative and engaging ways.